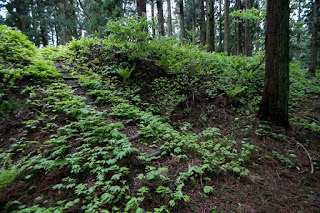 Nobesawa castle (延沢城、野辺沢城) is built at Oshiroyama mountain, one of about 100 meter height from hillside at 4 kilometer southwest from current Obanazawa city central. 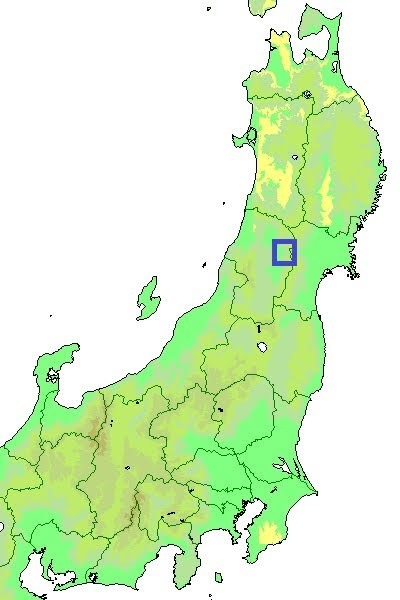 Nobesawa area is a round shaped flat area which prolongs westward from the main line of Yamagata basin spreads north and southward. 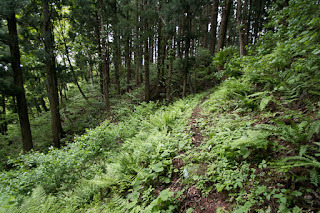 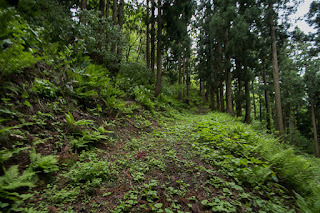 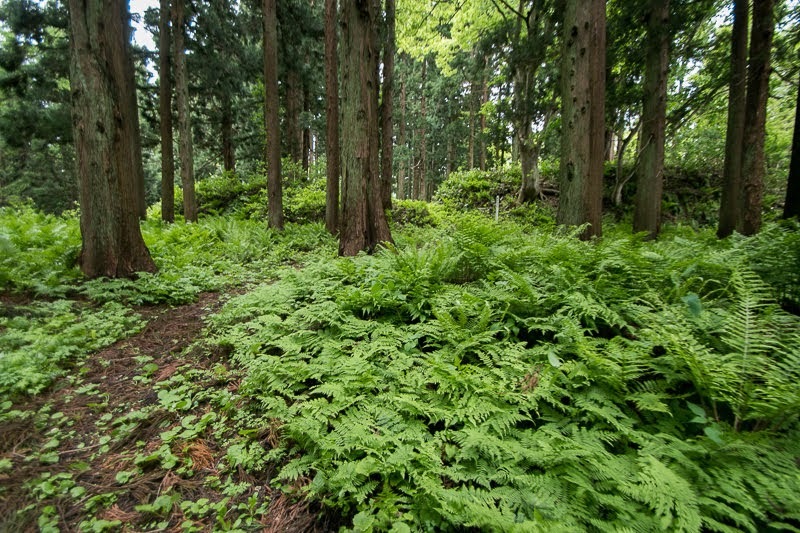 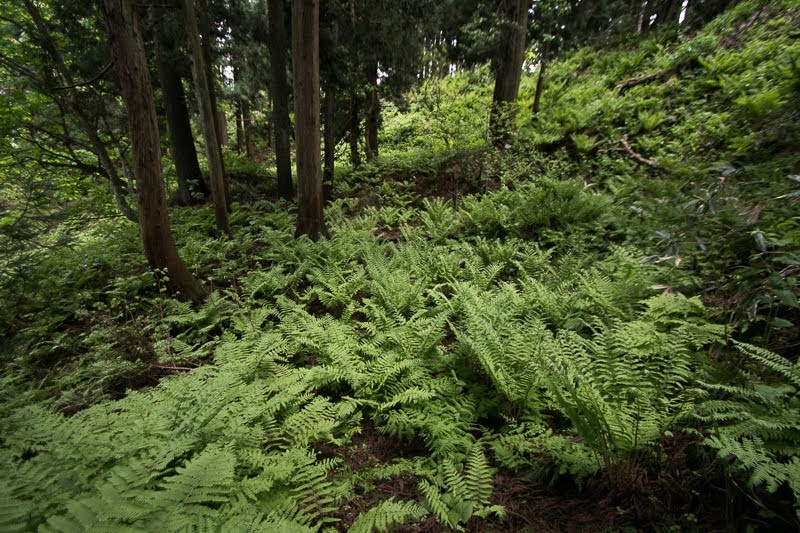 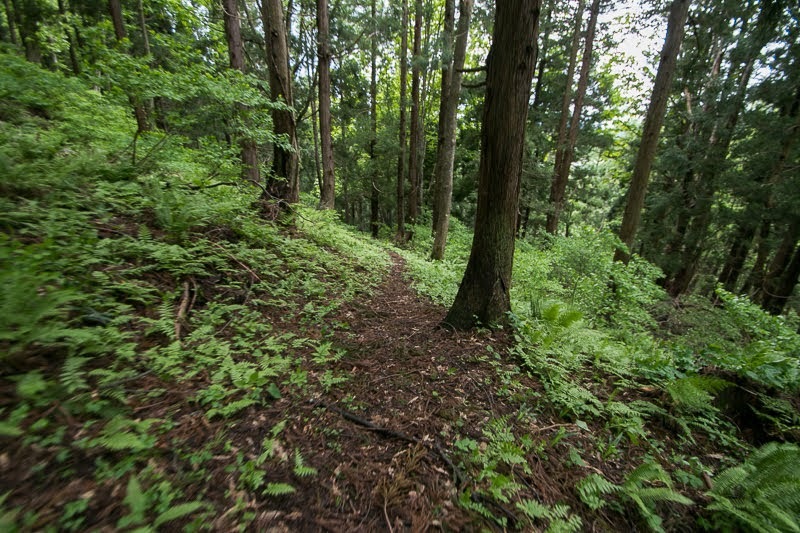 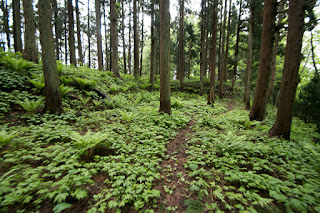 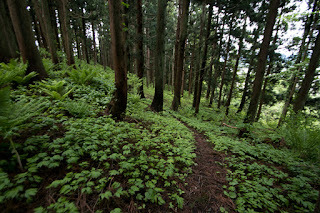 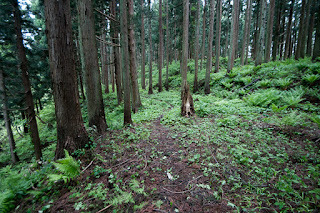 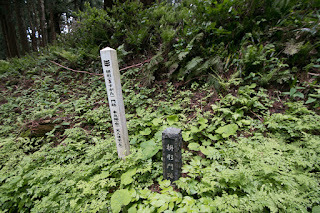 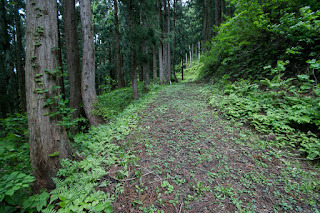 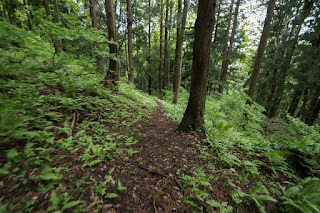 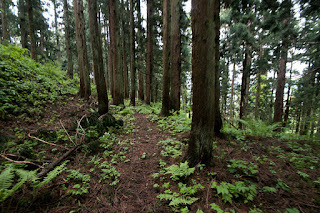 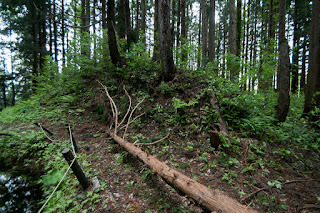 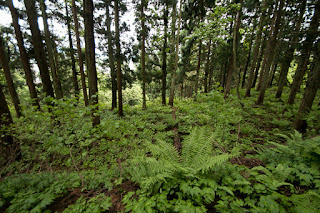 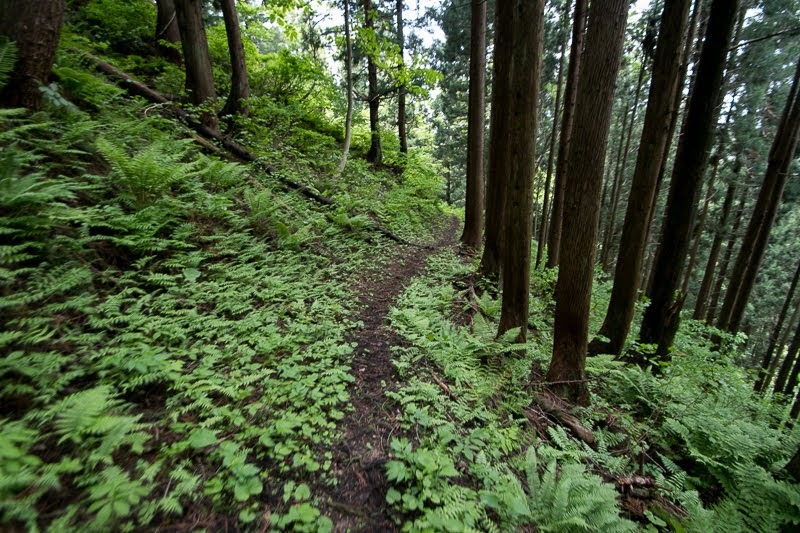 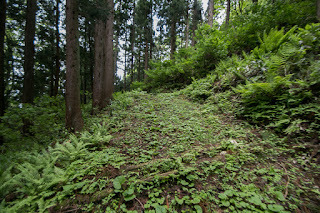 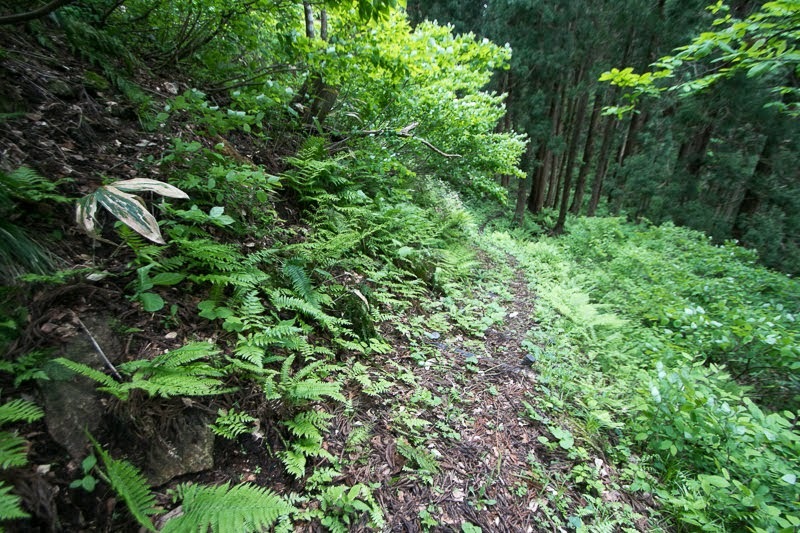 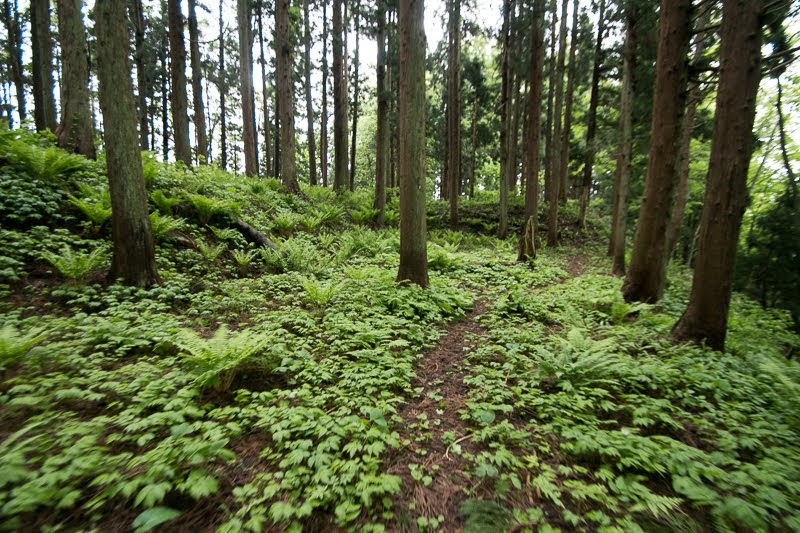 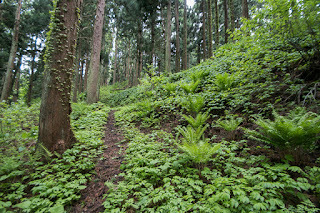 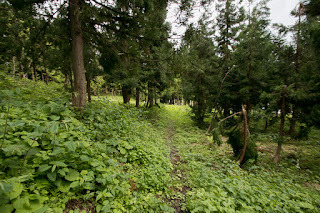 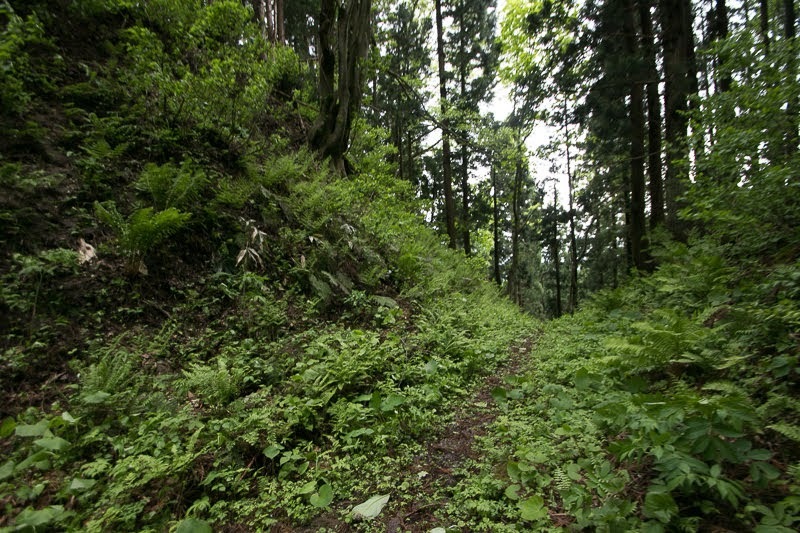 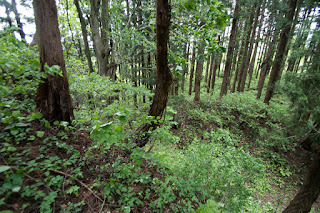 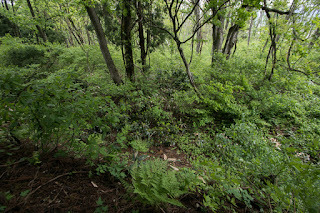 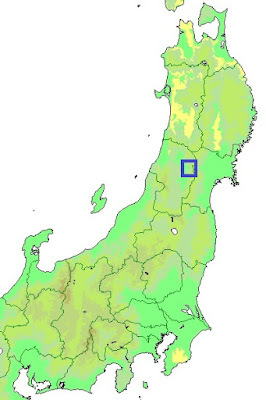 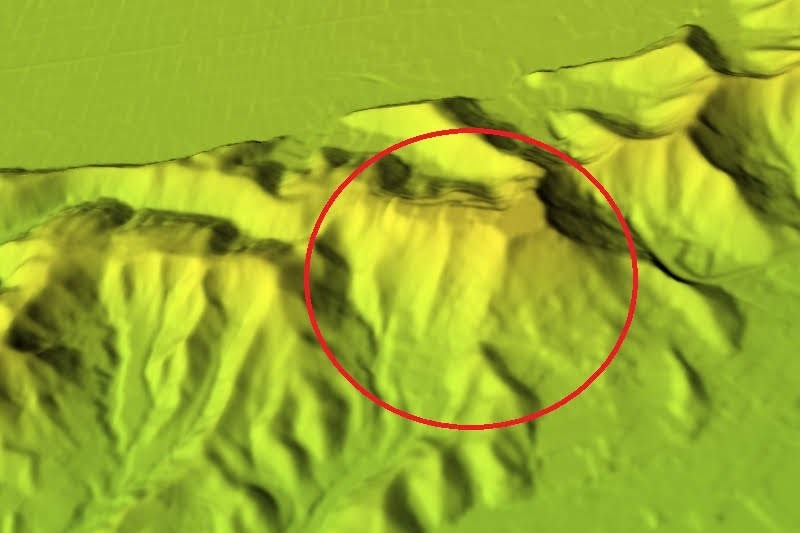 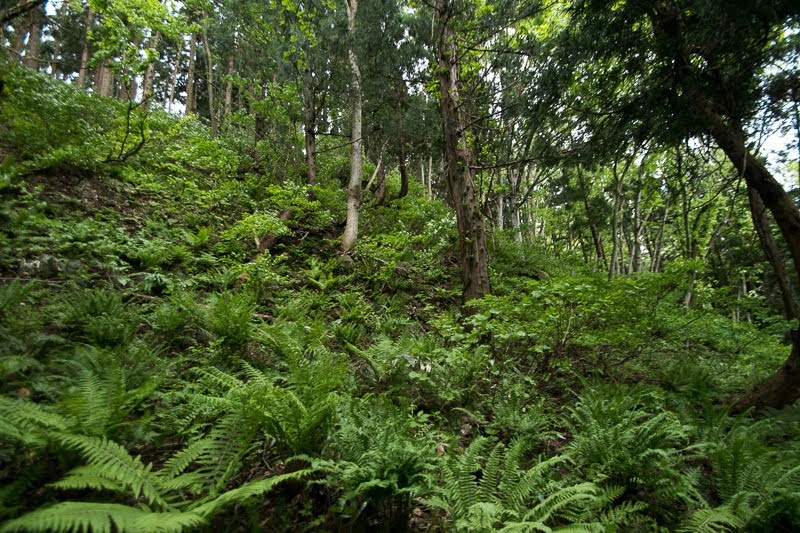 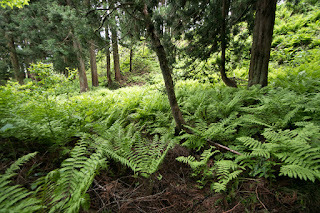 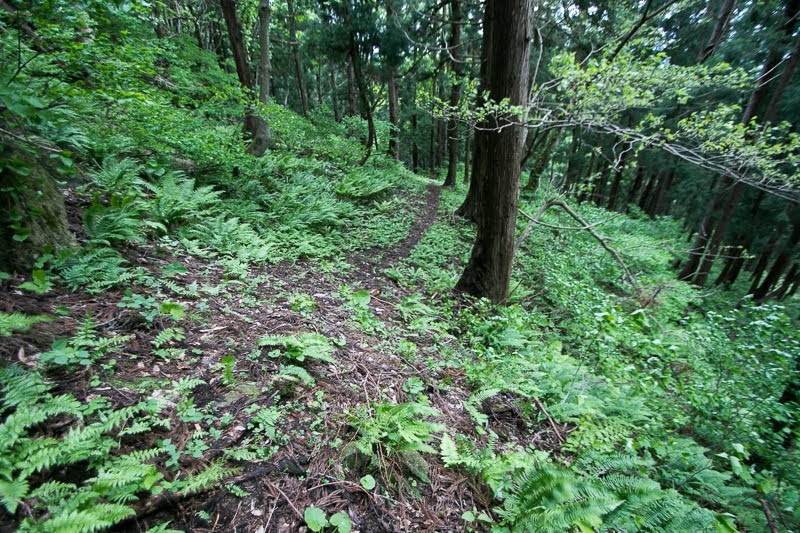 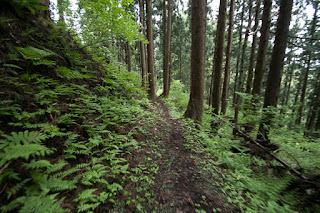 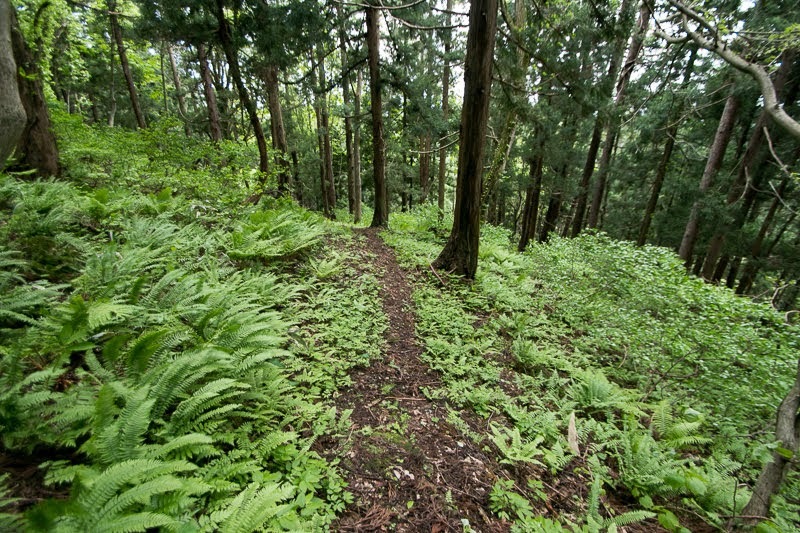 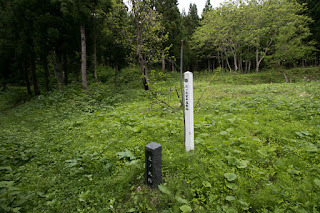 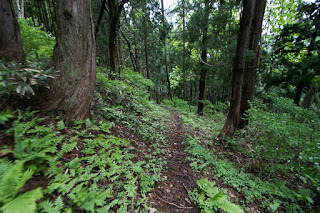 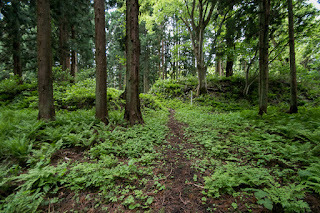 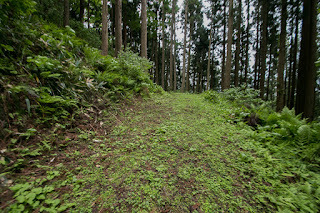 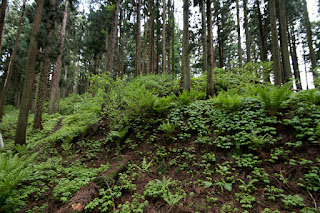 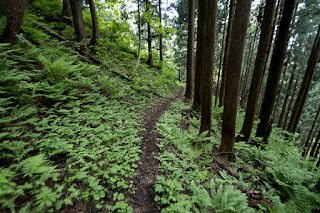 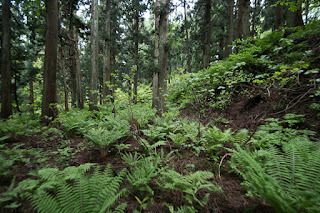 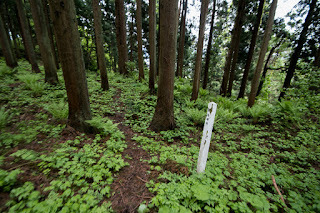 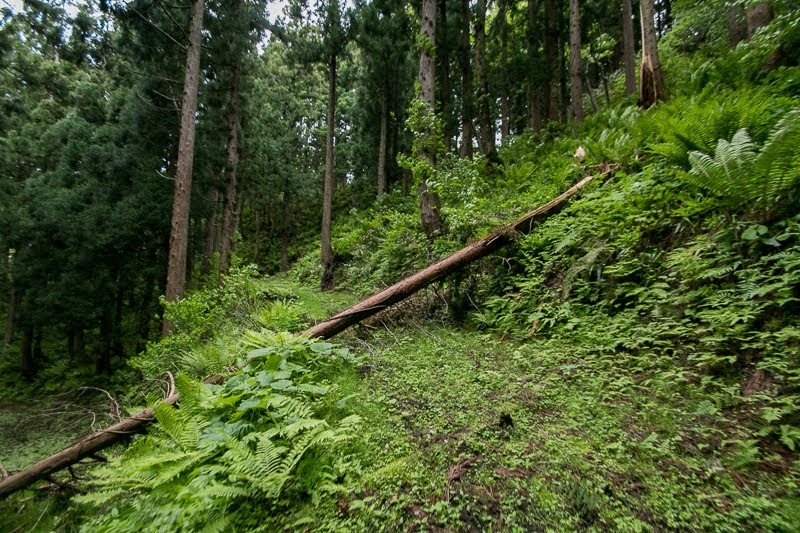 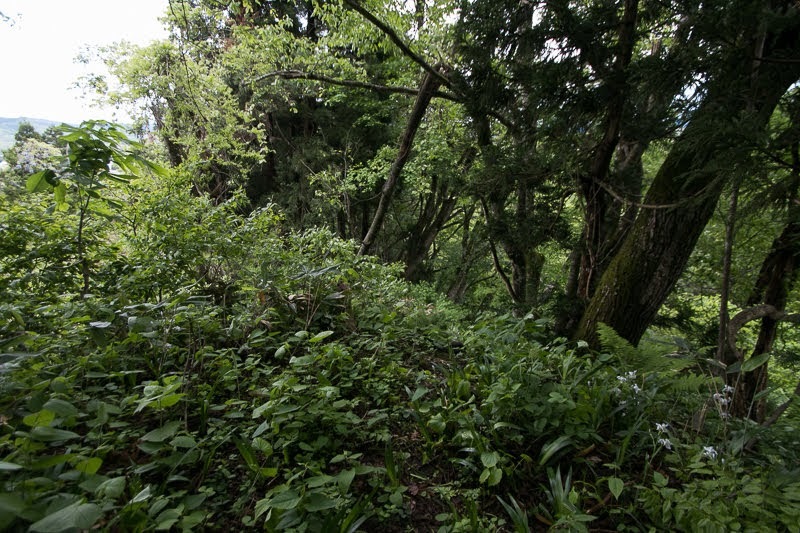 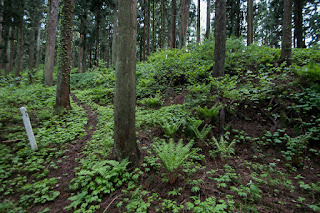 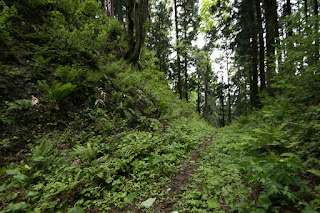 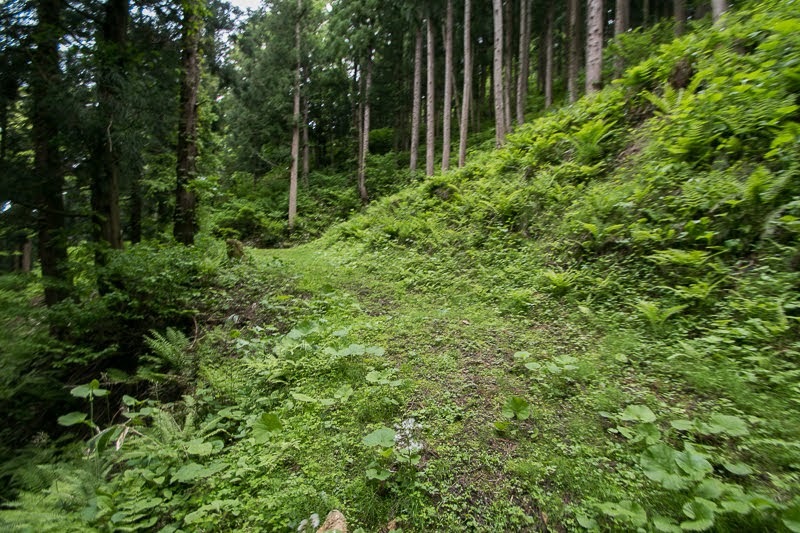 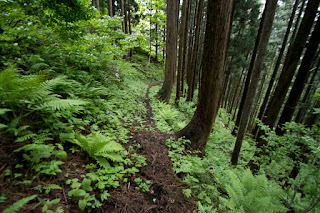 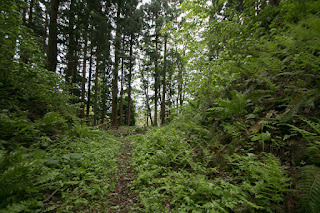 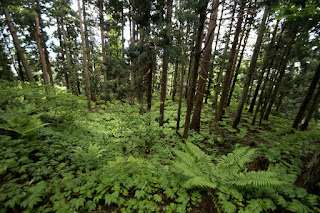 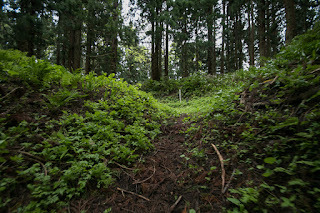 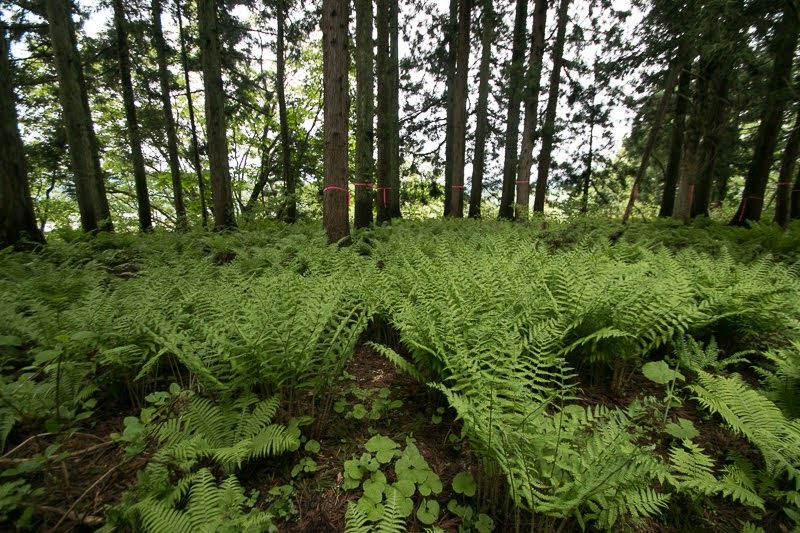 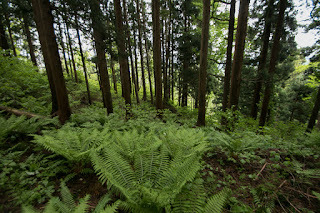 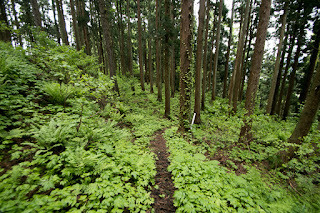 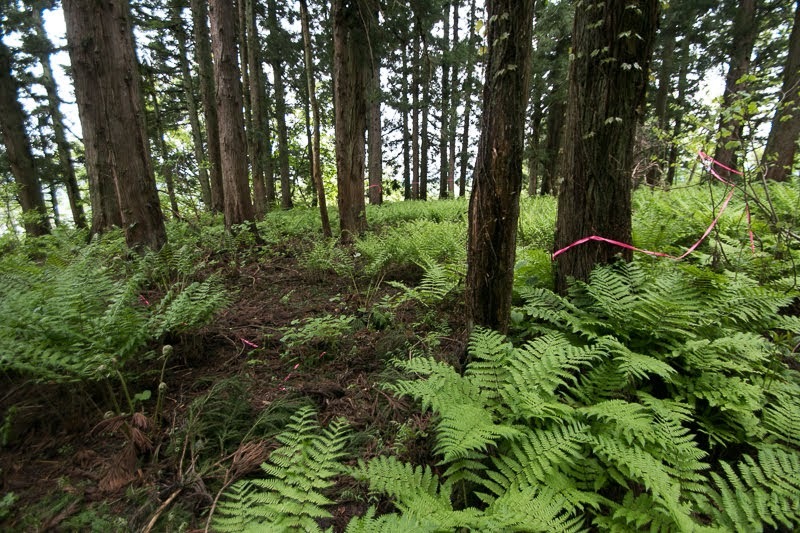 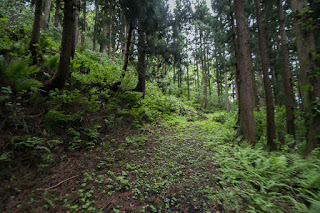 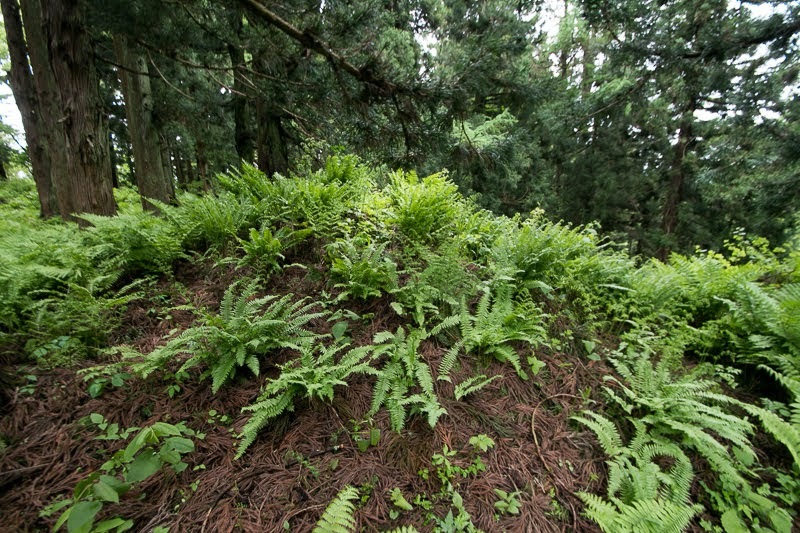 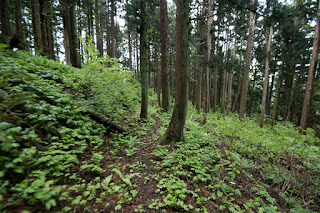 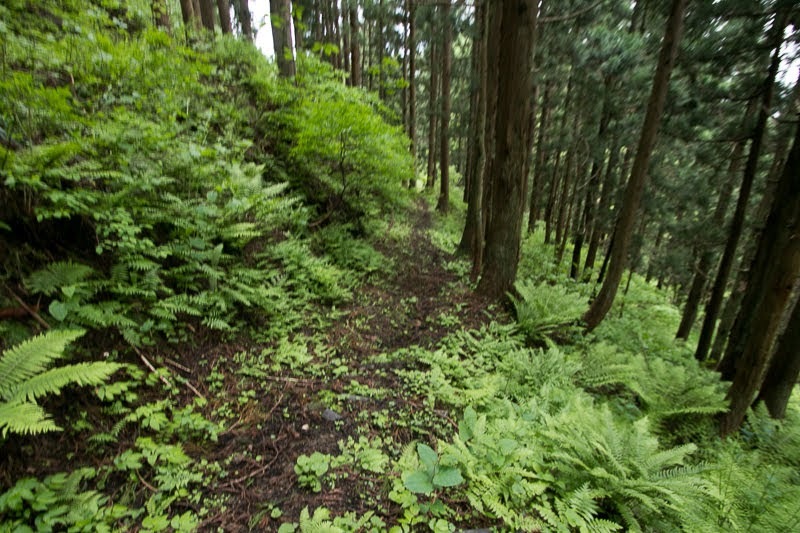 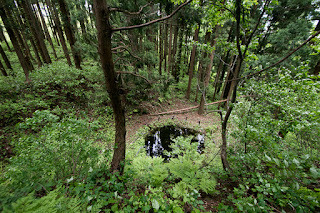 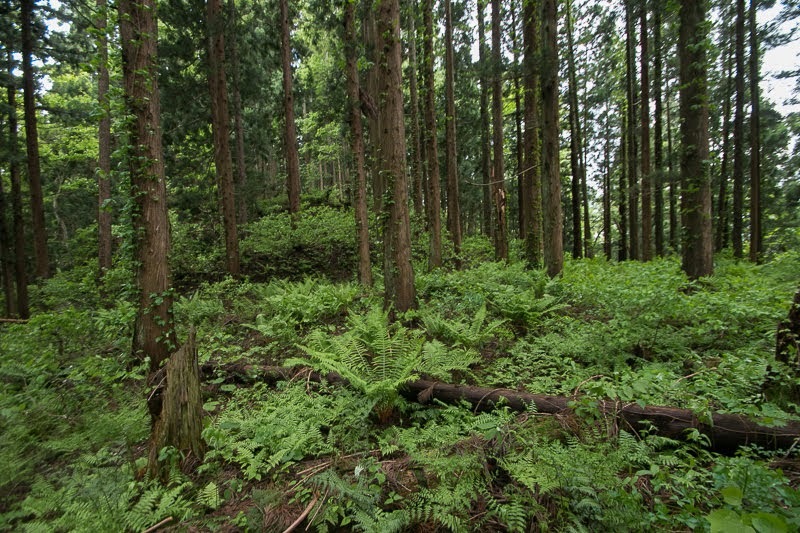 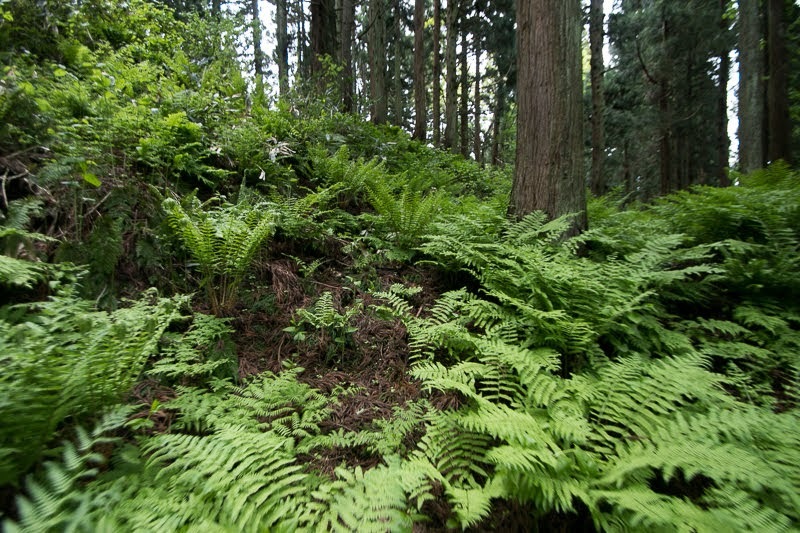 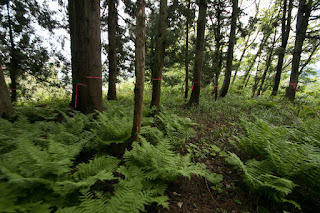 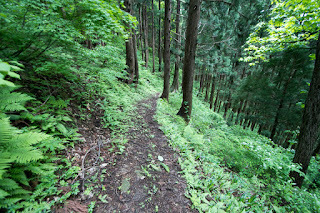 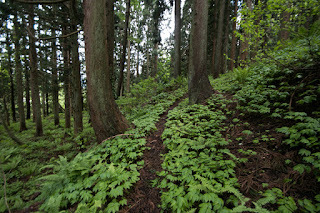 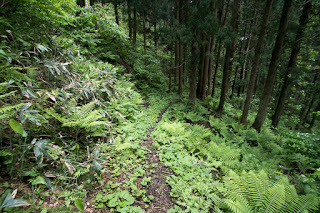 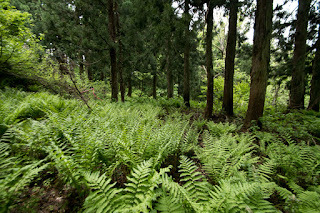 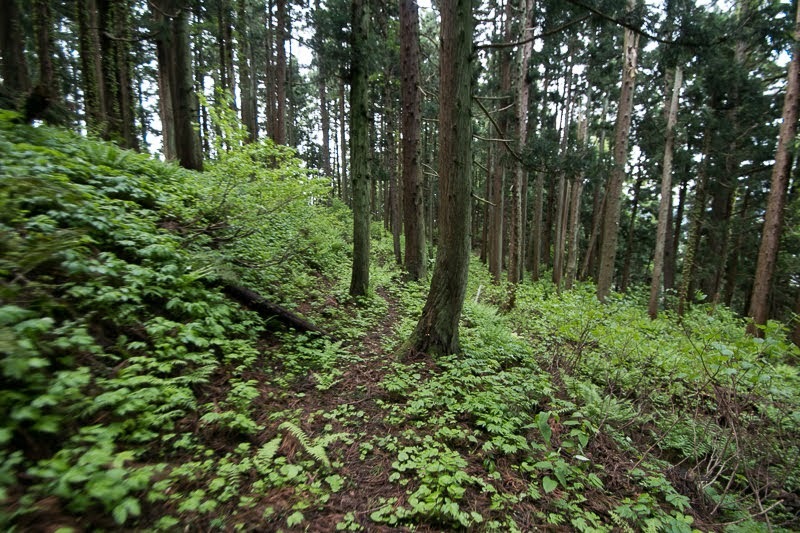 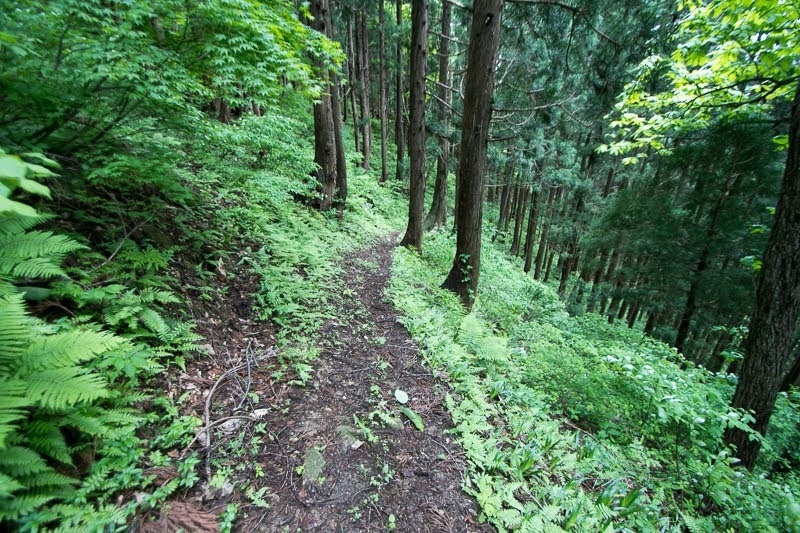 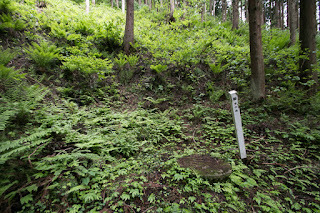 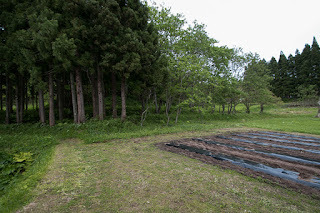 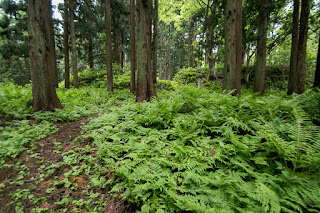 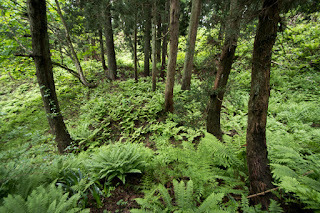 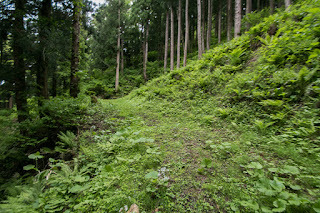 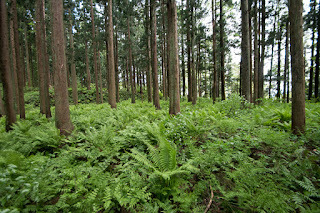 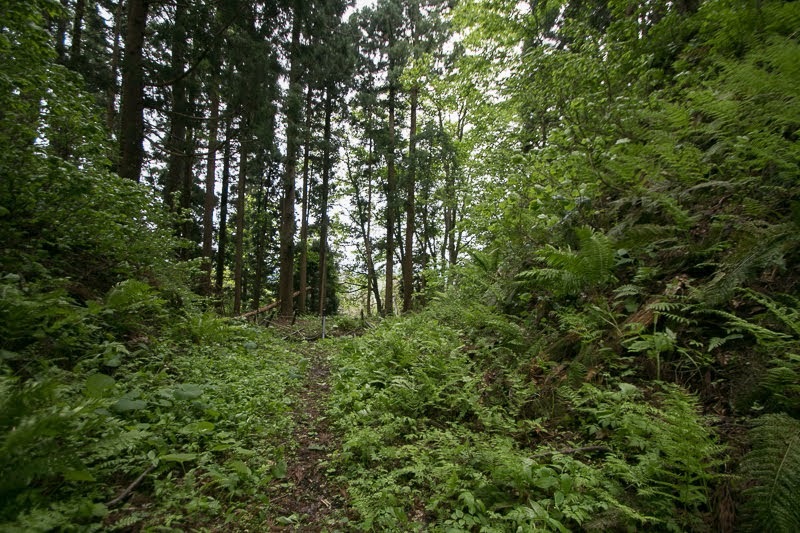 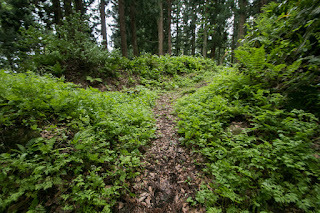 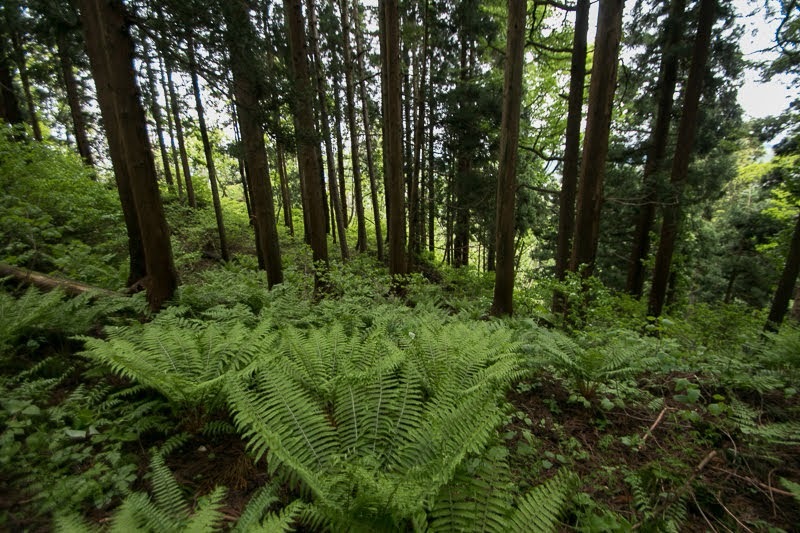 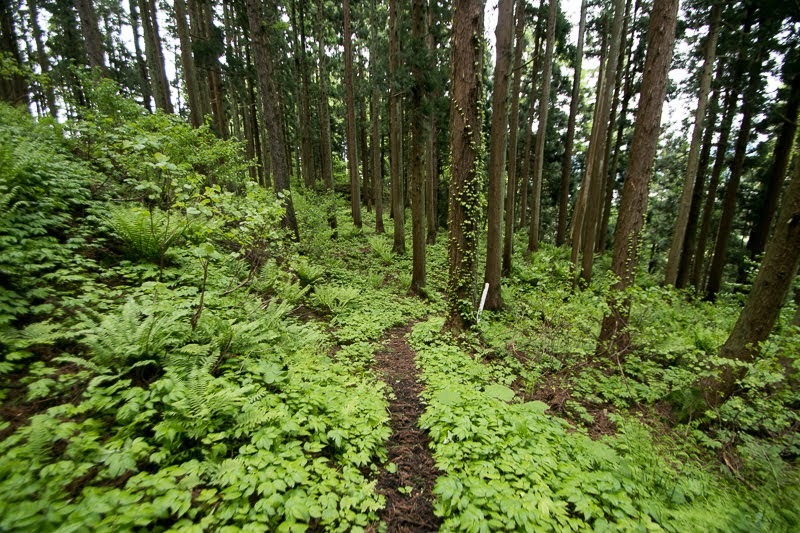 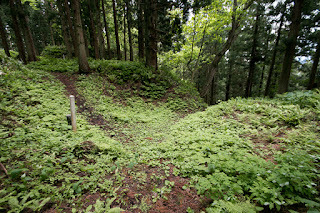 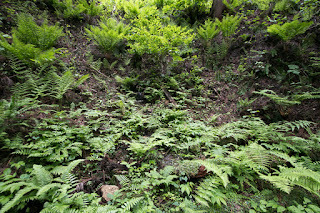 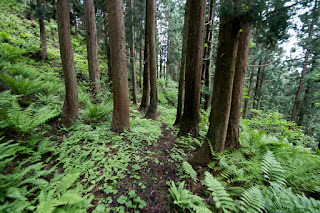 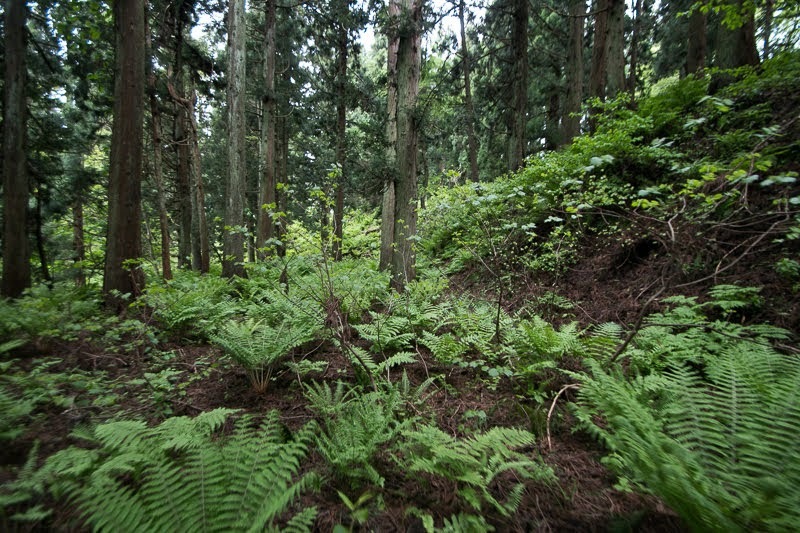 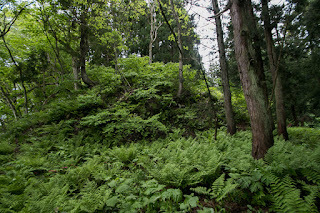 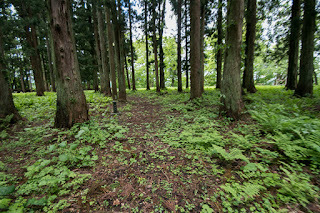 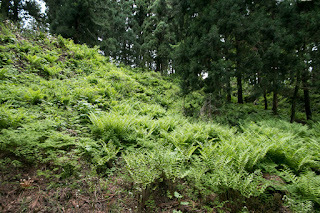 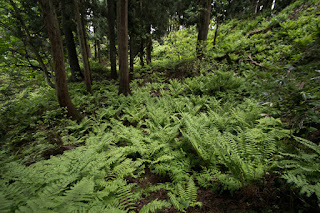 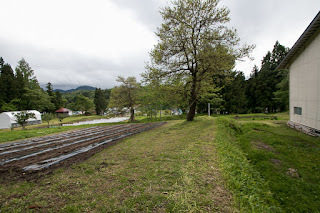 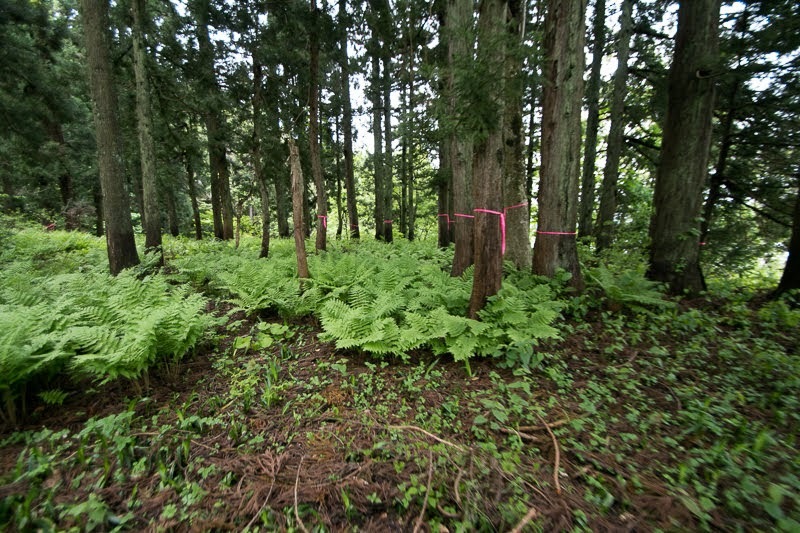 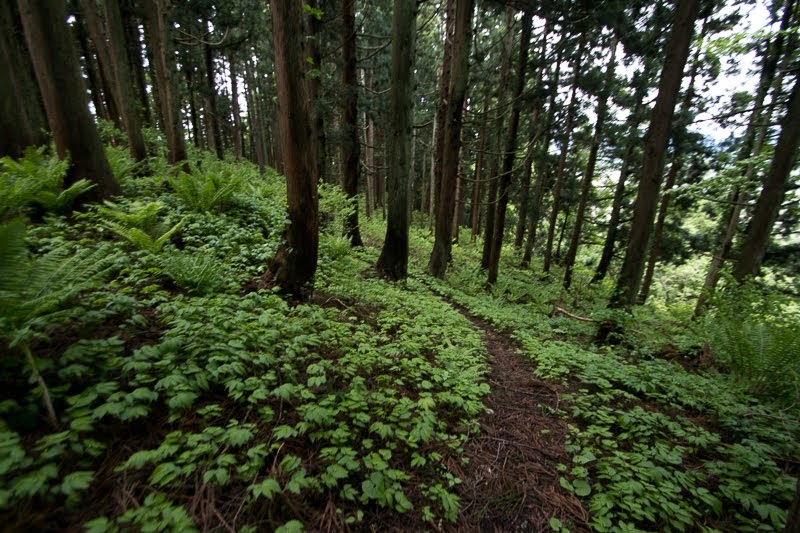 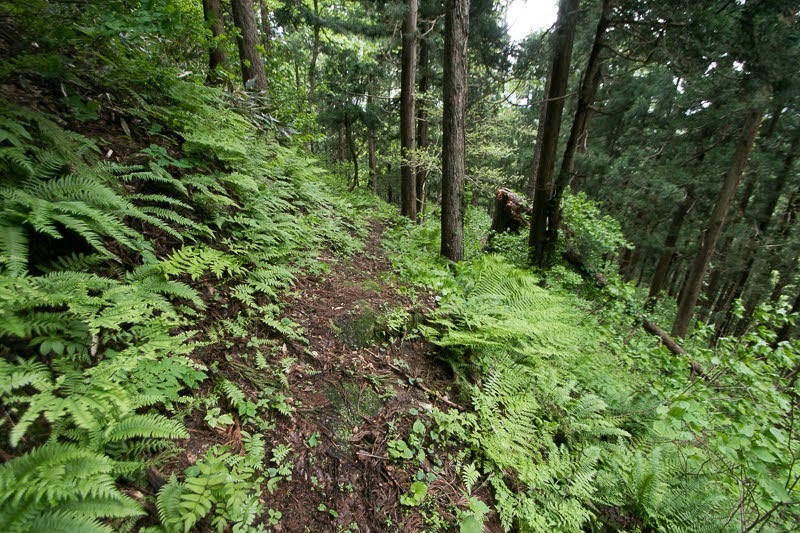 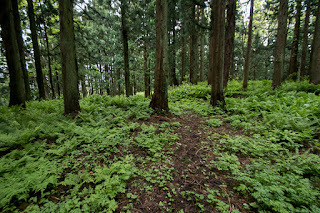 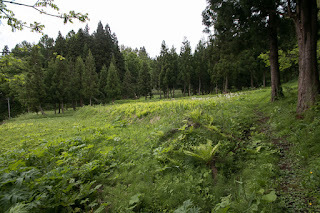 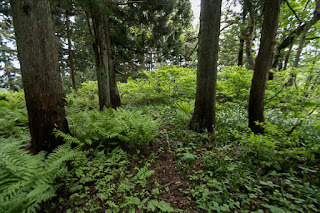 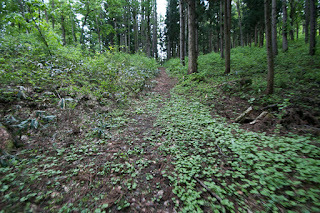 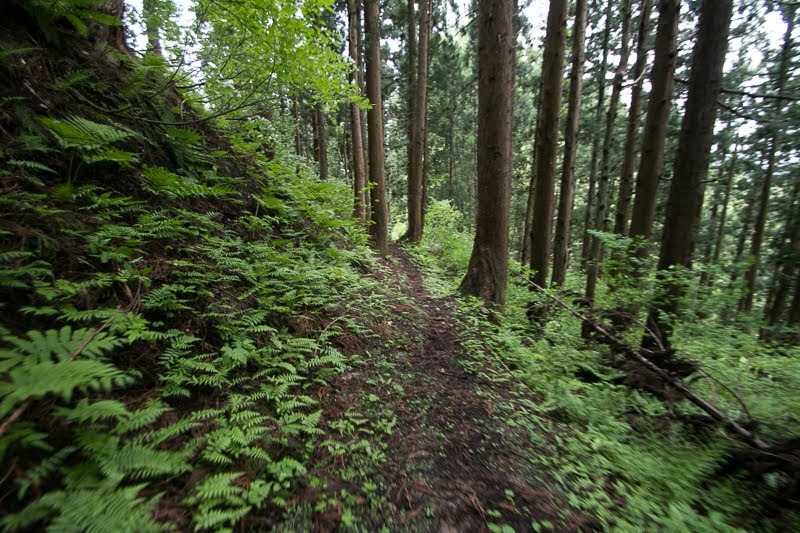 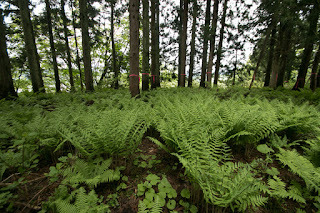 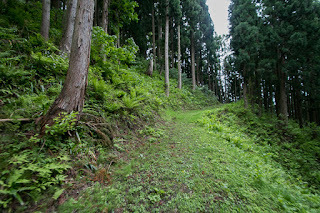 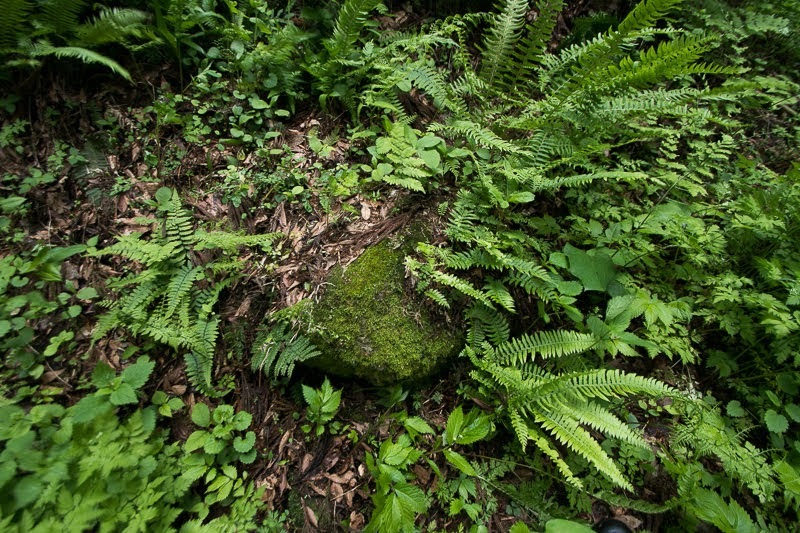 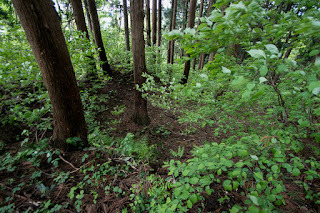 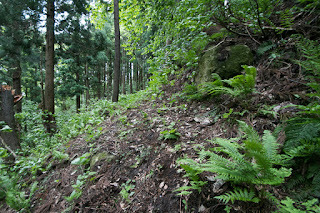 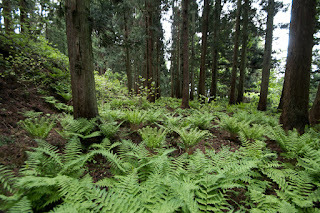 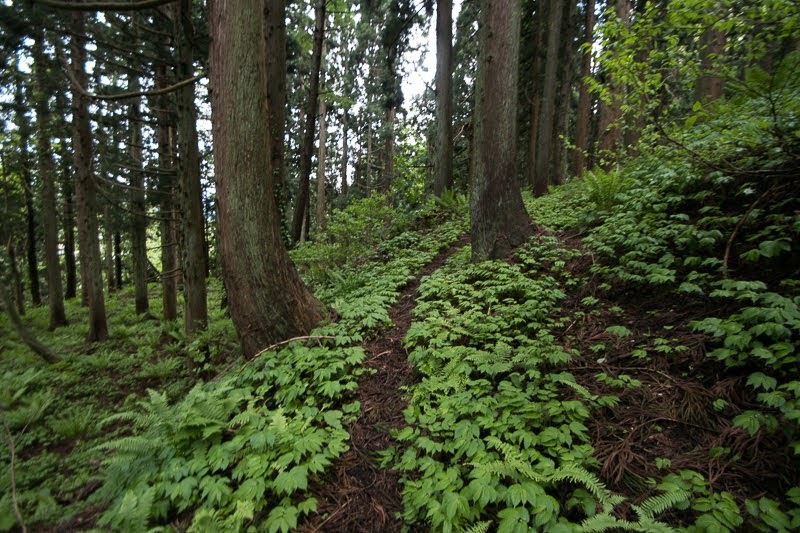 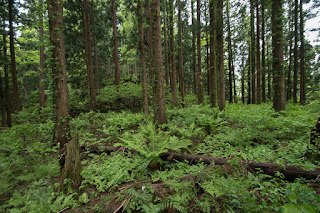 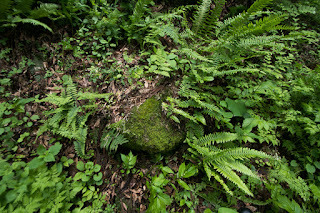 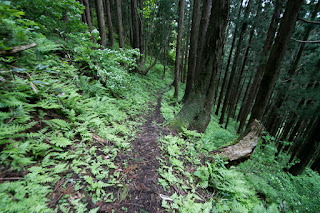 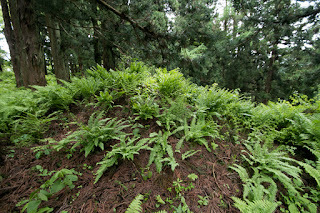 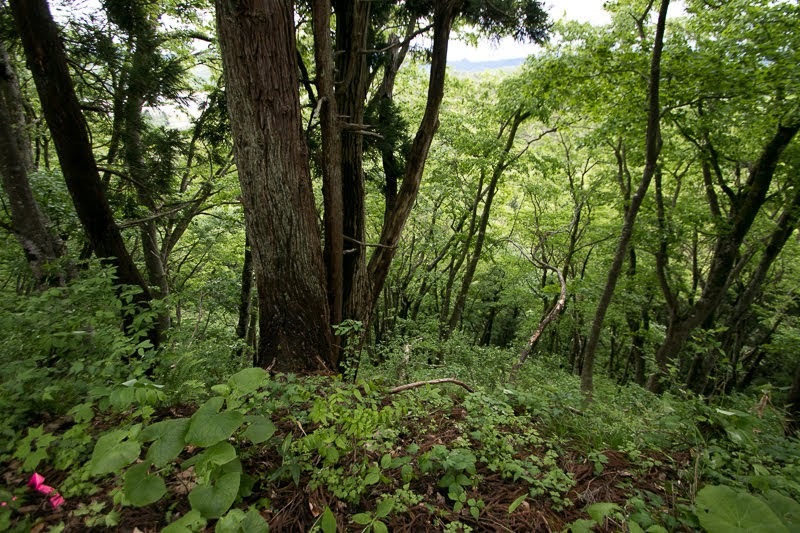 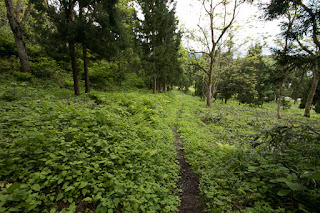 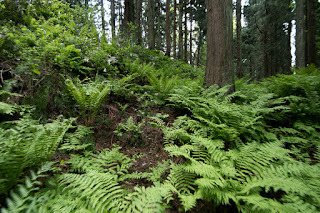 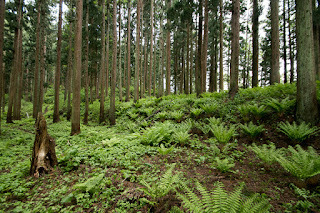 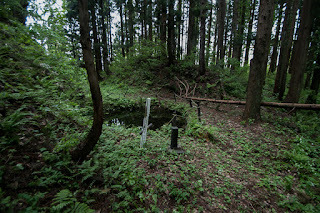 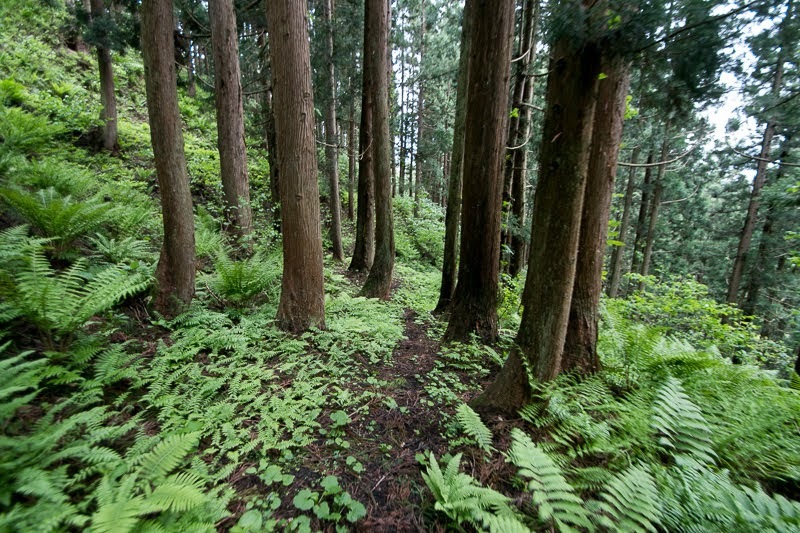 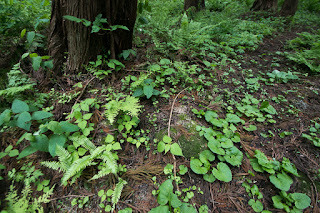 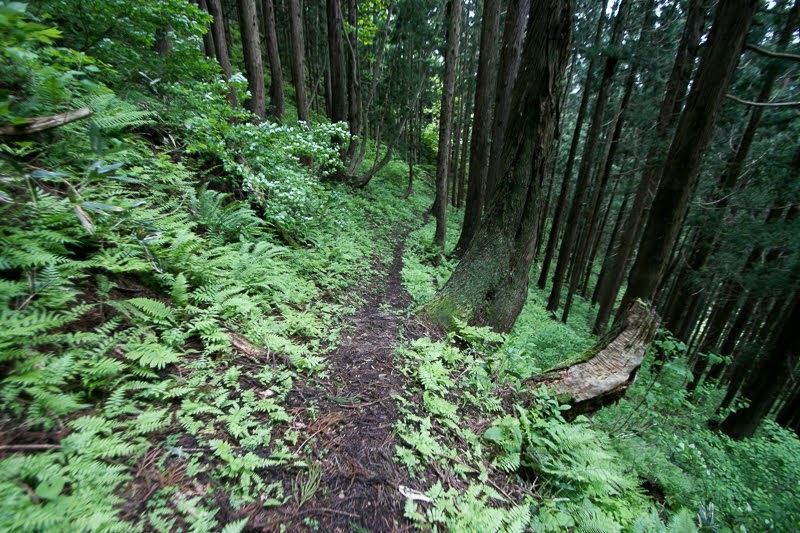 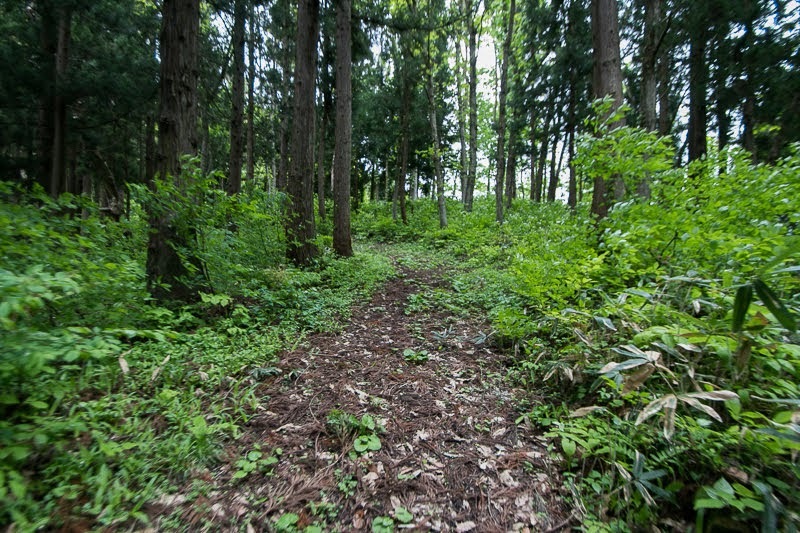 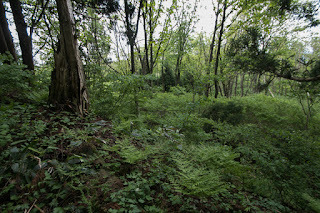 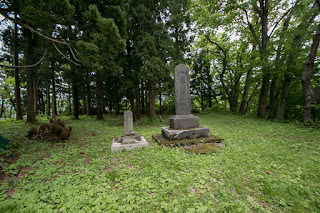 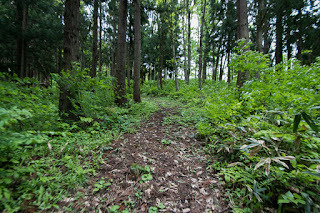 Nobesawa area is located at the center of long Yamagata basin and a narrow bottle neck, then it was an important place to connect the north half and south half of basin. 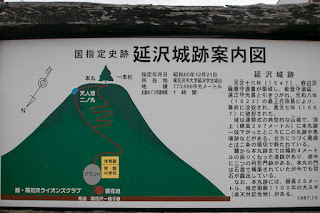 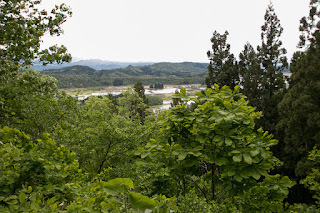 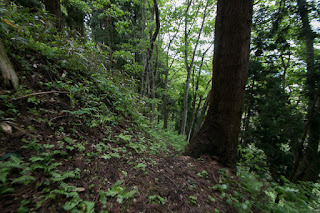 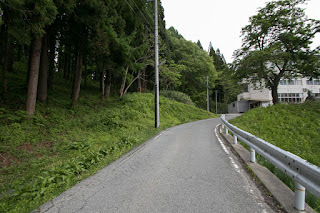 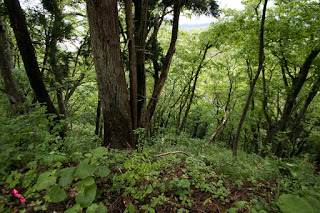 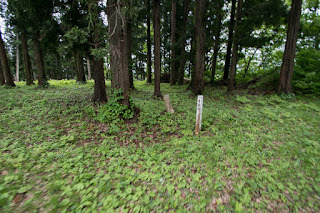 In addition to this, as the height Ou mountains which separates Tohoku region into eastern side and western side is not so high at the east of the area, thus Naka-Uzen Kaido road which cross the mountain and connects both side runs just the north of Nobesawa area. 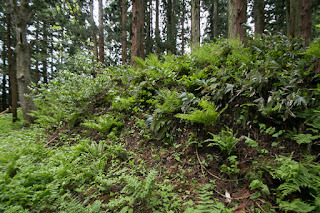 Nobesawa castle is a considerably newly built castle completed in 1547 by local lord Nobesawa clan. Nobesawa clan was a tributary of Mogami clan, a descendant of Shiba clan which was a high class retainer of Muromachi Shoguhate, and diverged from Mogami clan at early period. 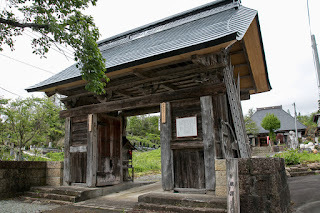 Because of its origin Mogami clan was nominated as Ushu-Tandai, the commander of western half of Tohoku region by Muromachi Shogunate. But as Mogami clan was too much diverged into branch families, continuous internal conflict significantly weakened the power and authority of main family along with the conflict with Date clan rising at Yonezawa area. 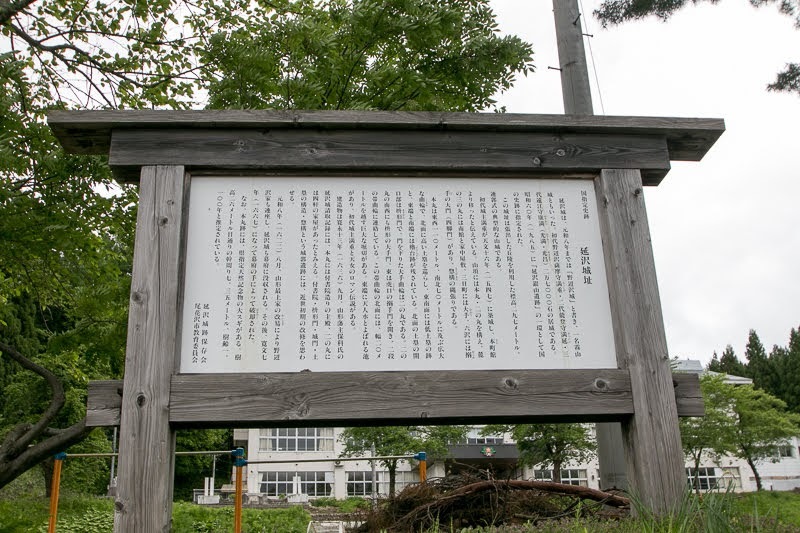 At the beginning of 16th century, Mogami clan was once almost ruined by Date clan, but resistance of the ally of local lords lead by Tendo clan, another branch family of Mogami clan, Date clan once retreated from Yamagata basin and Mogami clan gained independence. 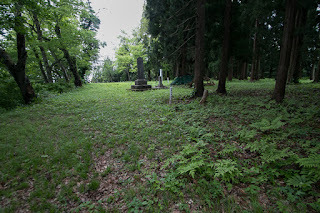 But these local lords called as Mogami Hatitate which mean eight families of Mogami clan, exceeded the main family. 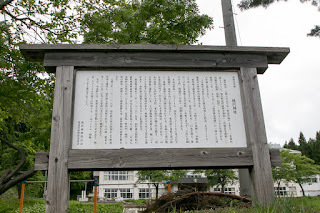 Around 1570, Yoshiaki Mogami (1544-1614), the new leader of Mogami clan who won the internal conflict against his father, raised his army to restore the authority of Mogami clan. 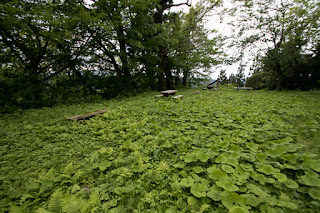 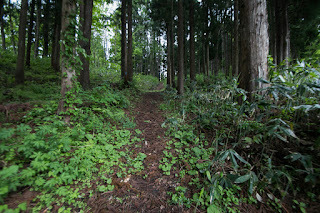 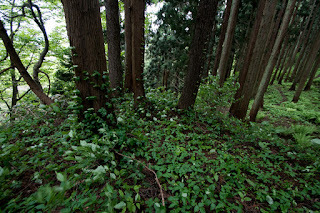 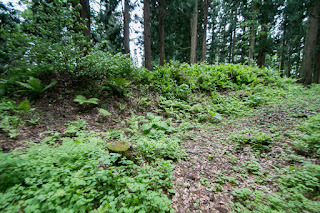 But just at the north of Yamagata area which was the territory of Mogami clan, Tendo clan which was the leader of local lords stayed at secure Tendo castle. 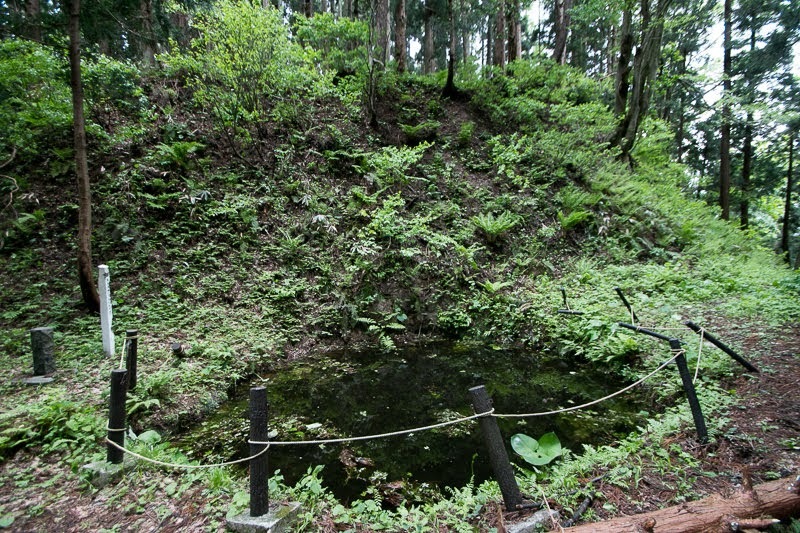 Yoshiaki Mogami directly attacked Tendo castle but failed, then tried to weaken the power of Tendo clan by tempting or ruining other local lords supported Tendo clan. 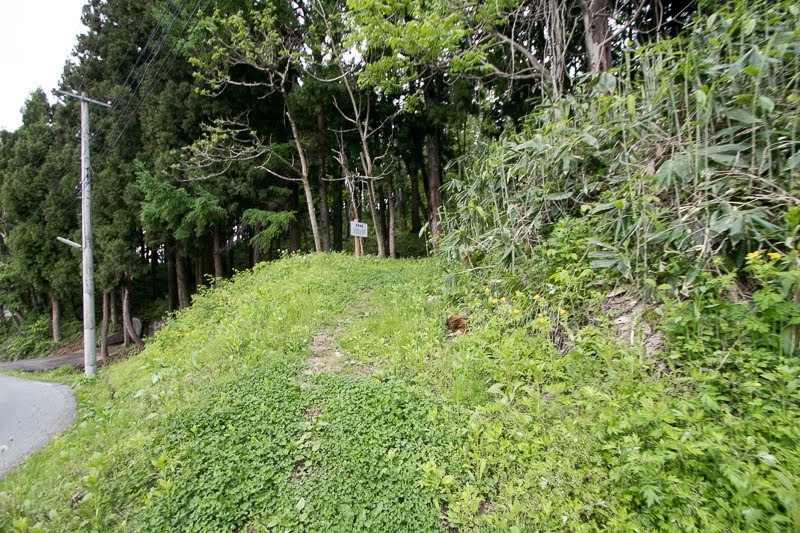 Yoshiaki ruined Hosokawa clan at Oguni castle and Sagae clan at Sagae castle, and turned Sakanobe clan which was the retainer of Onodera clan at Yokote basin. 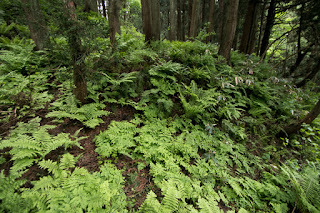 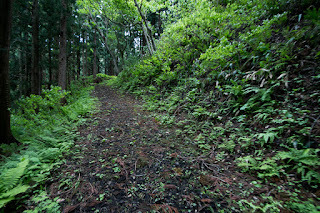 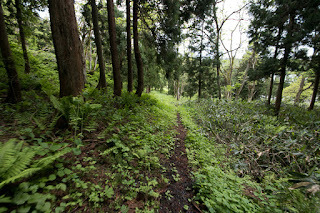 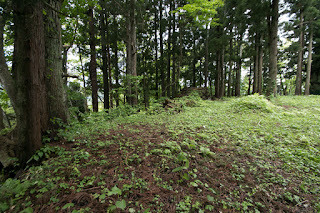 After these process Yoshiaki again attacked Tendo castle in 1584. 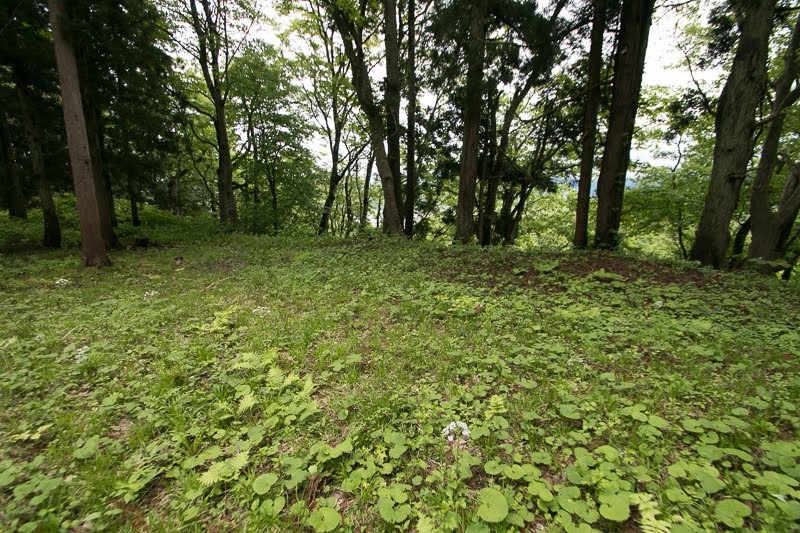 But before the brave fight of Mitsunobu Nobesawa (1544-1591), the leader of Nobesawa clan, Yoshiaki could not fall Tendo castle again. Mitsunobu was known as his Herculean strength, and there is a tale that he brought heavy bell of the temple only by himself, and there are several bells with the tale of movement by Mitsunobu. 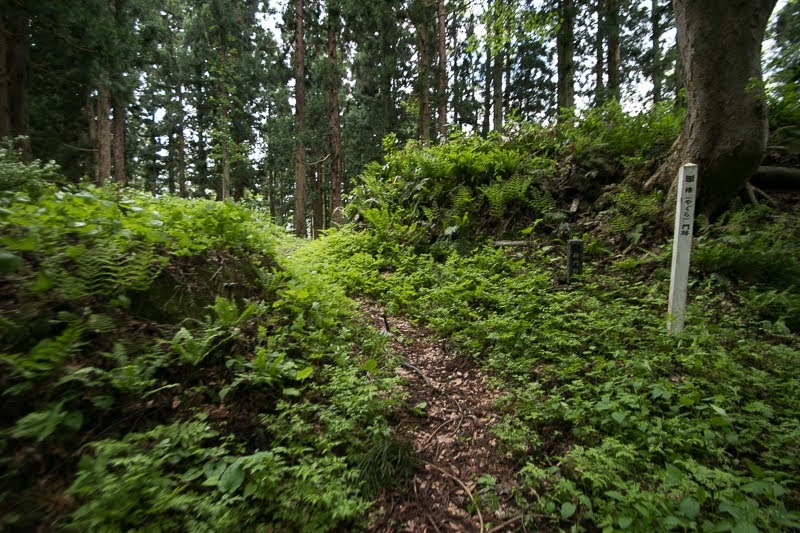 At the battle of Tendo castle, looking at the inferior situation of his side, Mitsunobu rushed into the enemy and beat the enemy by heavy steel rod and killed enemy commander. 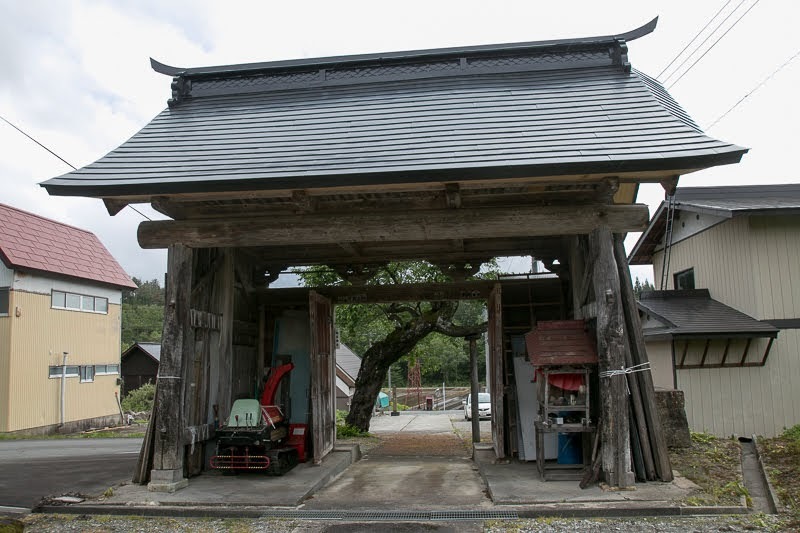 Looking at the strength of Mitsunobu. 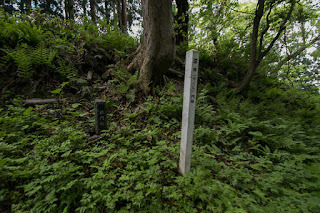 Yoshiaki who was also known as physical strength and used iron rod as a weapon had an interest then hoped to make a duel. 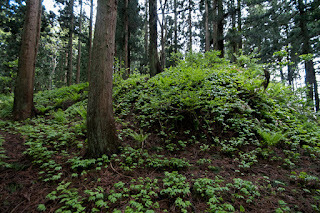 It is also told that one day Yoshiaki ambushed with his strong retainers to kidnap Mitsunobu, but Mitsunobu threw all retainers of Yoshiaki then Yoshiaki snatched to cherry blossom tree not to be thrown. 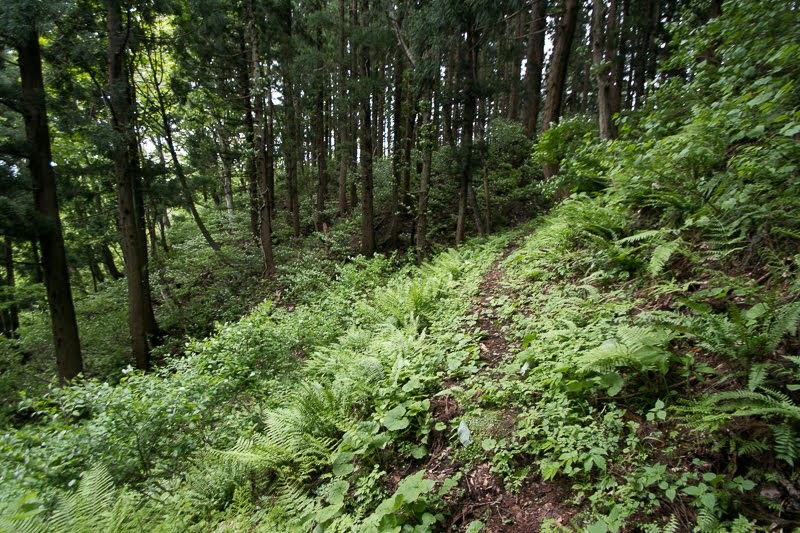 But looking at this, Mitsunobu pulled out of the tree itself with Yoshiaki and threw. 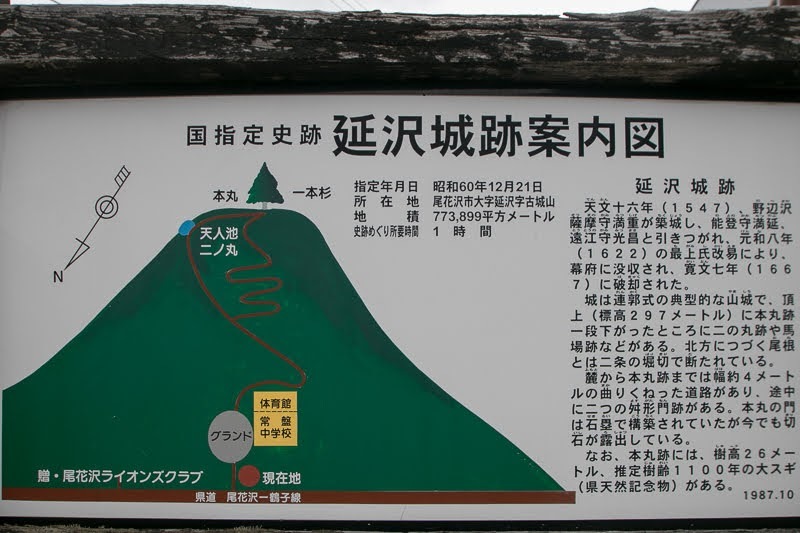 Anyway Mitsubobu was physically strong, and also financially strong because of Nobesawa silver mine found at his territory at the end of 15th century. 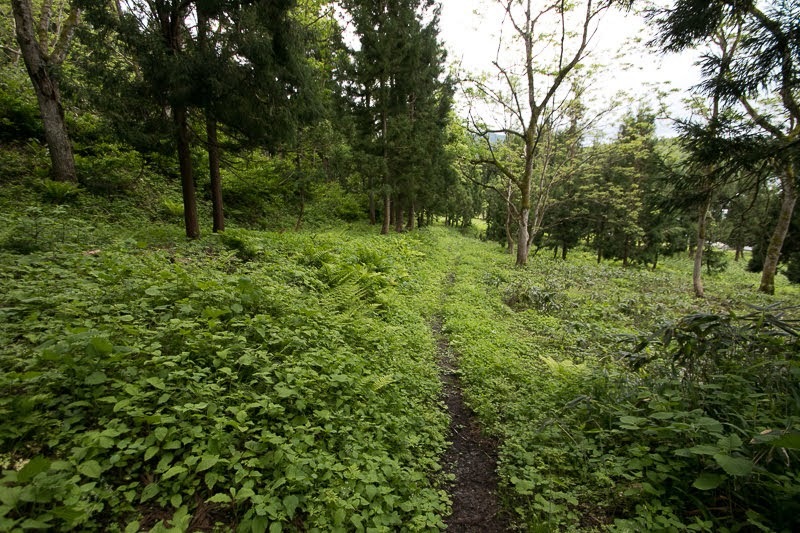 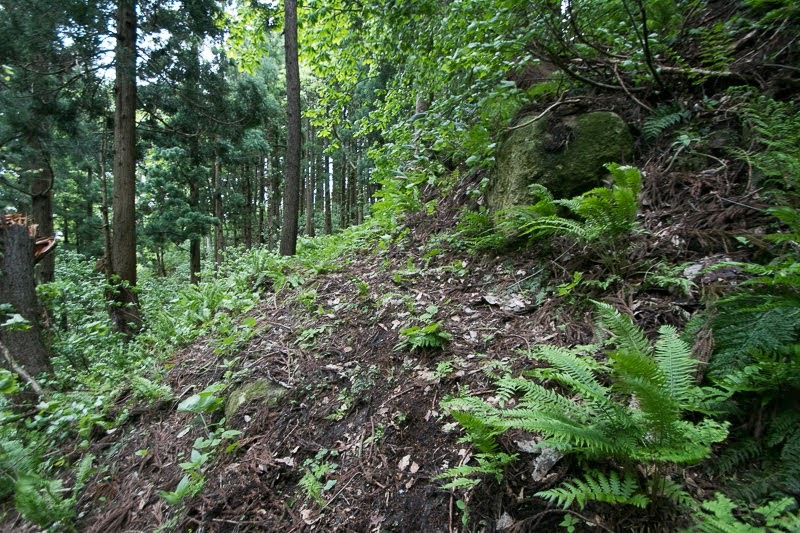 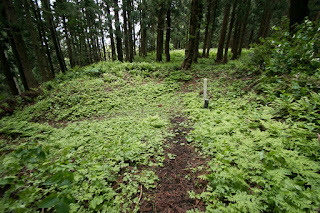 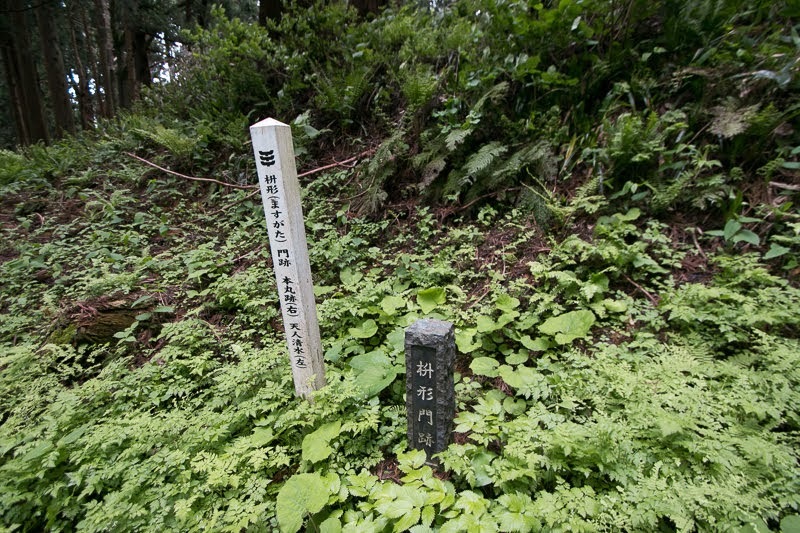 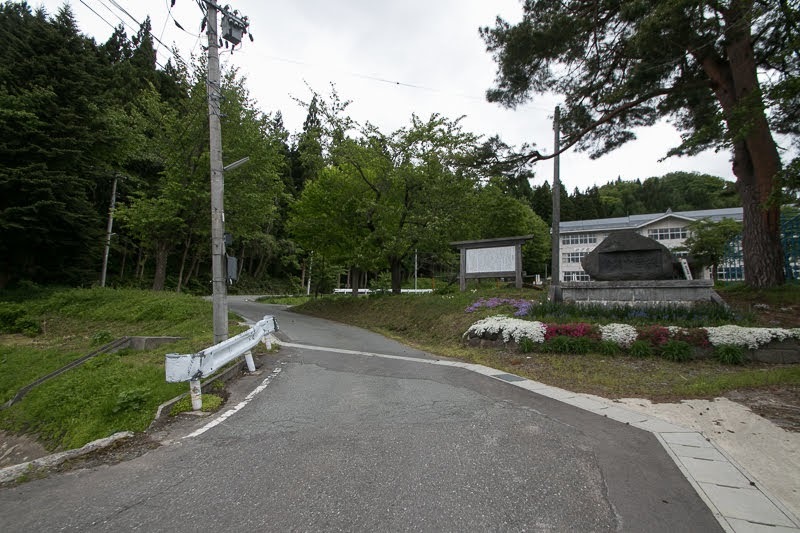 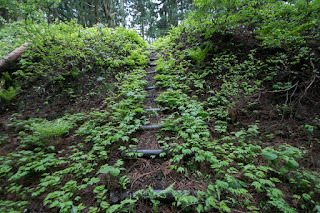 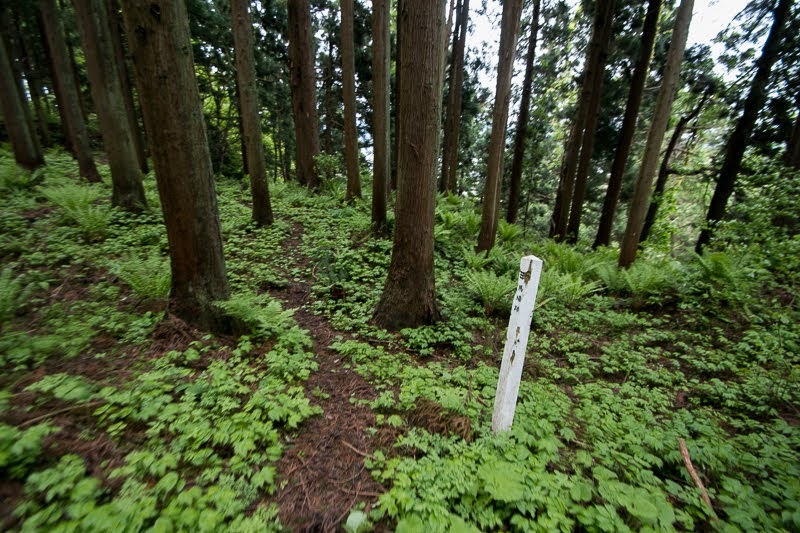 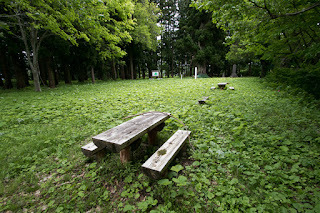 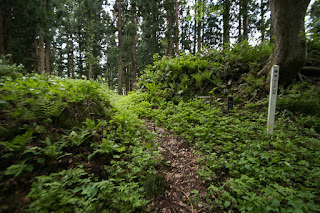 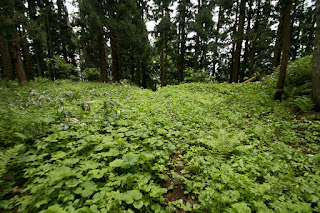 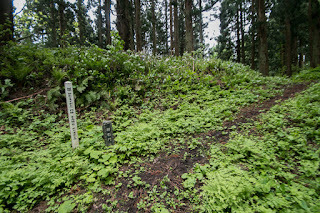 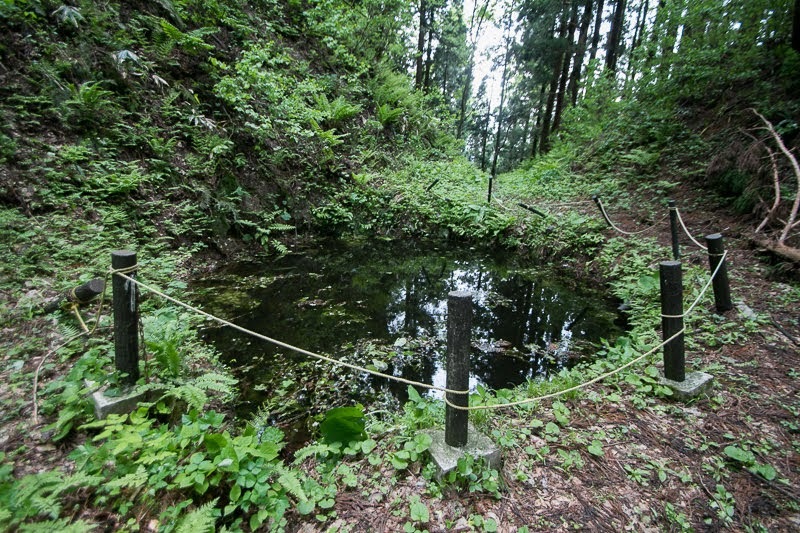 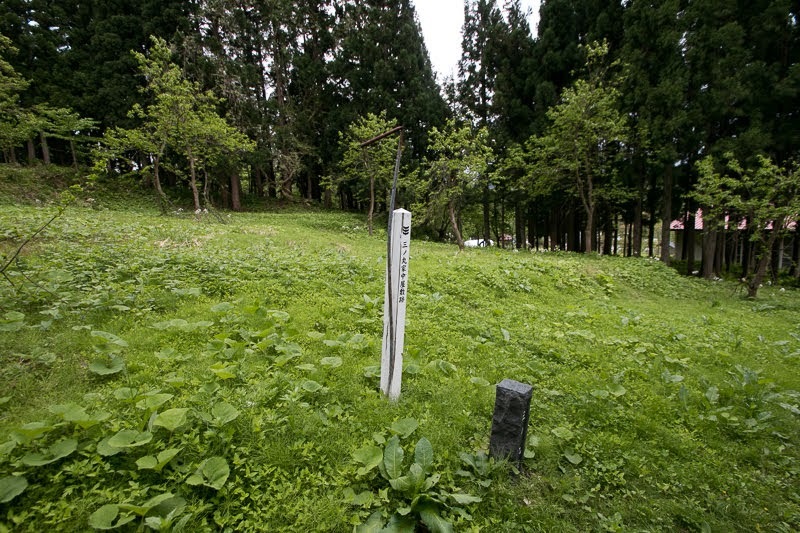 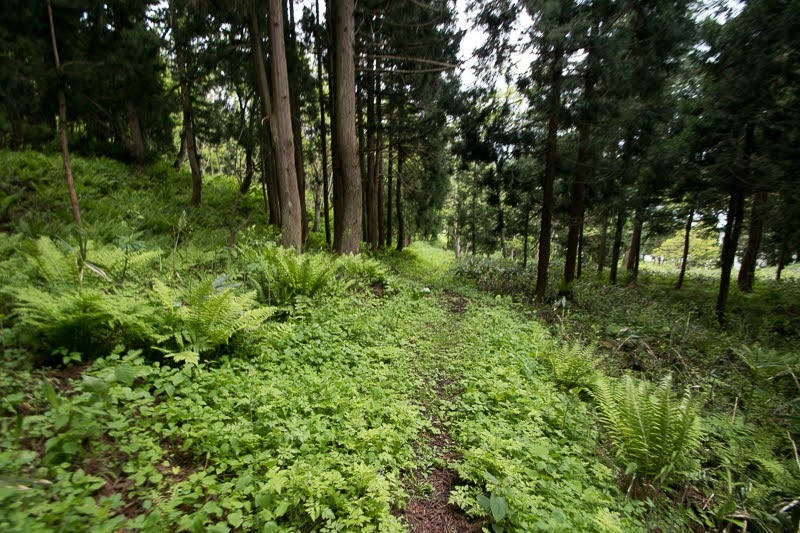 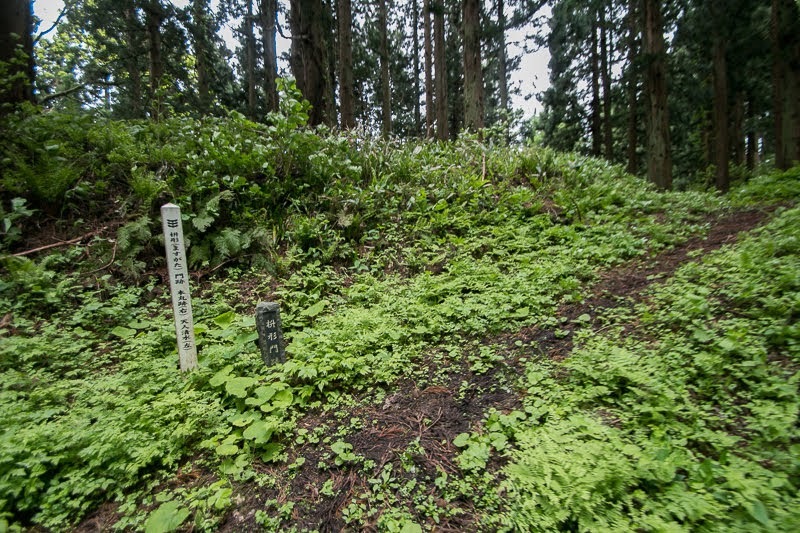 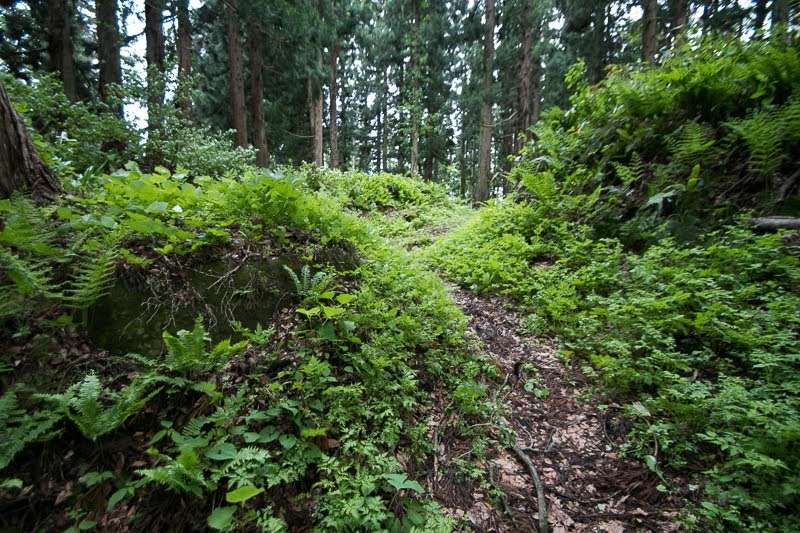 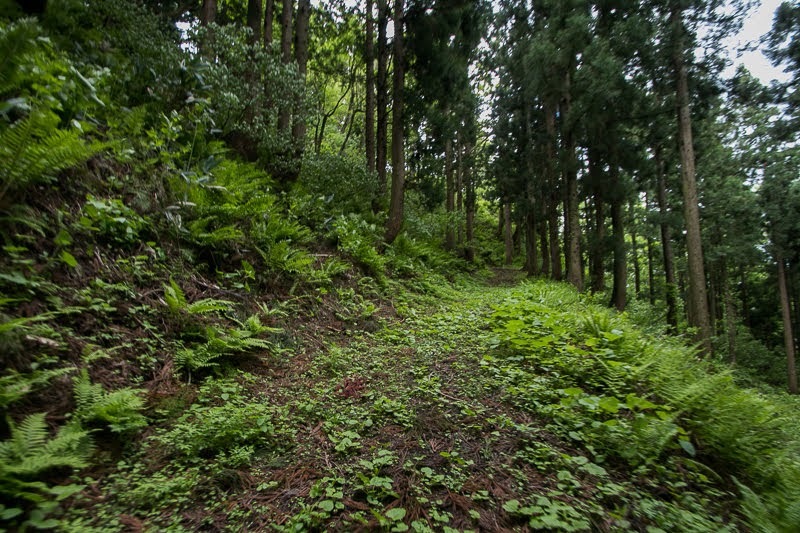 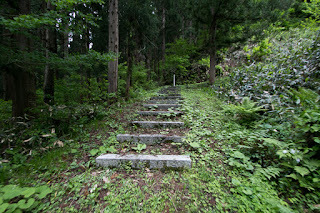 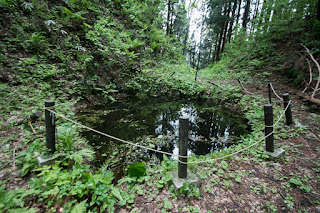 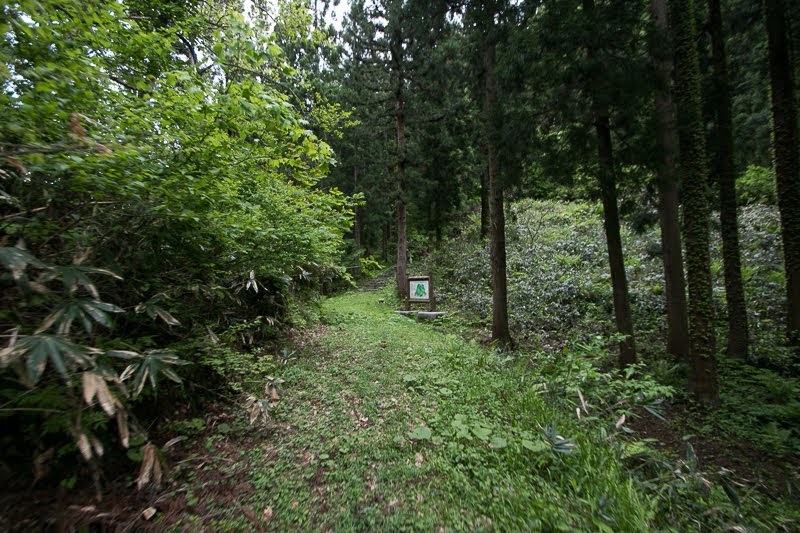 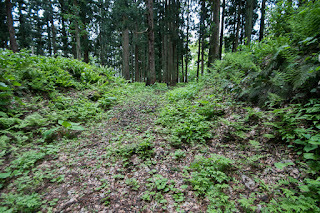 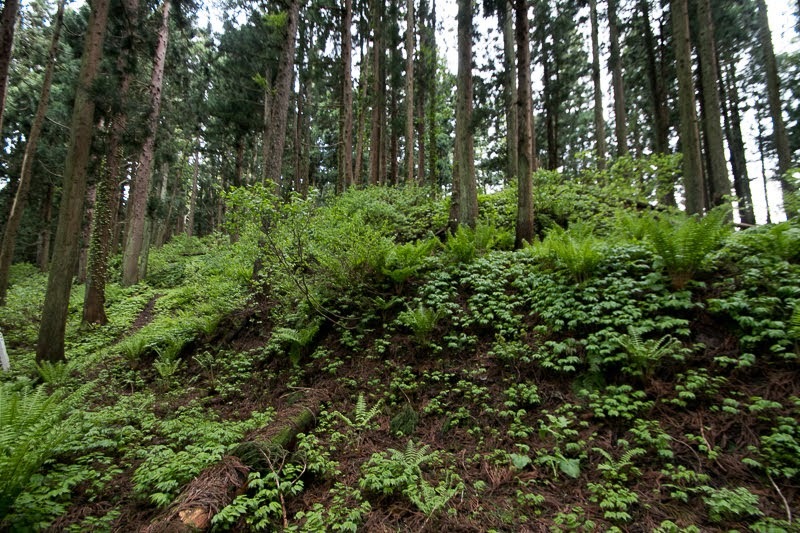 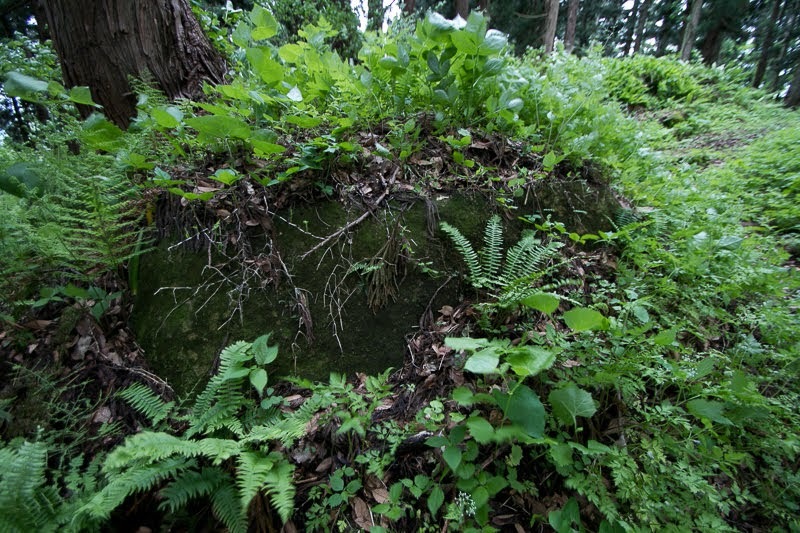 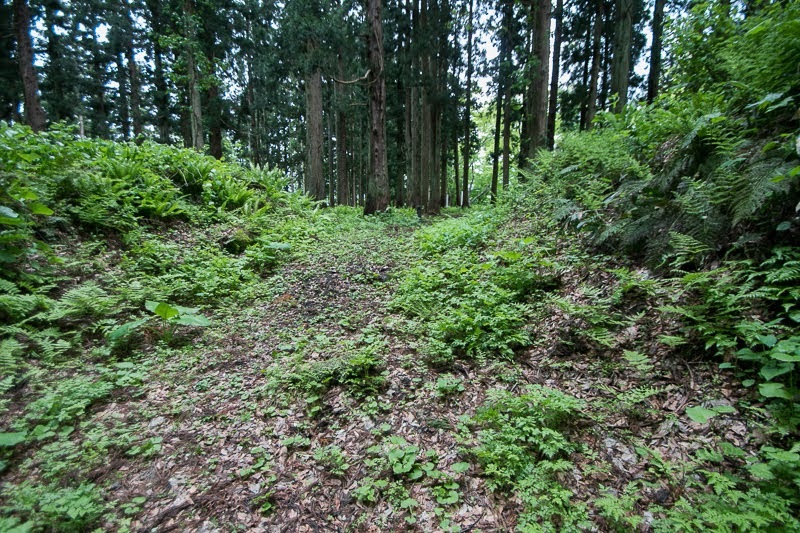 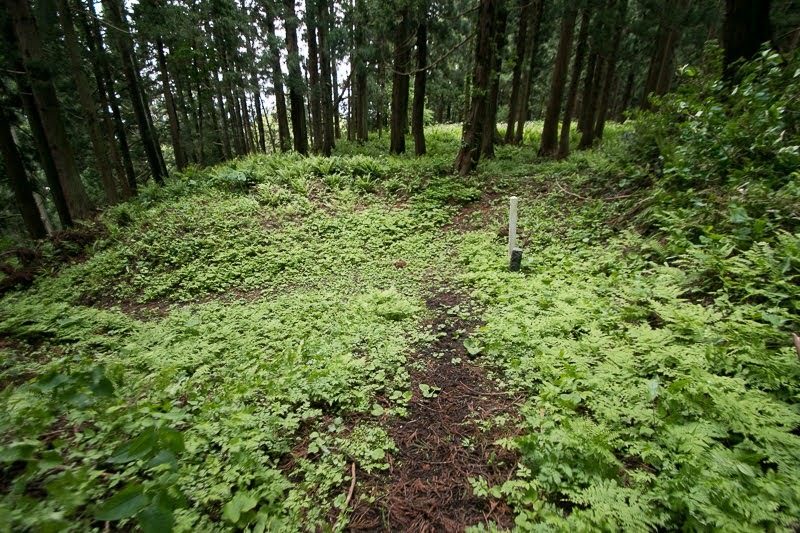 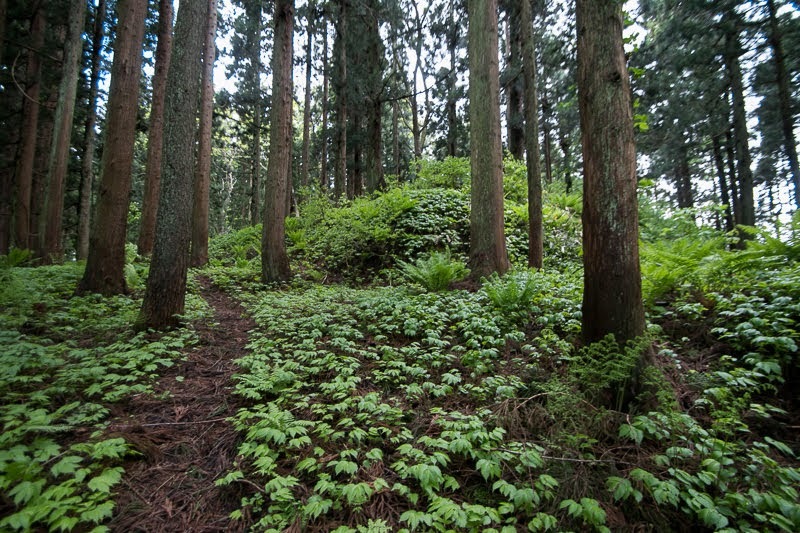 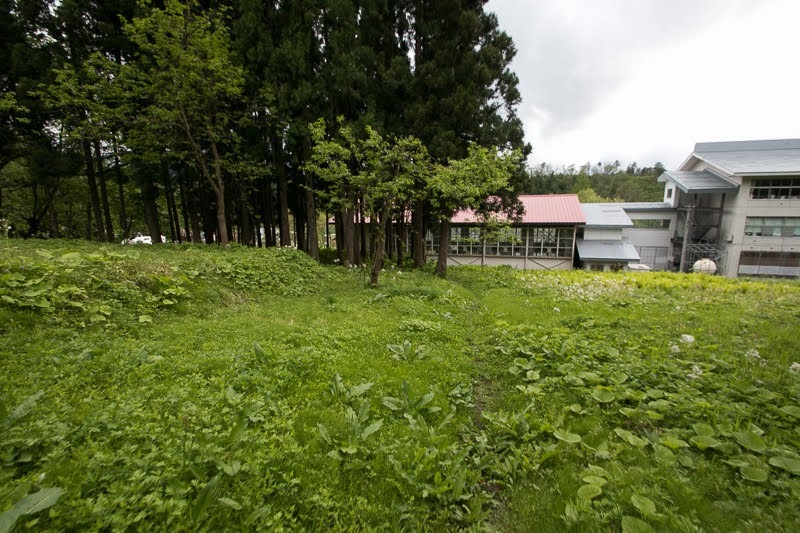 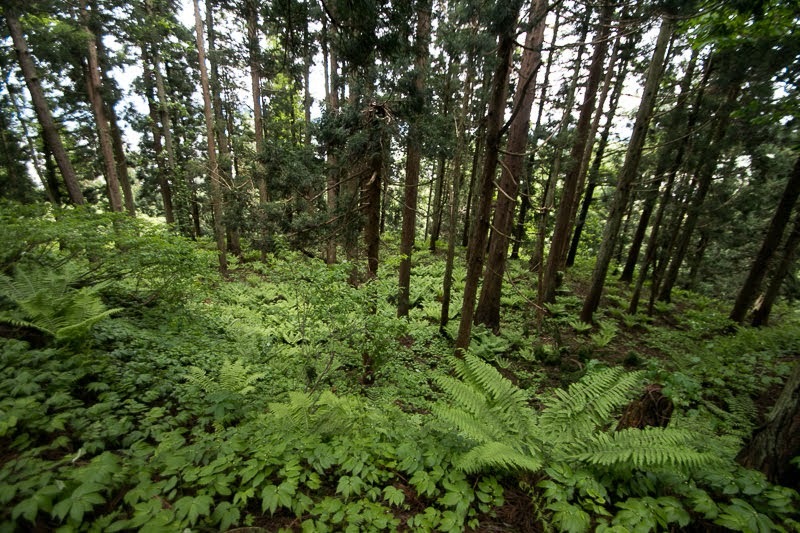 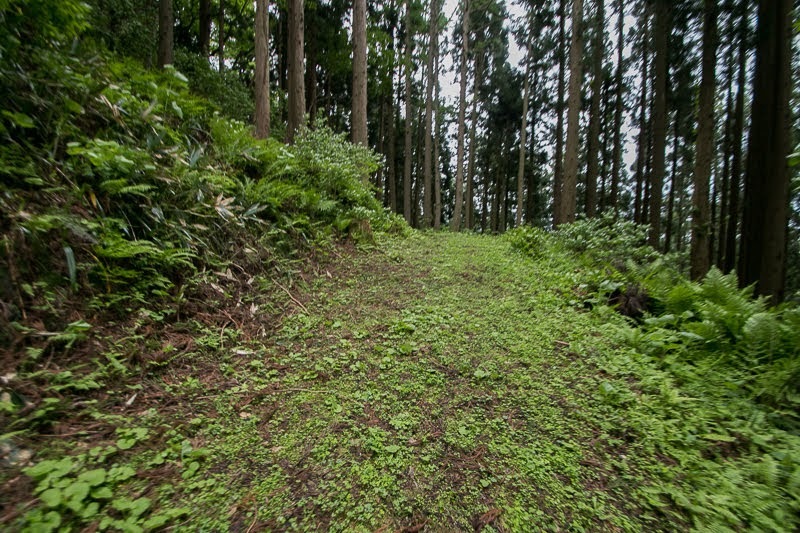 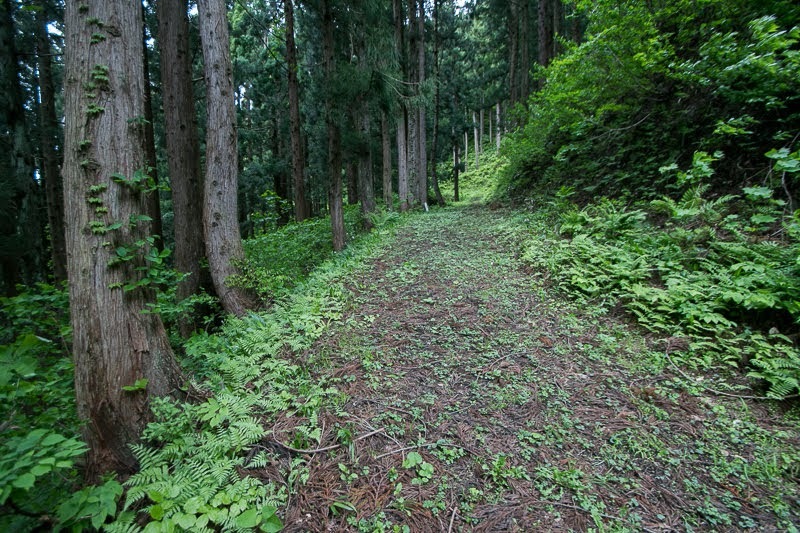 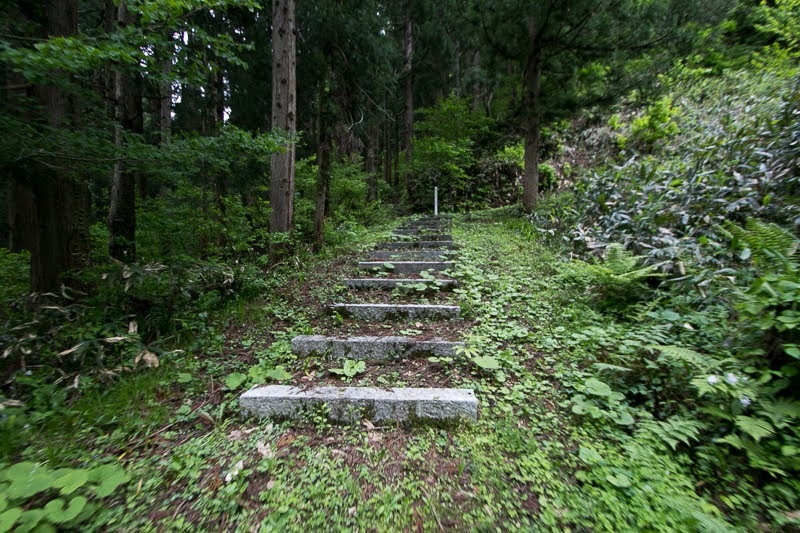 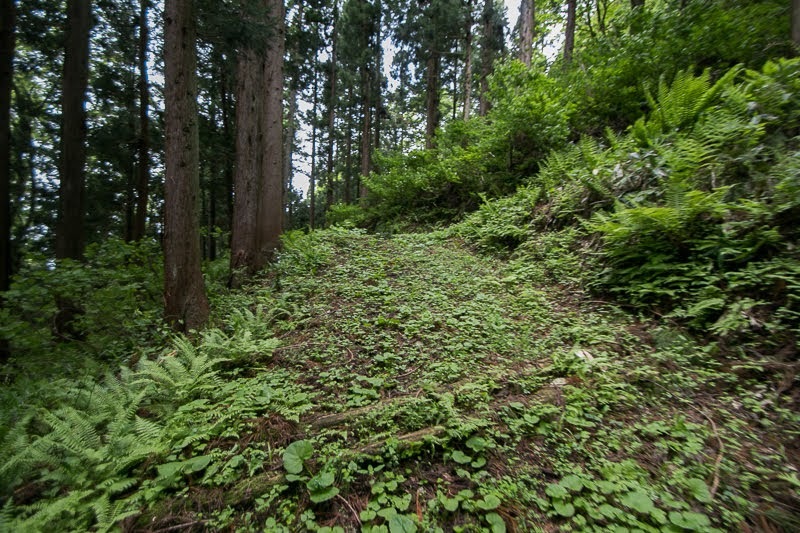 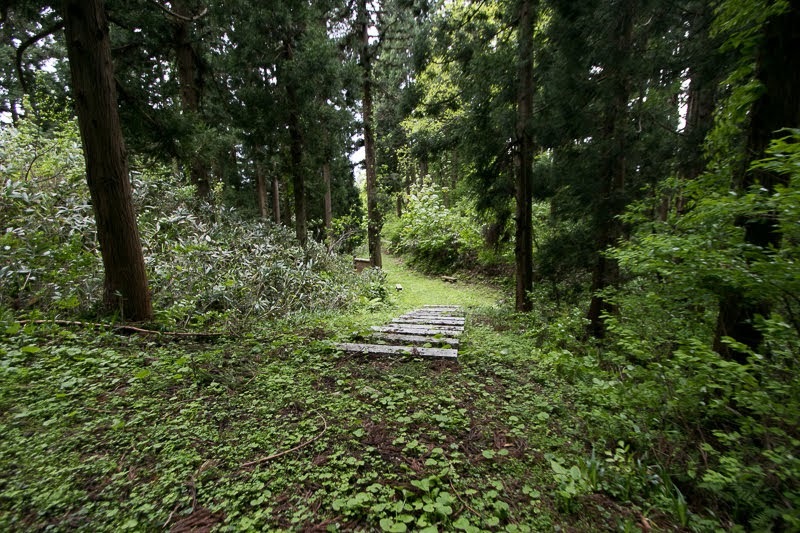 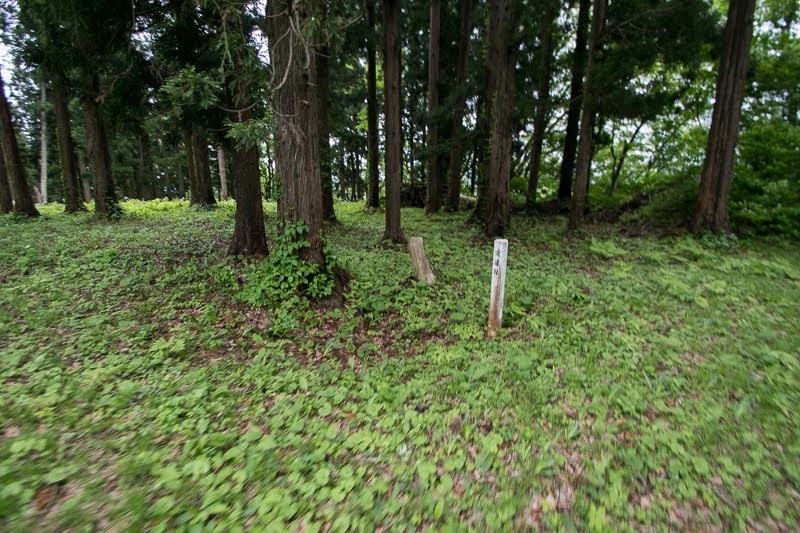 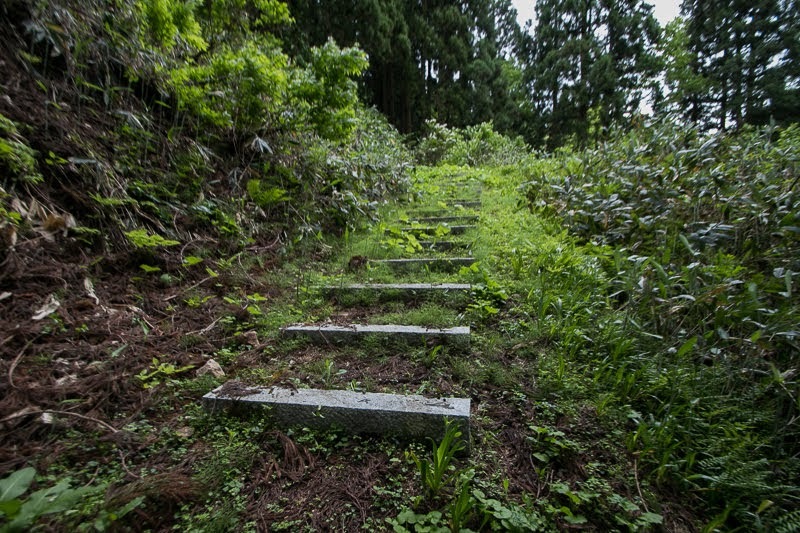 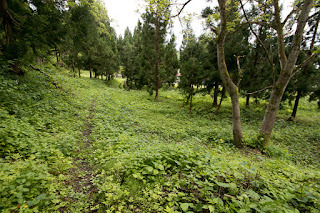 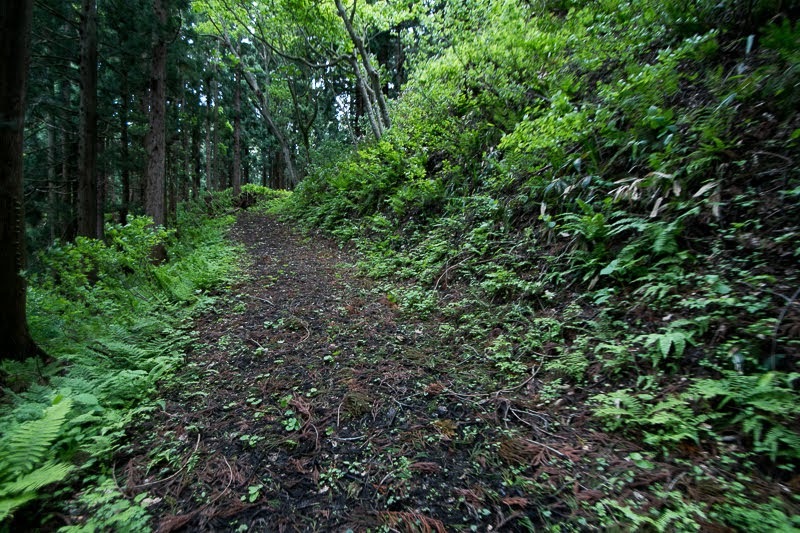 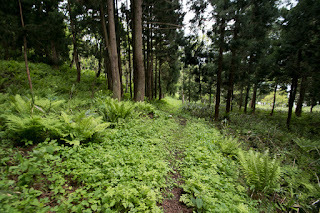 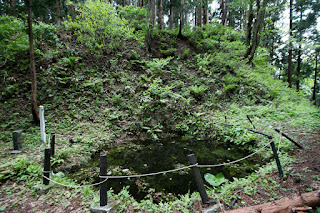 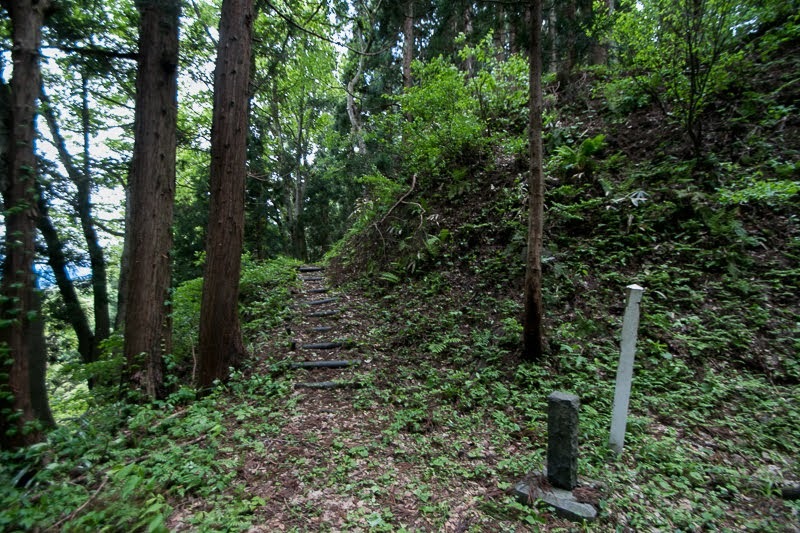 Later Nobesawa silver mine grew and once regarded as one of three major silver mines of Japan, and before that it could financially support the army of Nobesawa clan. 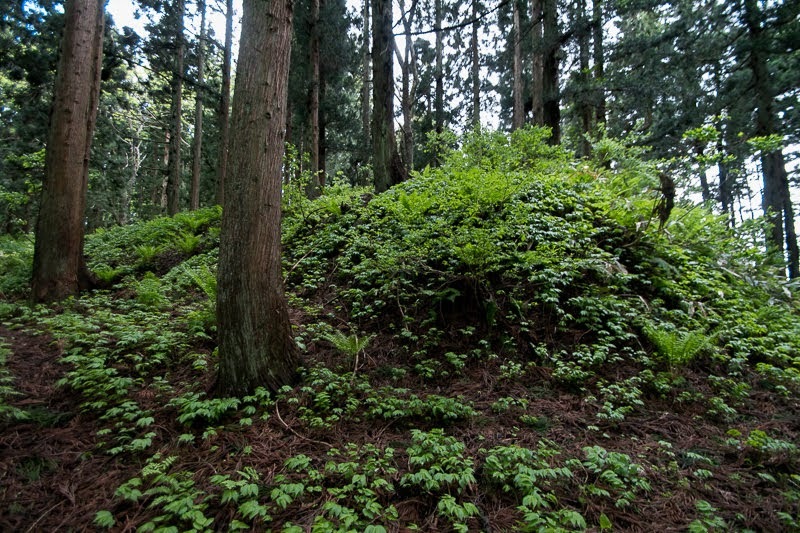 Different from other ruined lords, Yoshiaki tried to invite Mitsunobu by let his daughter marry, probably because of their similarity. 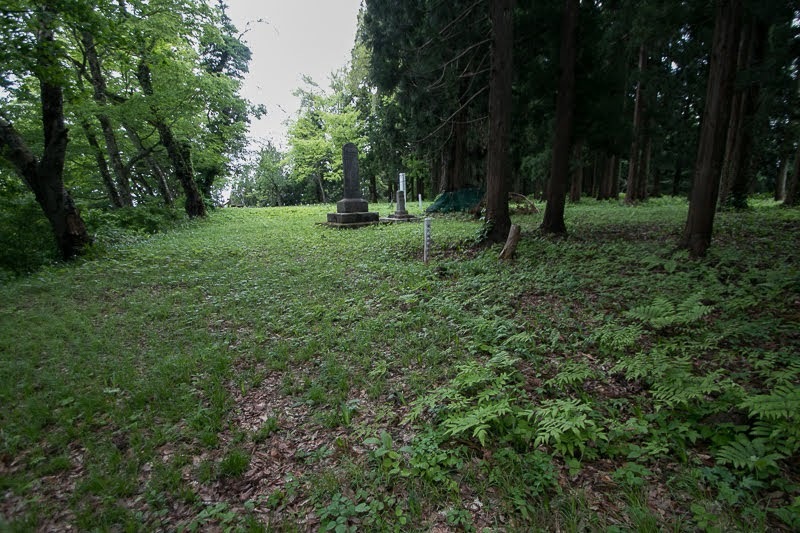 Finally based on the condition of saving the life of Tendo clan, Mitsunobu turned to Yoshiaki Mogami then Tendo clan finally left Tendo castle then ran to Date clan in 1584. 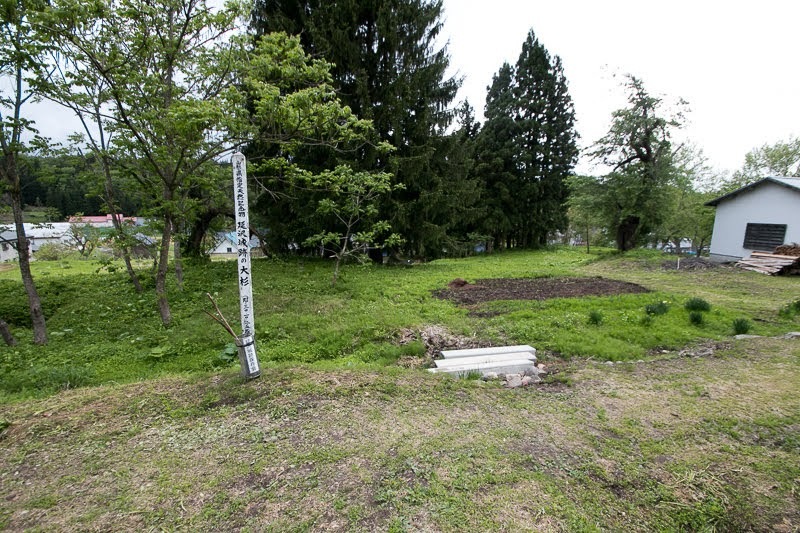 Yoshiaki could unite Yamagata basin after over 10 years severe battle. 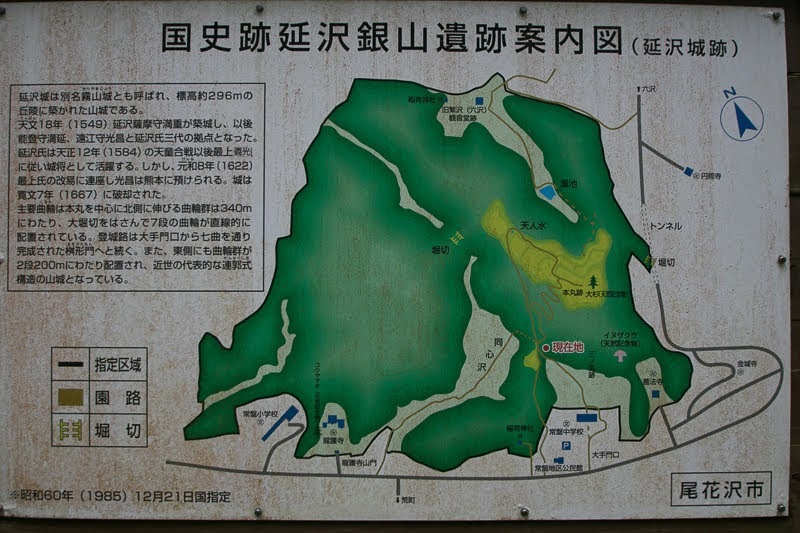 Yoshiaki Mogami courteously treated Mitsunobu Nobesawa as his relative and let him manage Nobesawa silver mine. 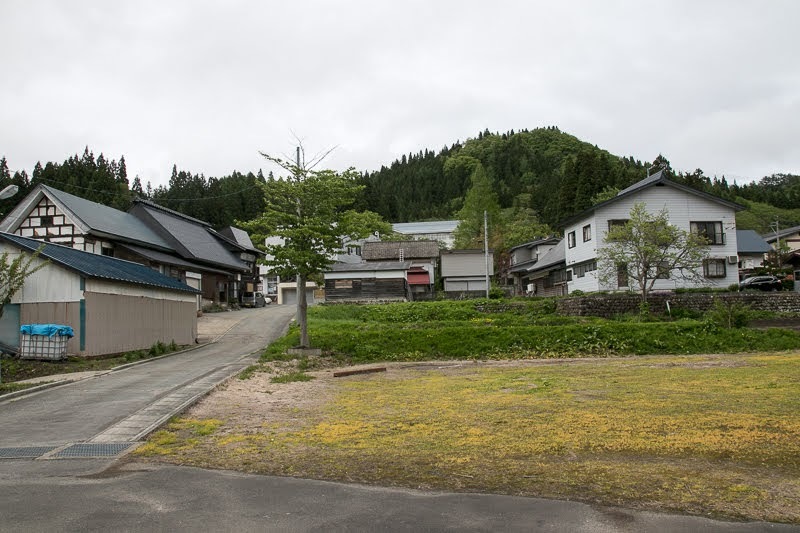 Nobesawa clan had a large territory and became a vanguard toward Daihoji clan at westward, Onodera clan at northward and Osaki clan at eastward and well served his duty. 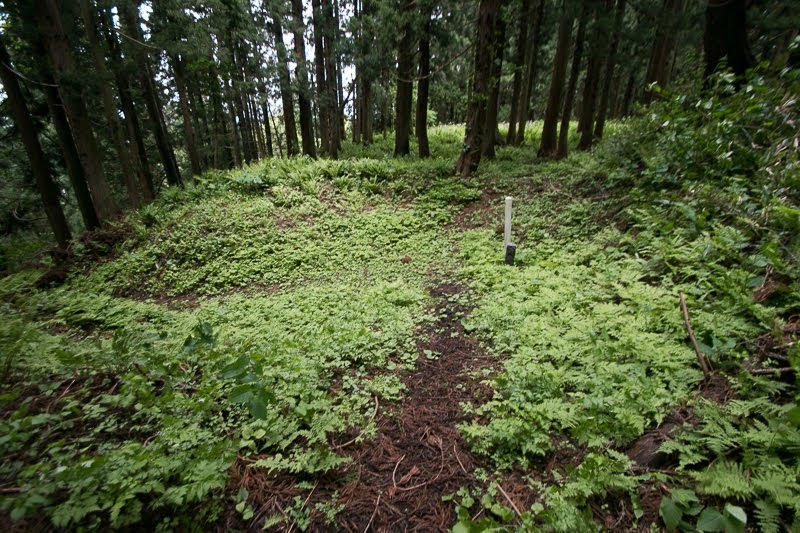 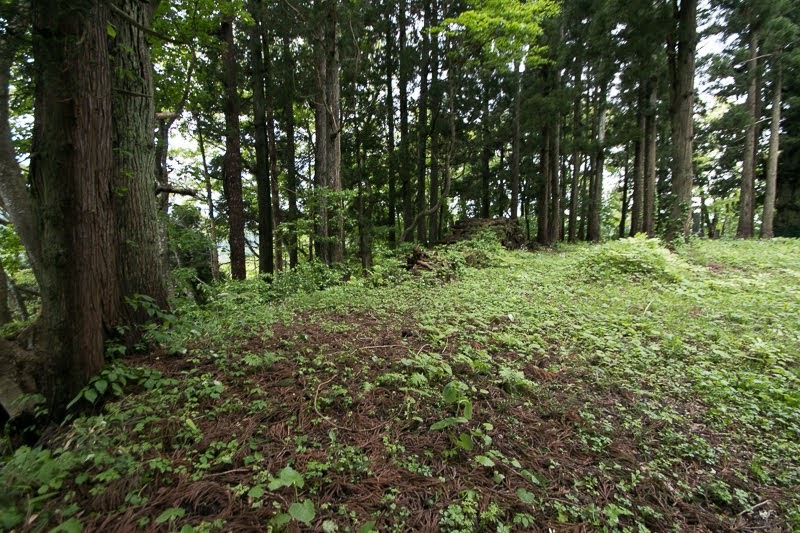 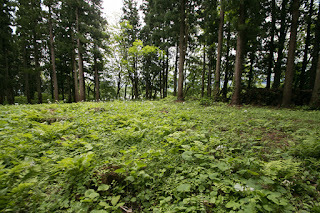 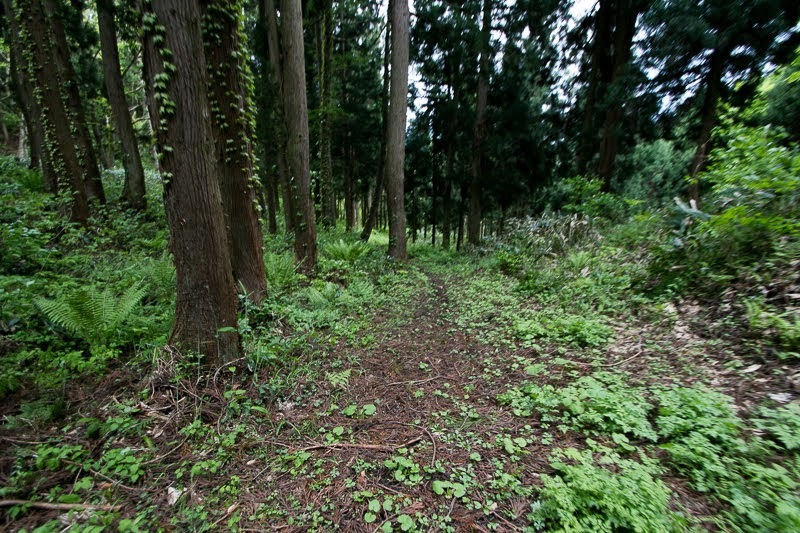 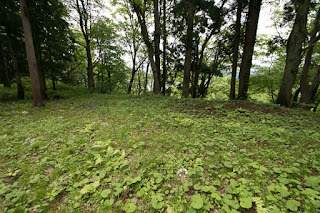 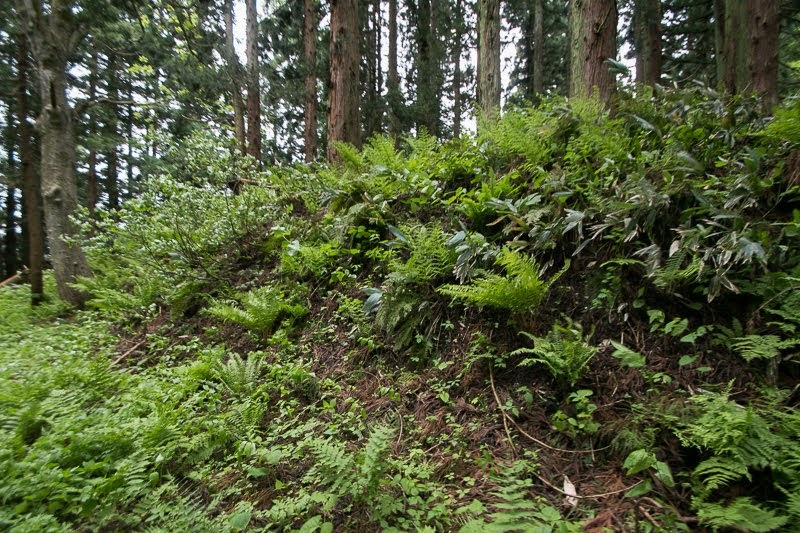 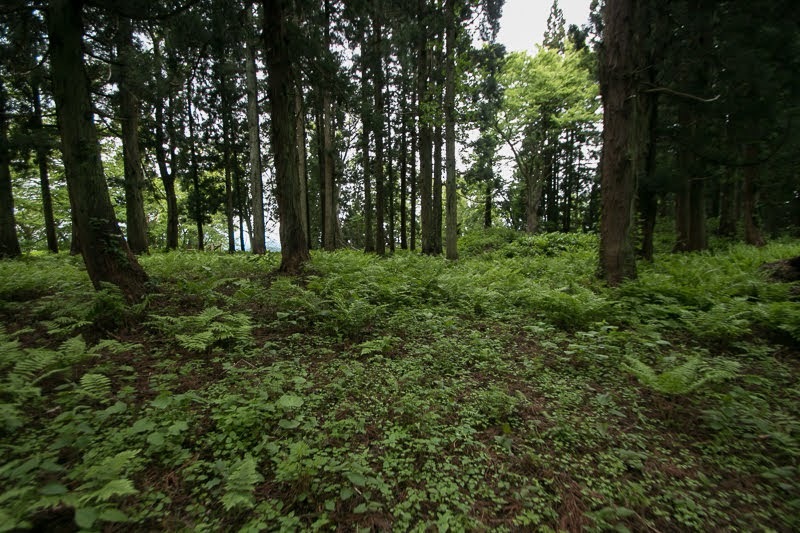 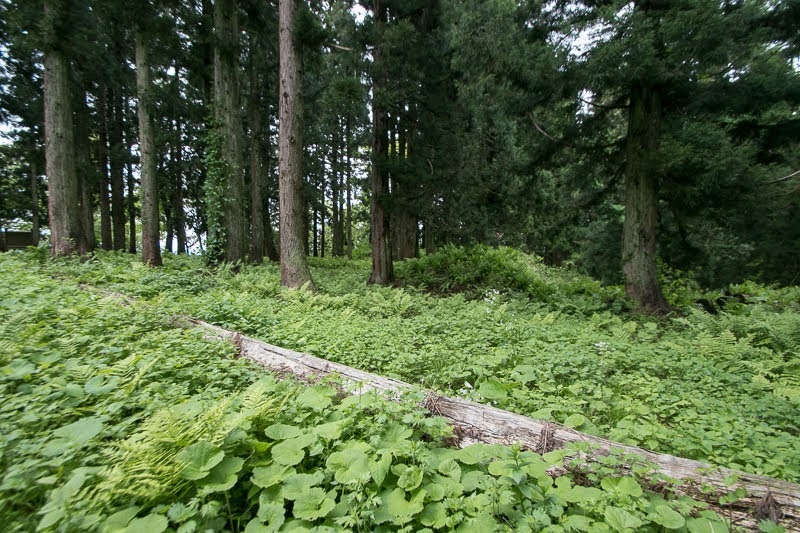 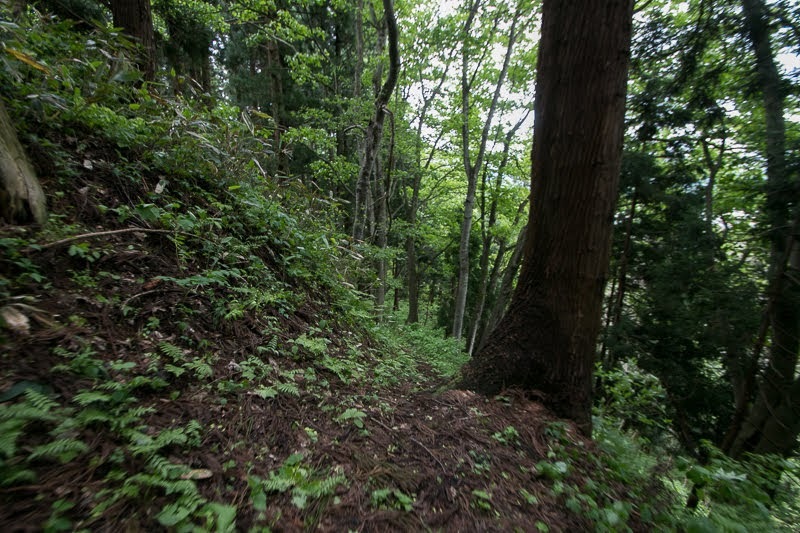 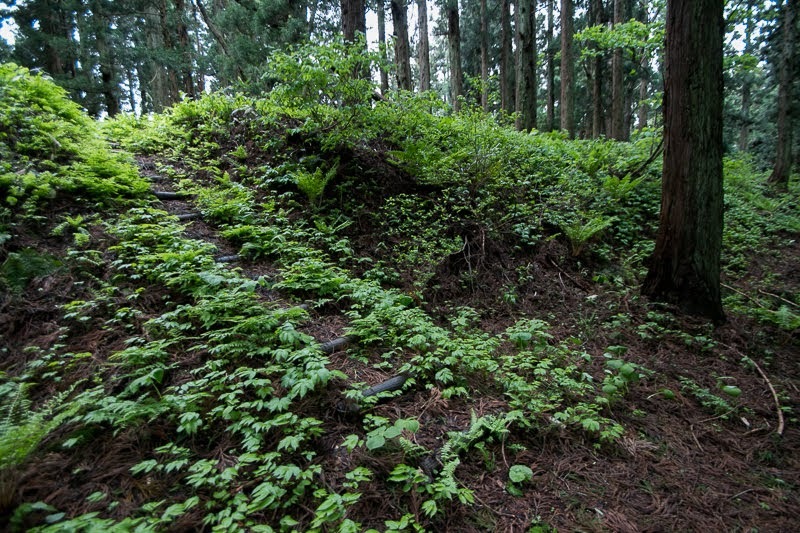 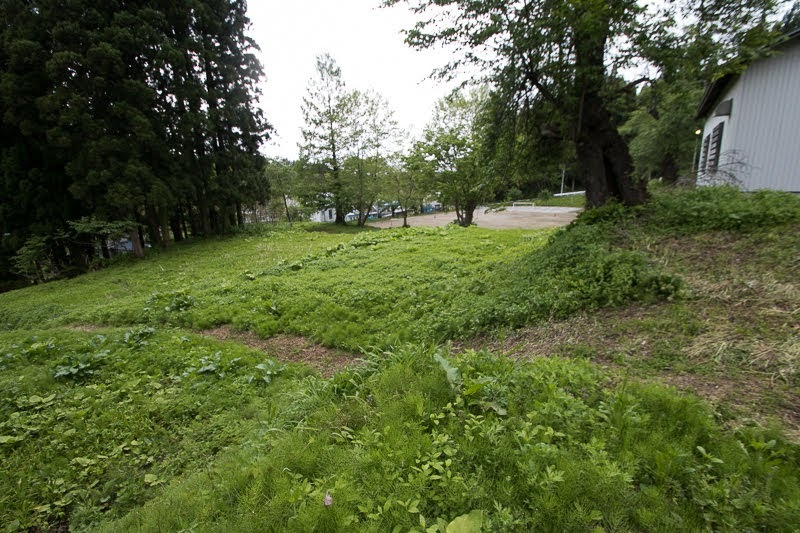 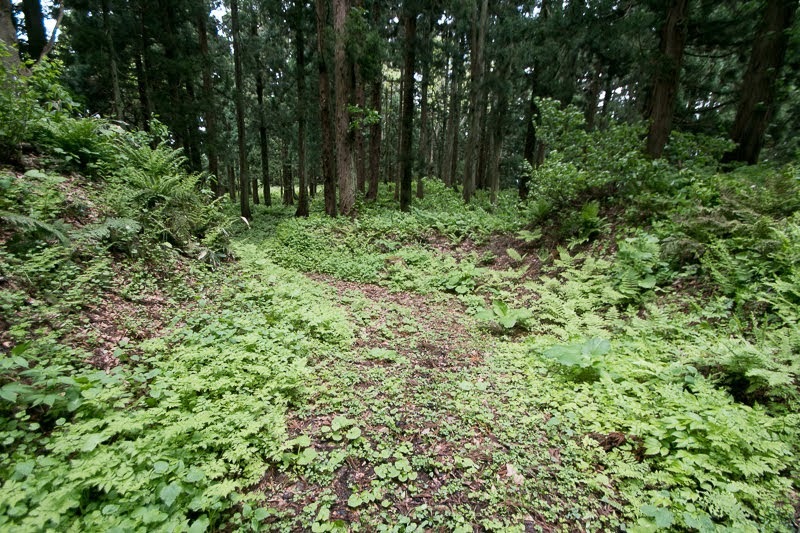 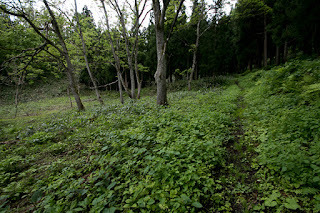 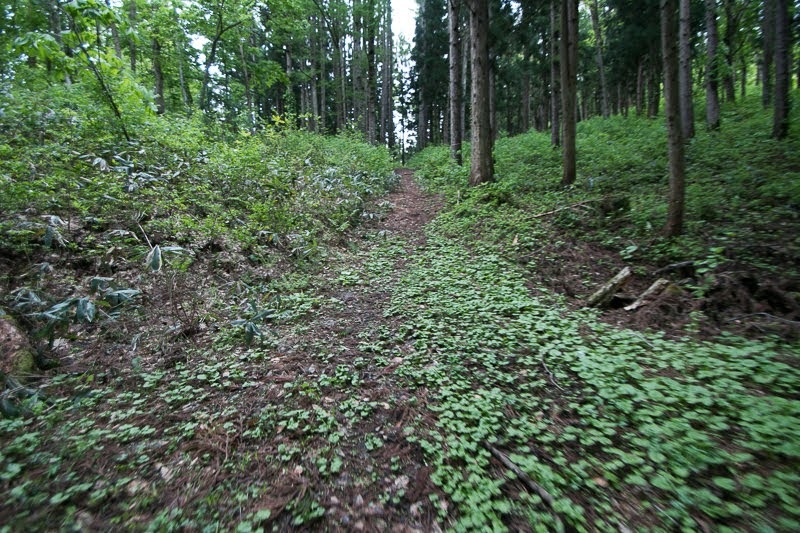 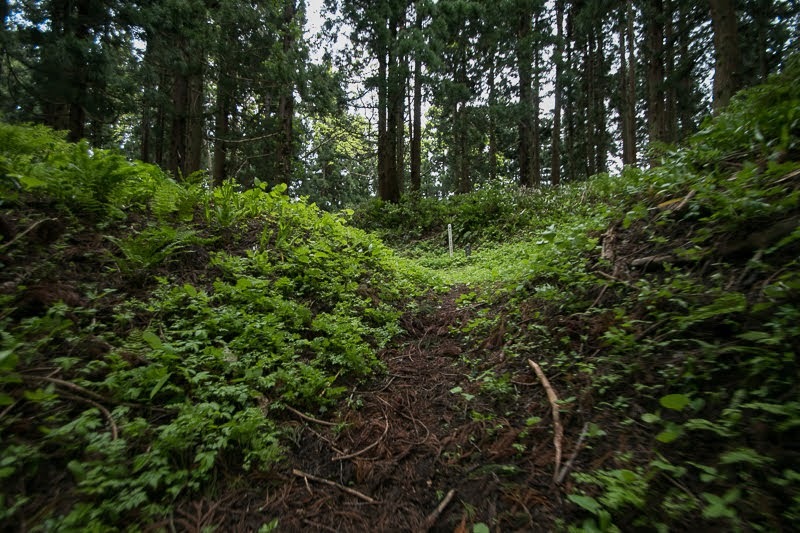 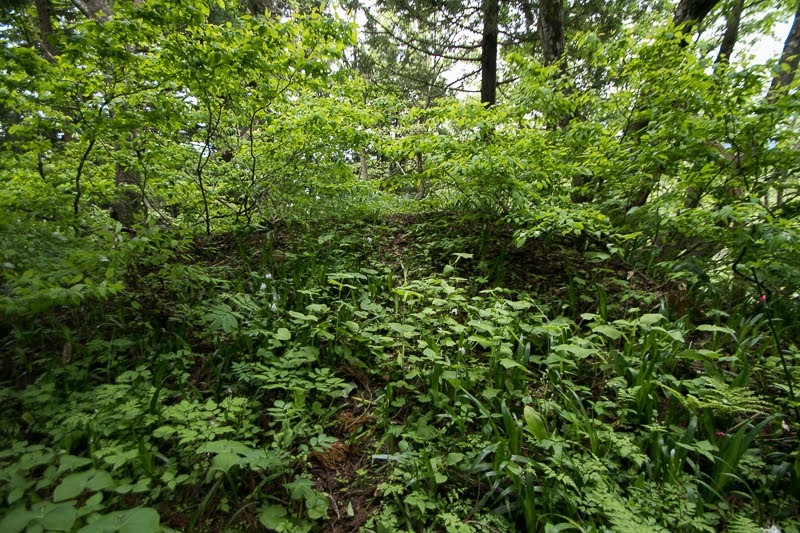 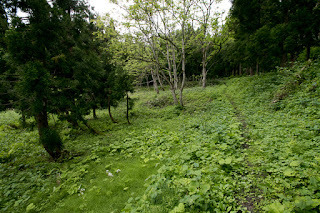 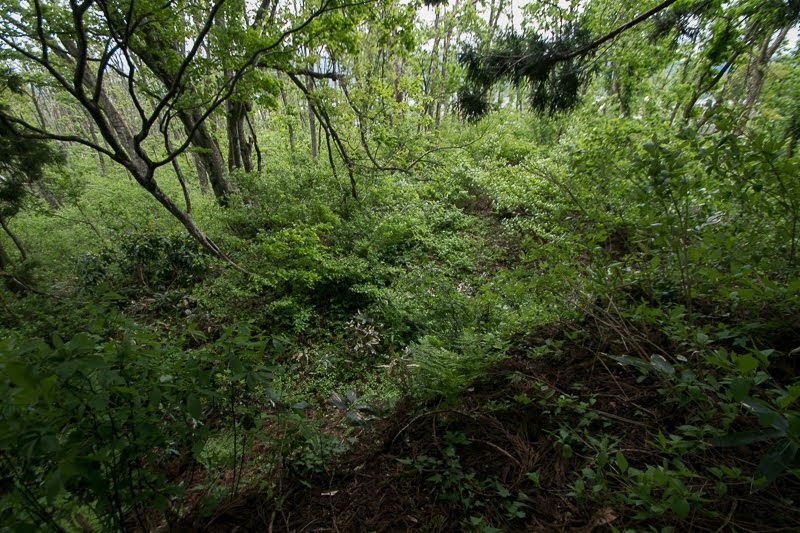 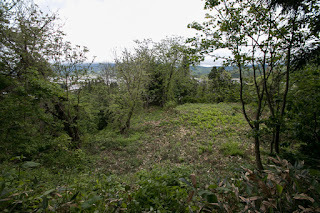 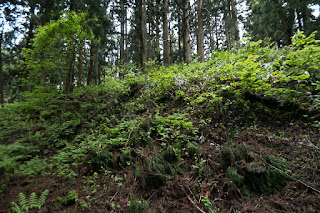 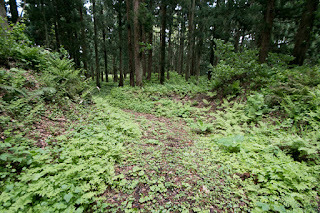 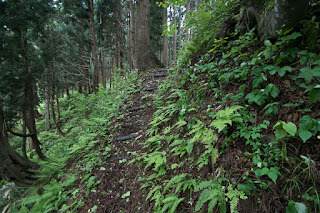 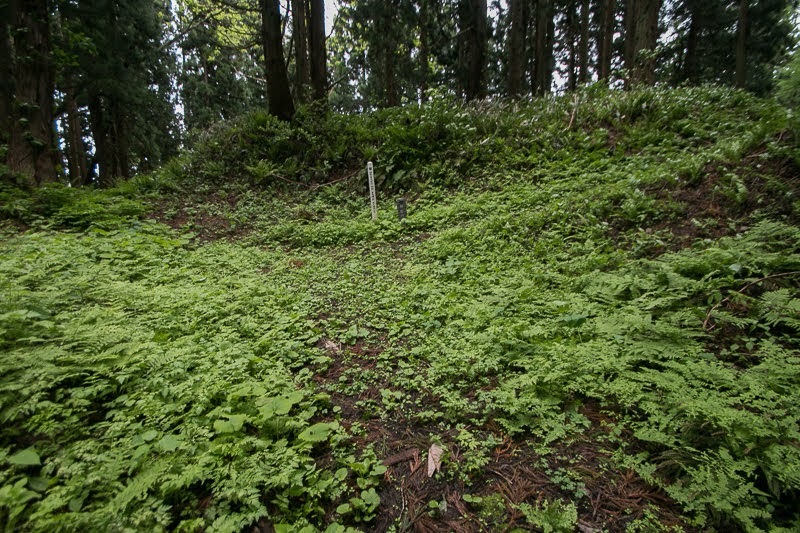 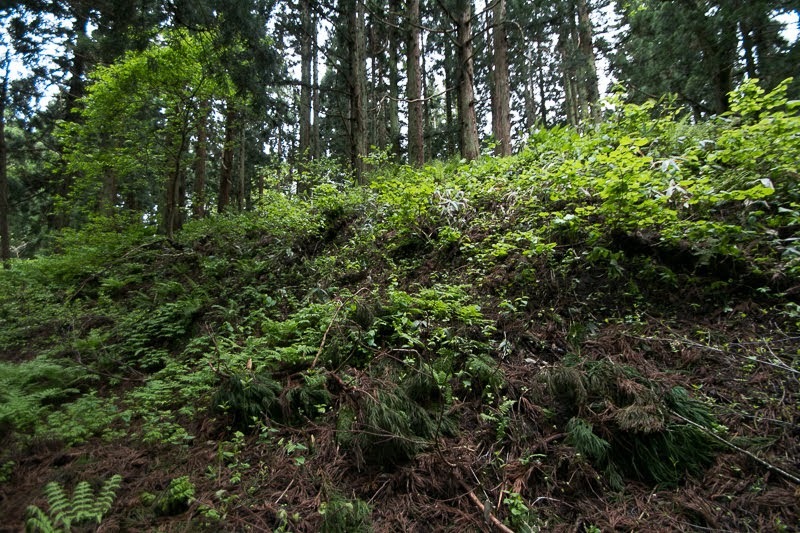 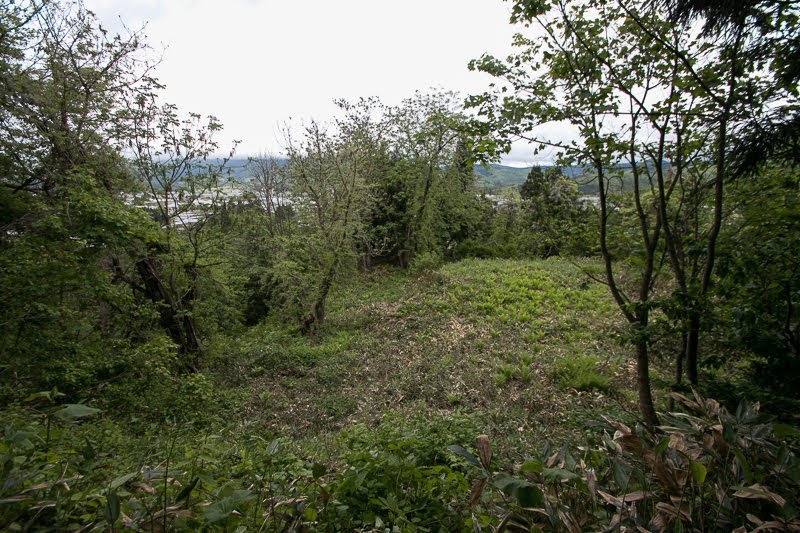 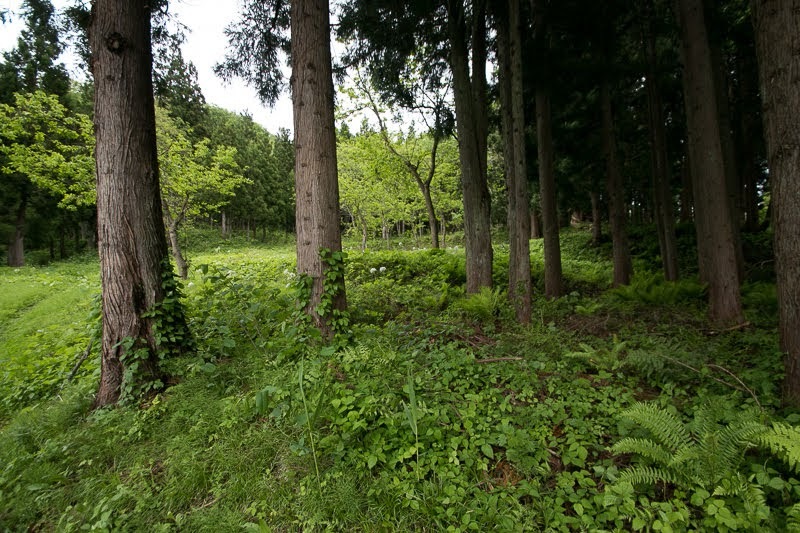 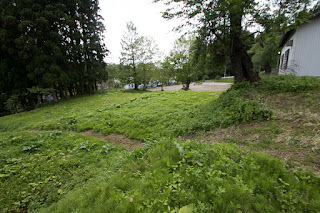 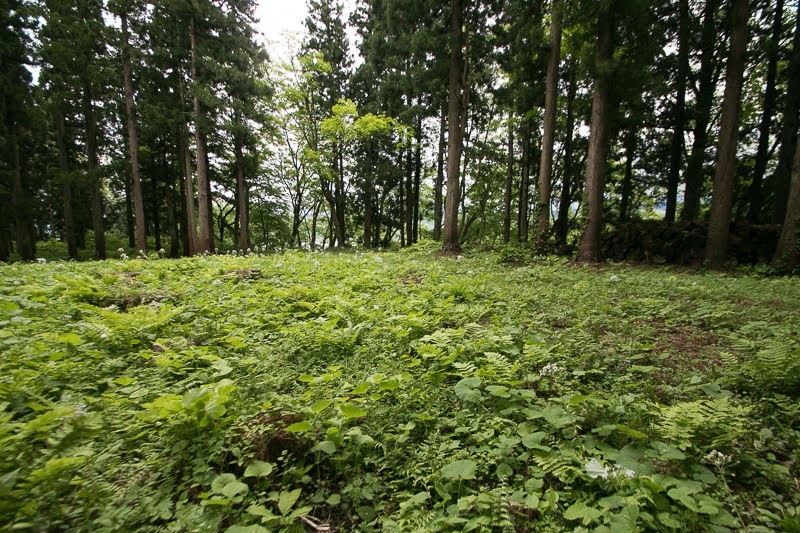 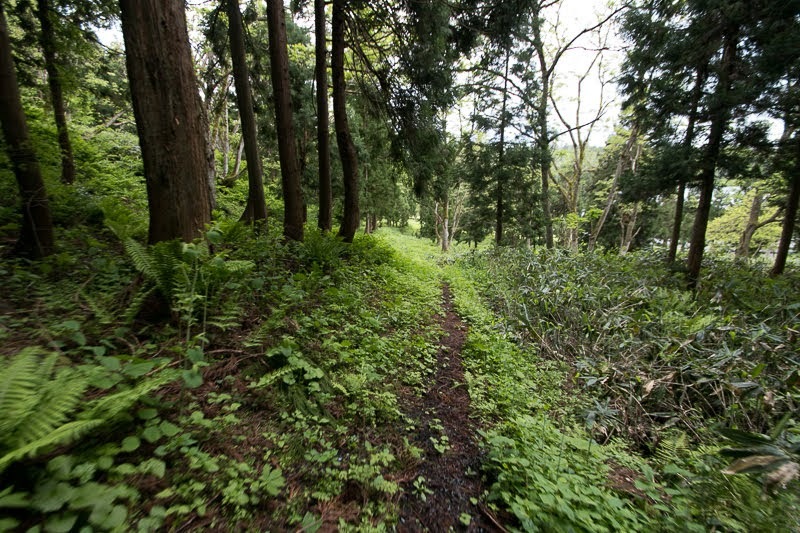 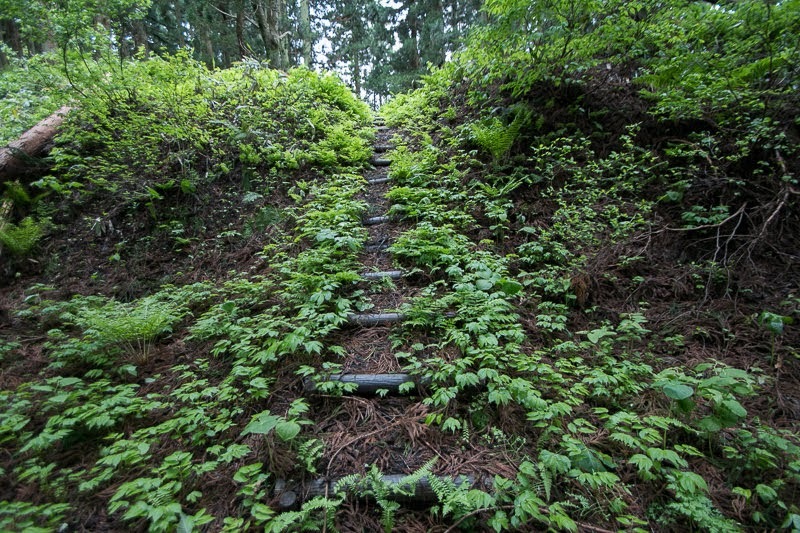 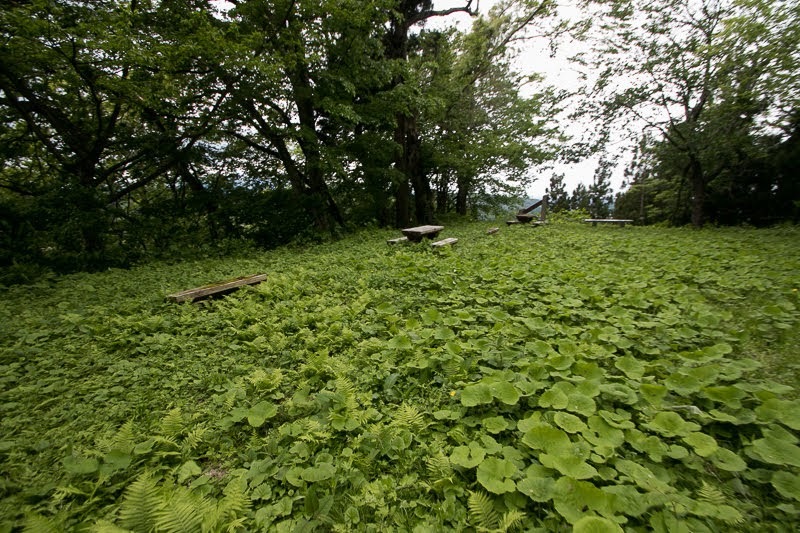 Nobesawa castle might be expanded as a castle of important retainer of Mogami clan. 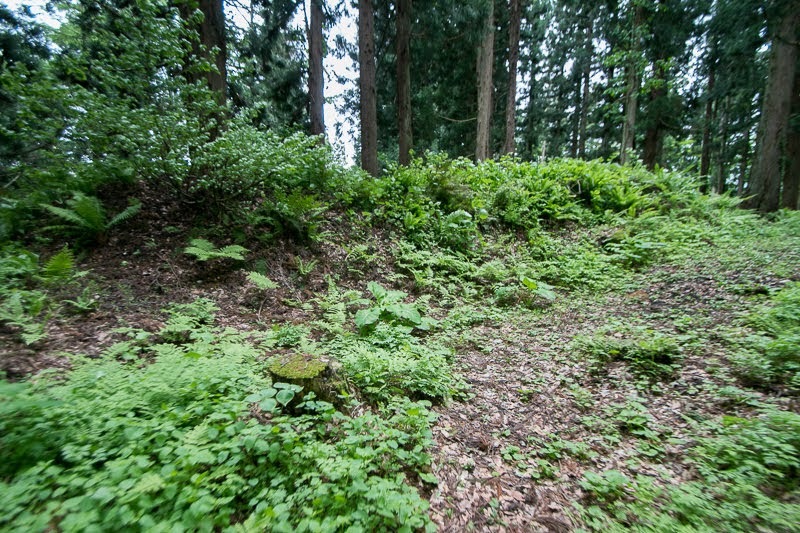 After the unification of Yamagata basin, Yoshiaki continued struggle against surrounding lords such as Daihoji clan or Onodera clan and expanded his territory toward north. 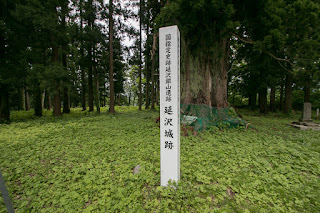 Even though losing Shonai area before Uesugi clan, Mogami clan became the feudal lord under Toyotomi government in 1590. 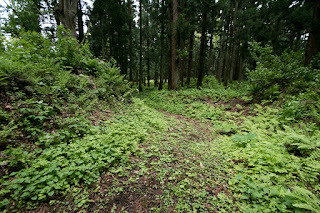 But just after that Mitunobu died in the ill in 1591 thus Nobesawa castle was succeeded by his son. Nobesawa castle consist of main line spreads toward northward and sub ridge to eastward like L letter. 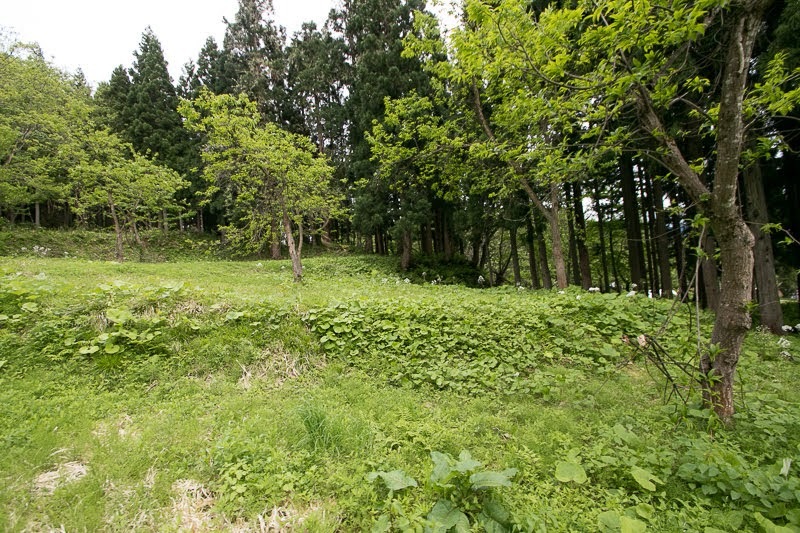 Central area of the castle is a large size rectangular shaped area of 100 meter long and 50 meter wide, which has a main gate at its north edge. 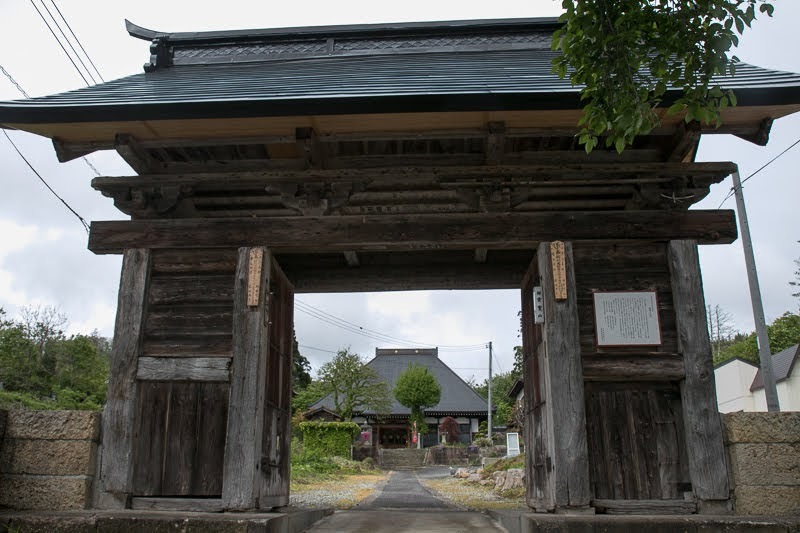 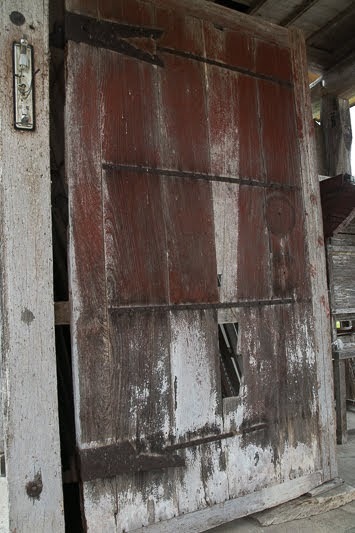 This main gate is a modern shaped gate of Masugata style, a combination of two gates with buffer area which might be formerly decorated with low height stone wall. 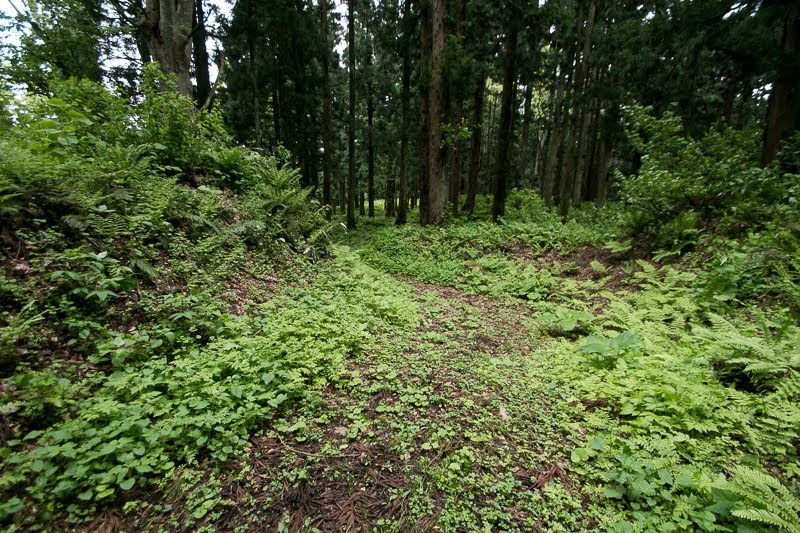 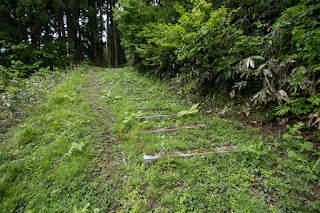 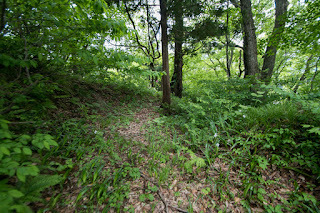 At the north of this main gate four square terraces were built along with the ridge like a step. 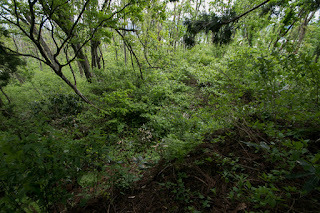 At the north of this area, a deep dry moat with a water pool named Tennin-Sui is built, which also worked as a backside gate of hilltop area. 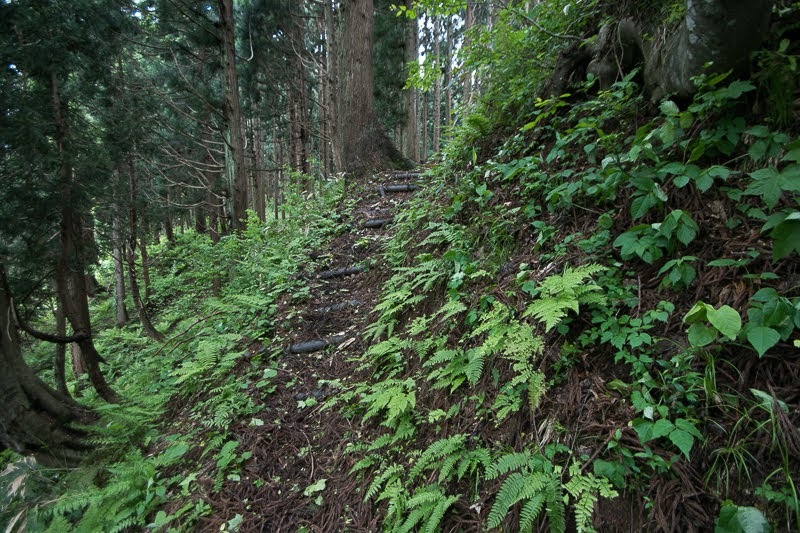 Along with these core terraces, corridor terraces were built at eastern slope of the mountain. 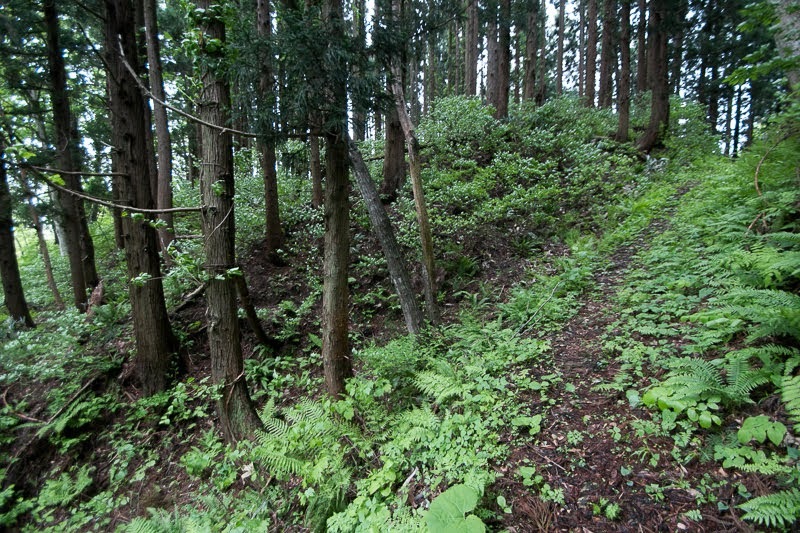 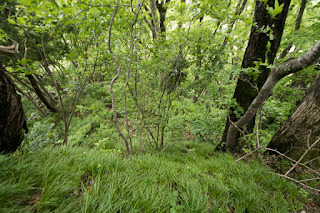 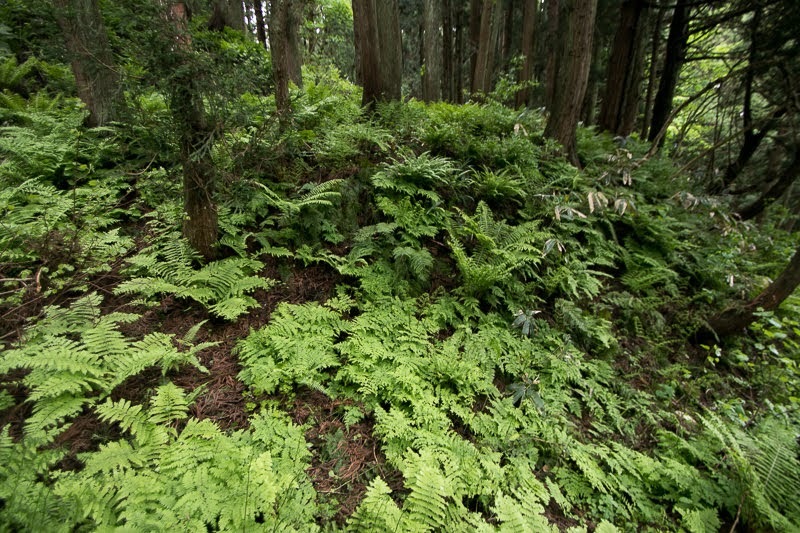 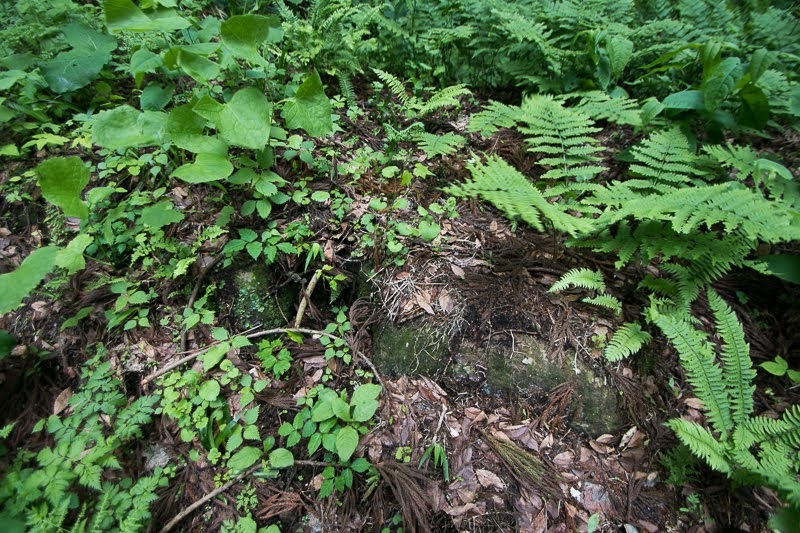 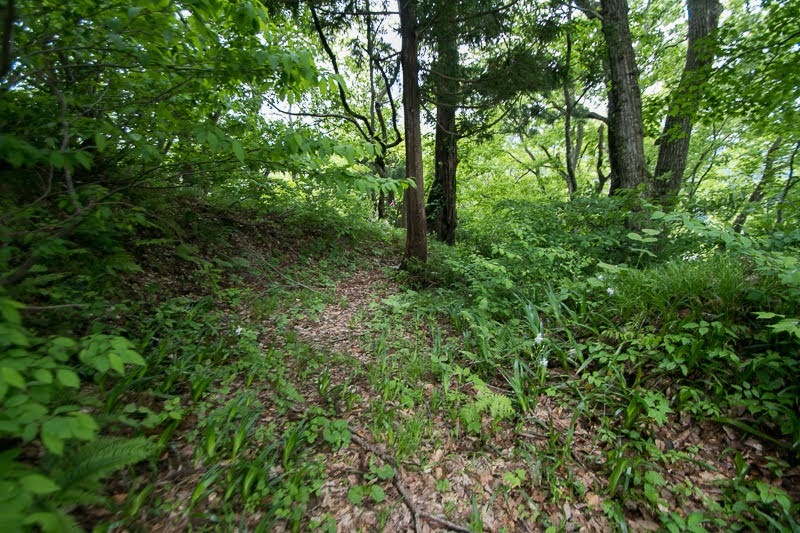 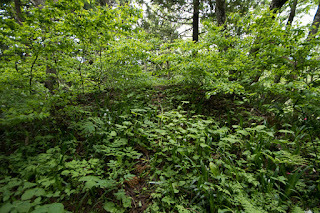 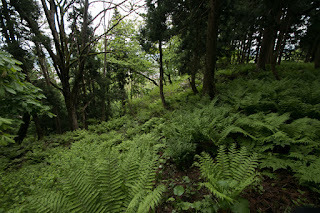 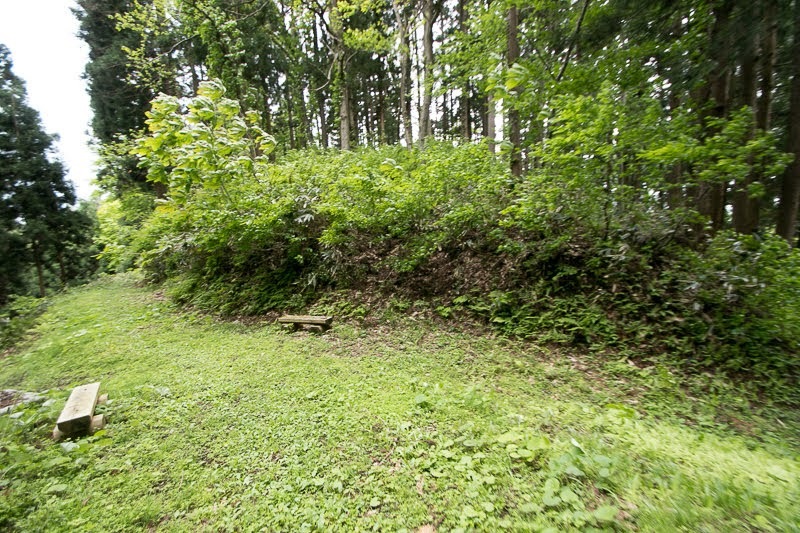 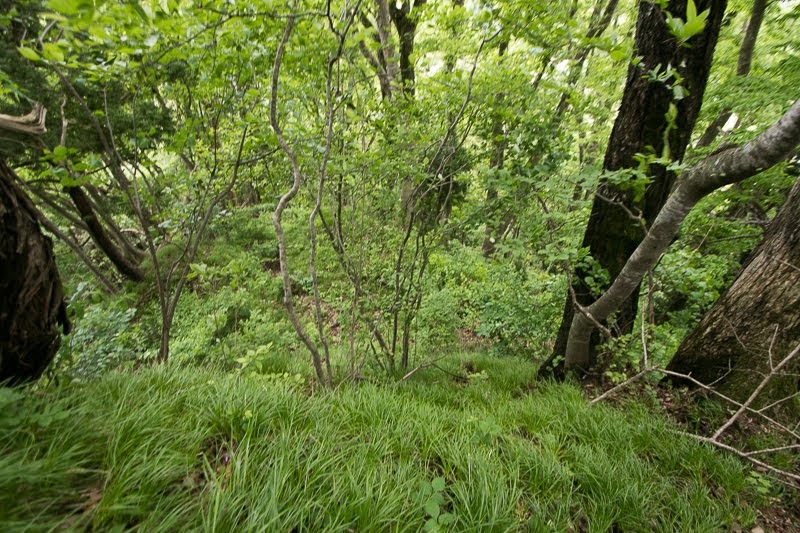 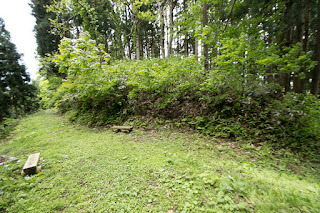 Third area of the castle is a large flat area at the southern hillside of the mountain. 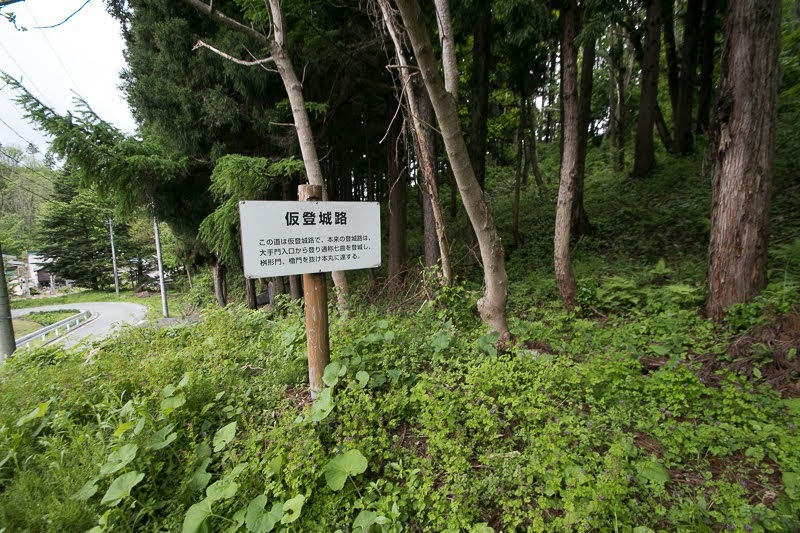 Residence of the Nobesawa clan existed at the place where elementary school resides now, along with the main gate of the castle. 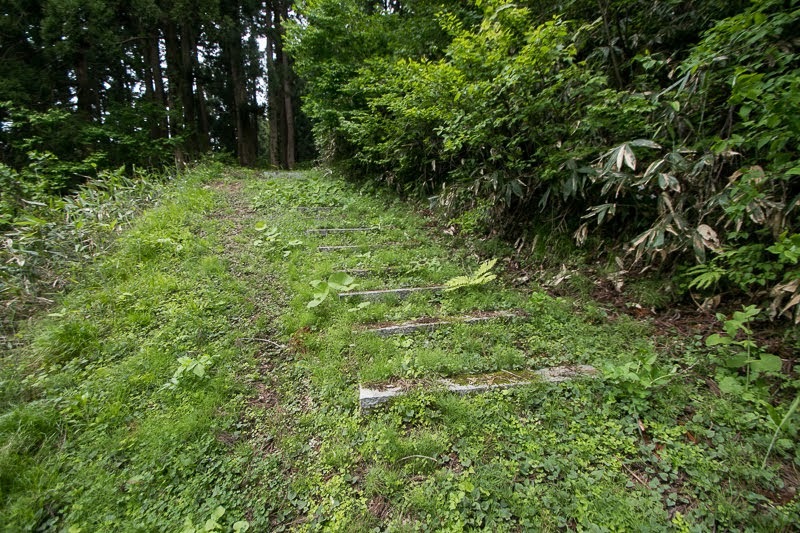 Even though not using stone walls basically, straight lines of terraces and technically built defense facilities is exactly the shape of modern castle, not seen in other branch castles of Mogami clan. 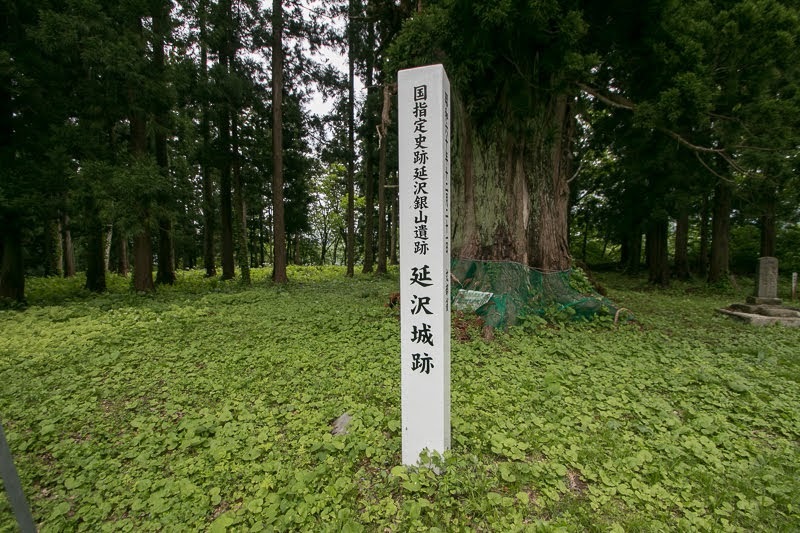 After the hard battle against Uesugi clan at the battle of Sekigahara occurred in 1600, Yoshiaki Mogami became the large lord of whole Dewa province under Edo Shogunate and recovered past fame of Mogami clan. 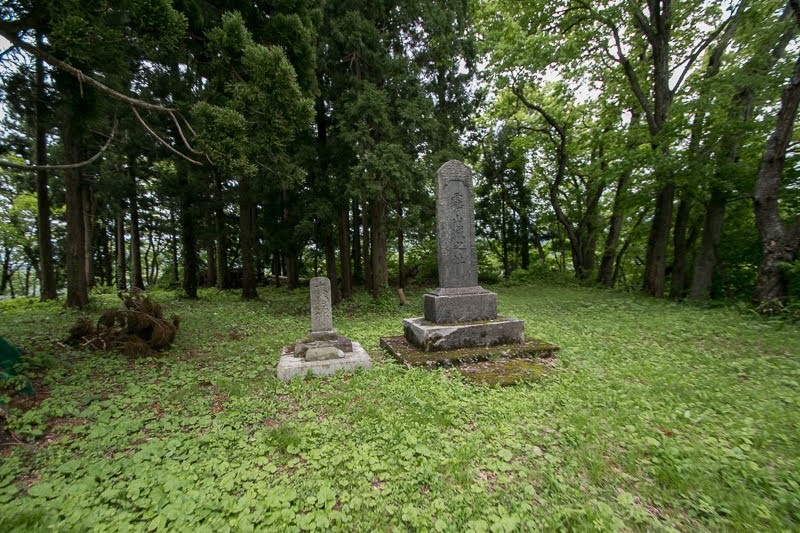 But after the death of Yoshiaki, Mogami clan was expelled by the Shogunate by severe internal conflict in 1622. 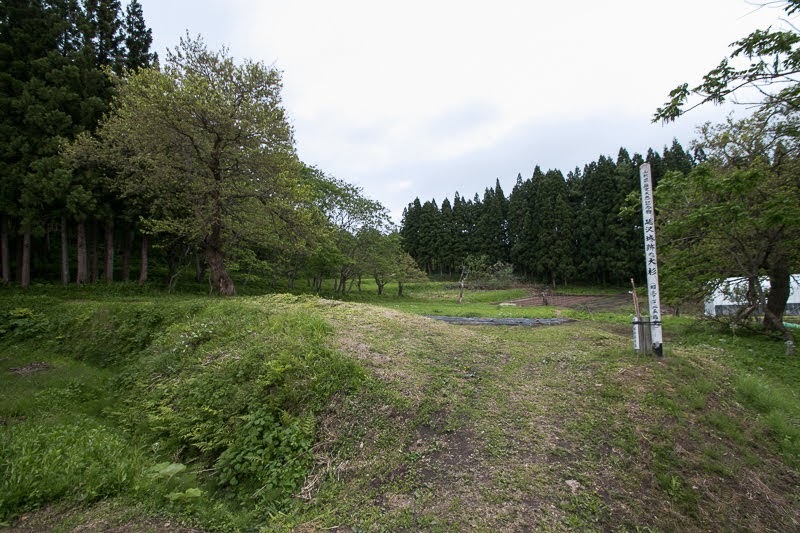 At the fall of Mogami clan, Nobesawa clan also lost their territory along with his master and was sent to Kumamoto domain But Nobesawa clan remained more under new lord Torii clan, preparing for the rebellion of Date clan which became a large lord of Sendai area. 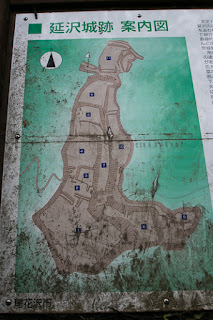 Finally Nobesawa castle was abolished in 1667, along with Higashine castle. 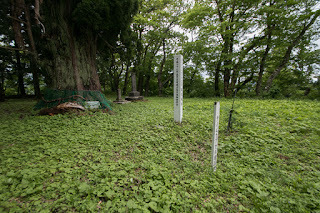 At the same time. 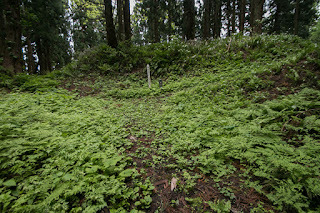 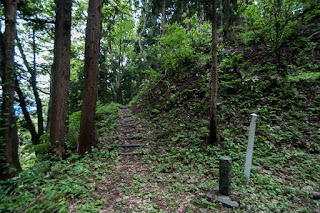 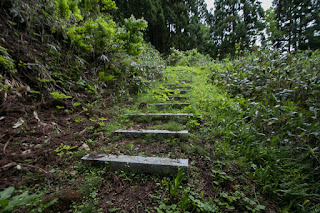 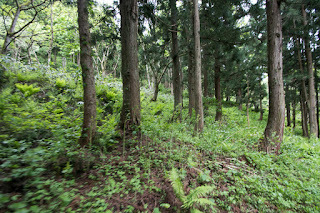 Nobesawa silver mine once prospered rapidly fell by the decrease of production, and was abolished following Nobesawa castle. 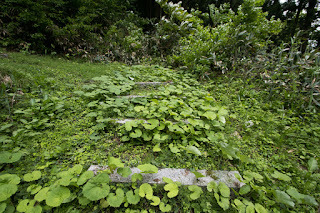 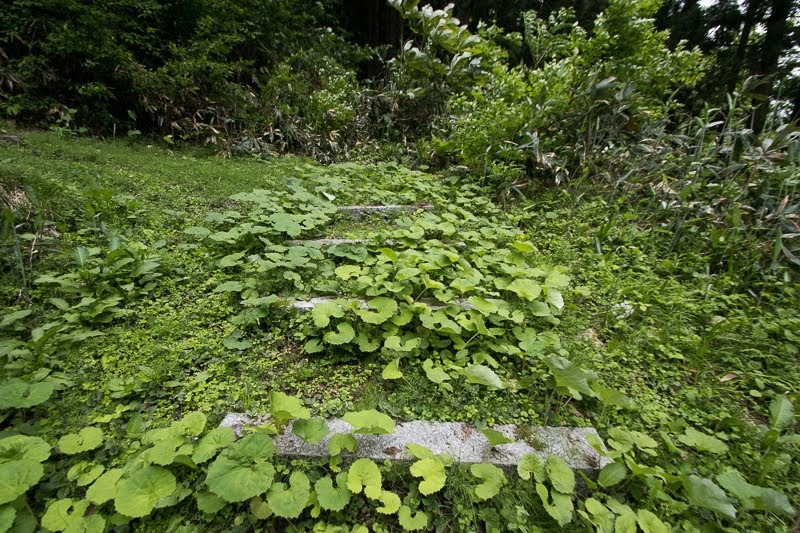 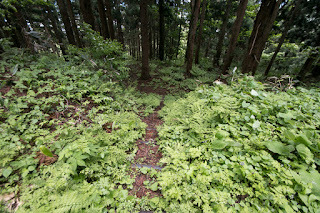 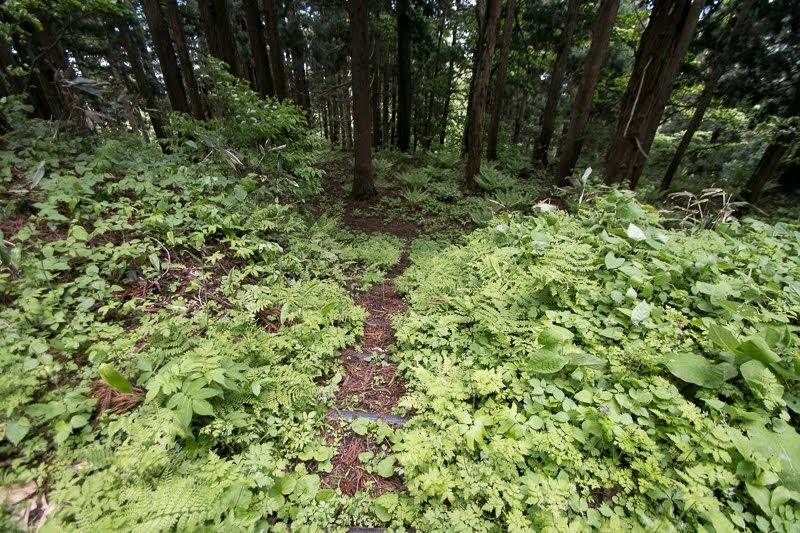 But similar to other mines in Japan, Ginzan Onsen spa was found by miners and mine areas turned to spa area. 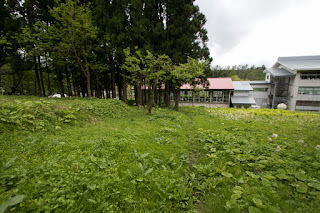 Currently Ginzan Onsen spa is known as its scenery of Western and Japanese mixed style wooden building of lodges. 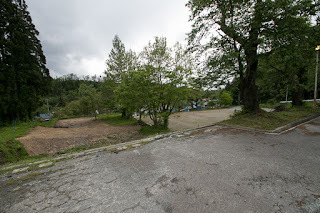 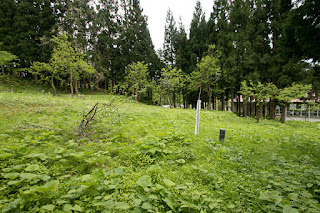 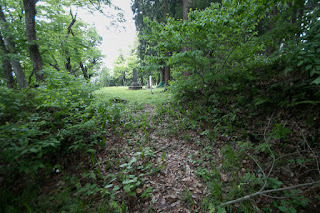 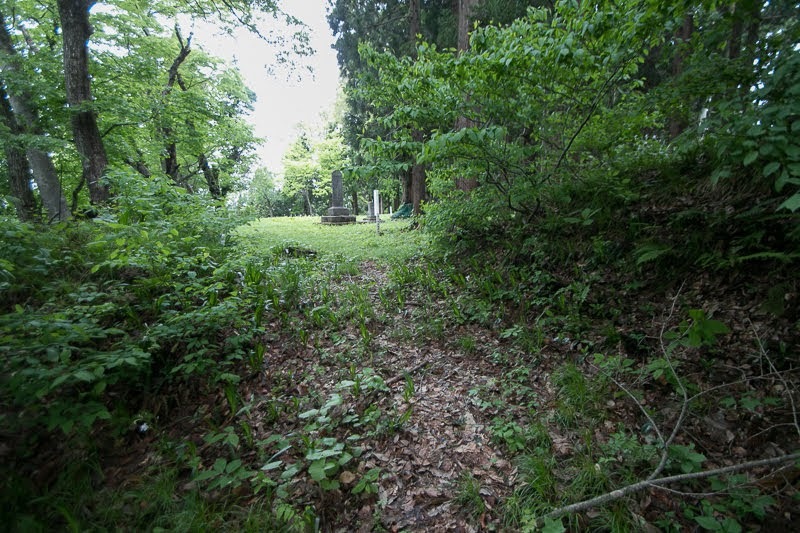 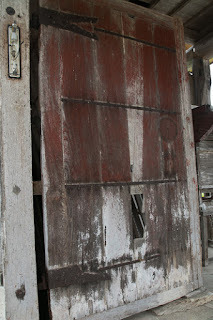 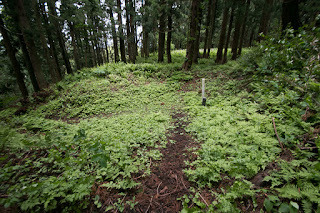 Today no building remains at castle site but three gates were transferred to neighbor temples. 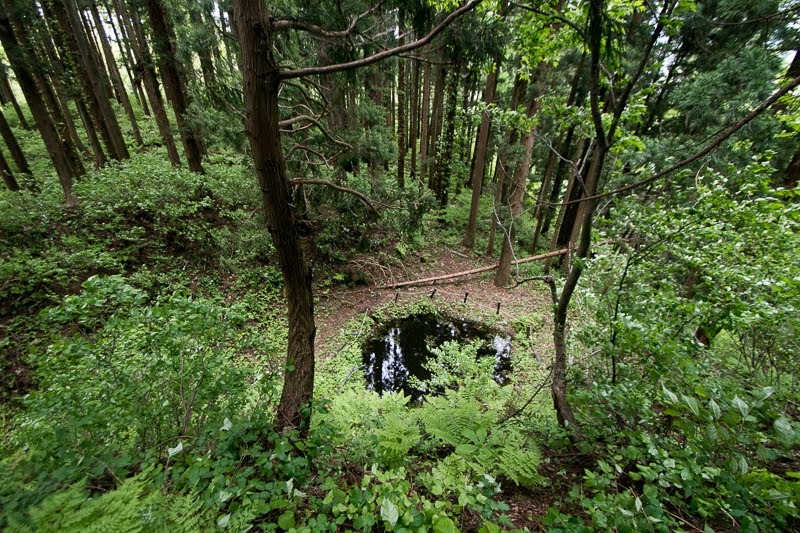 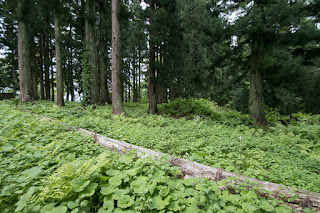 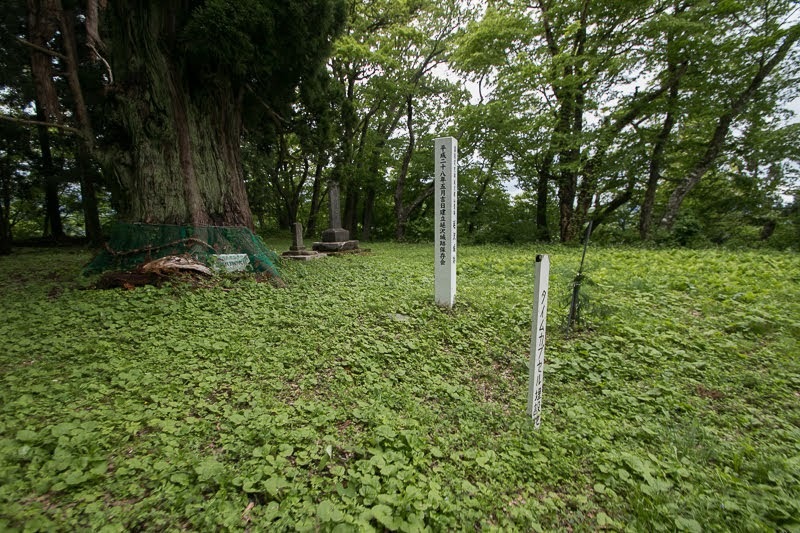 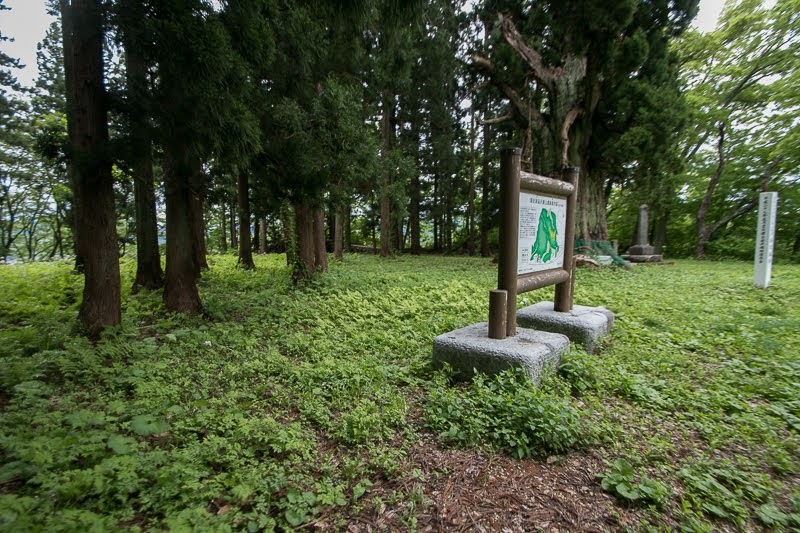 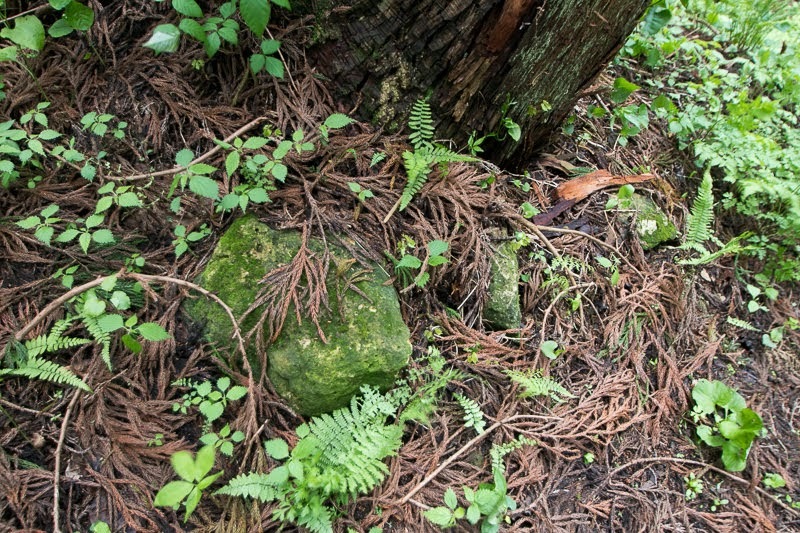 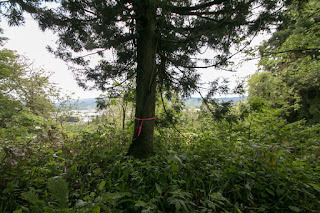 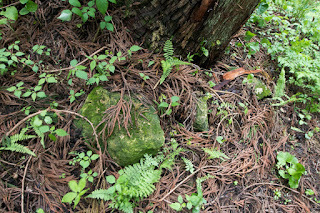 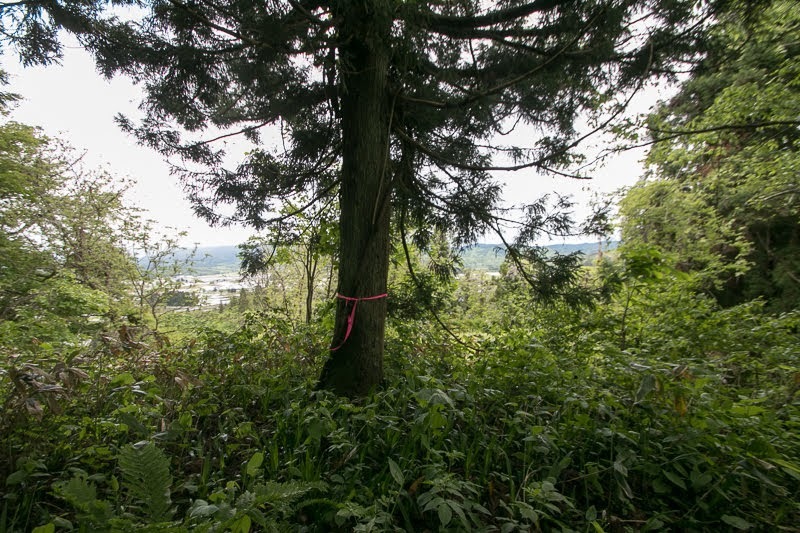 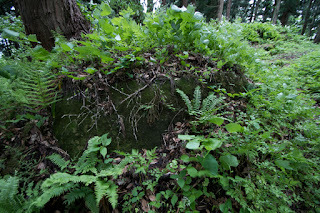 At the central area, an old Japanese cedar tree of over 1,000 years old unchanged remains. 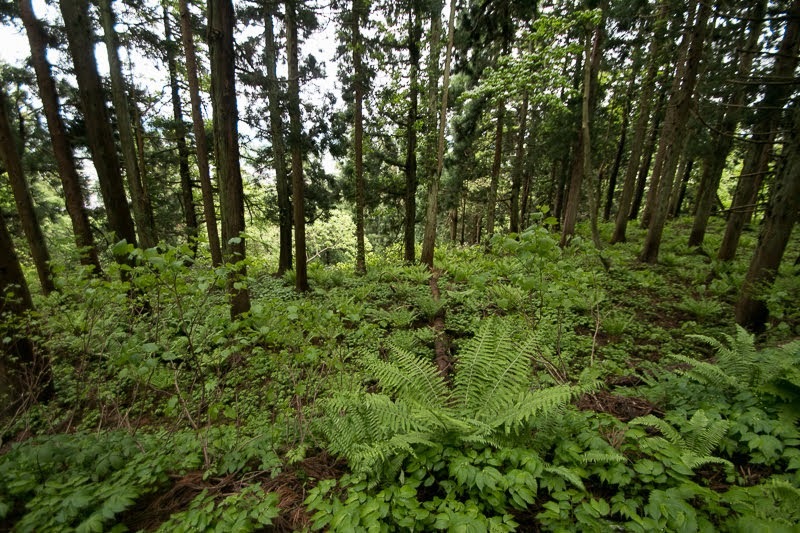 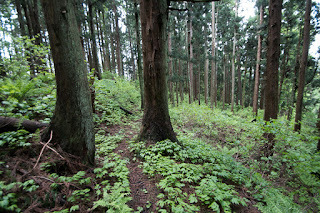 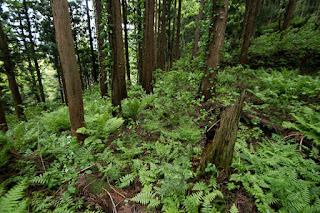 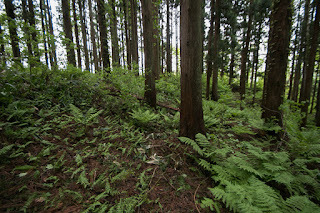 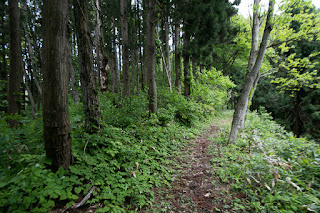 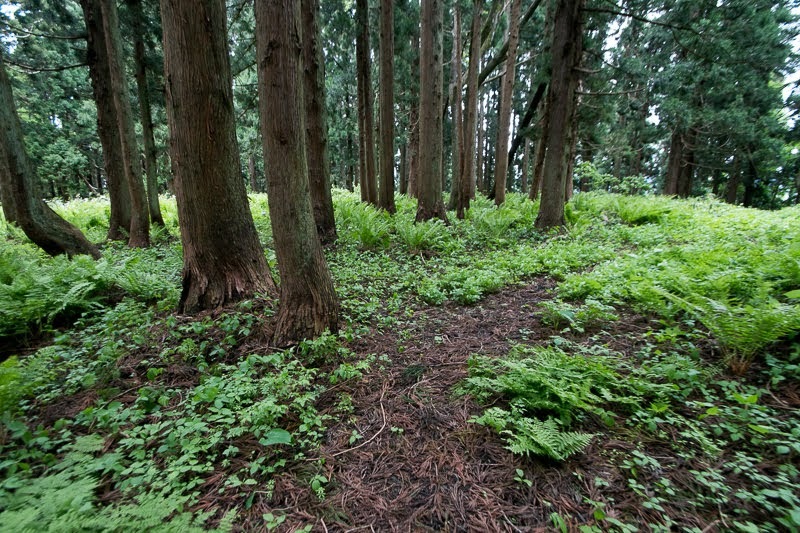 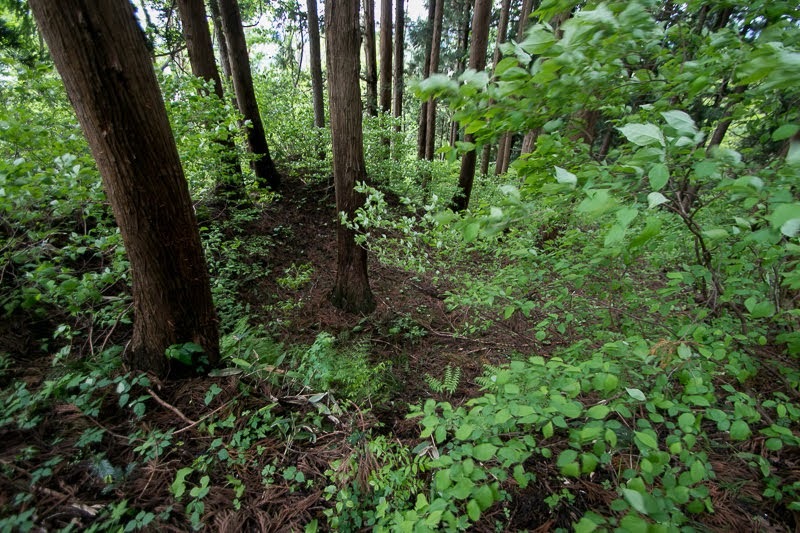 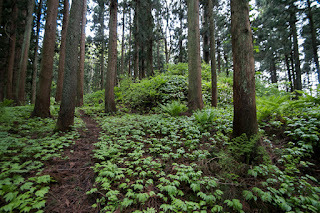 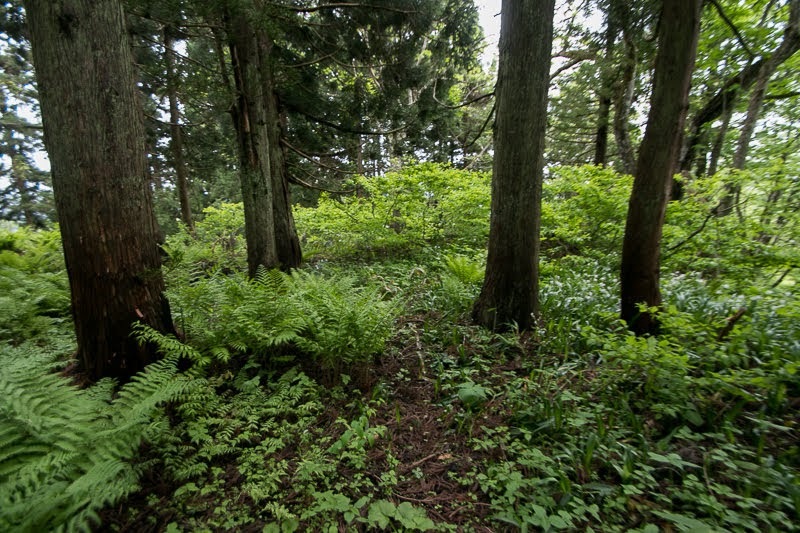 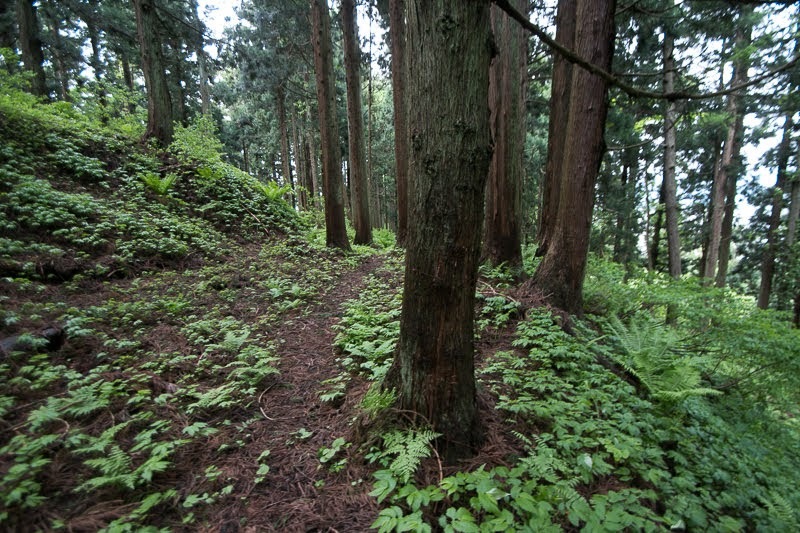 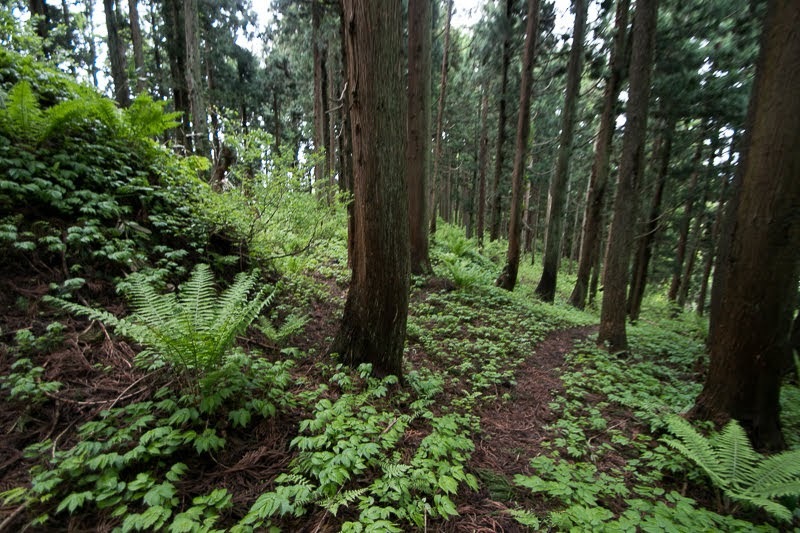 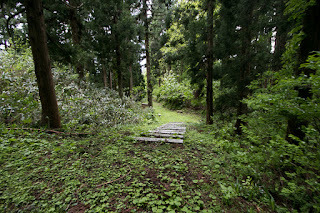 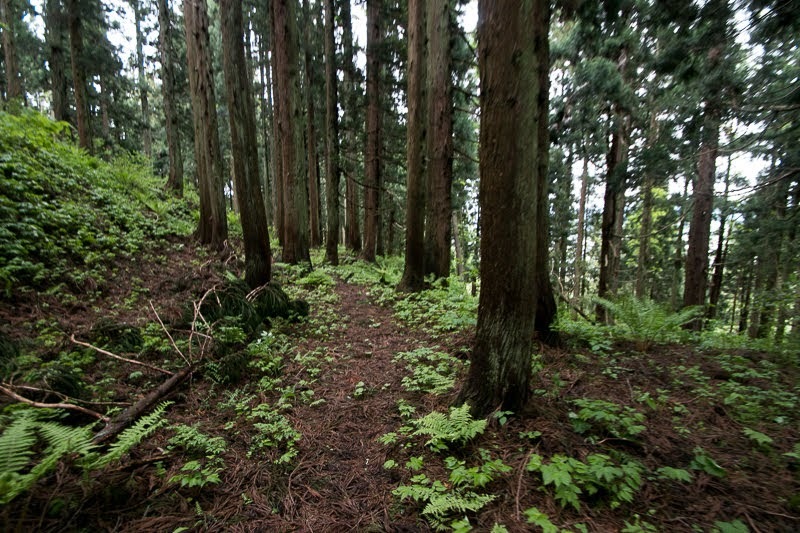 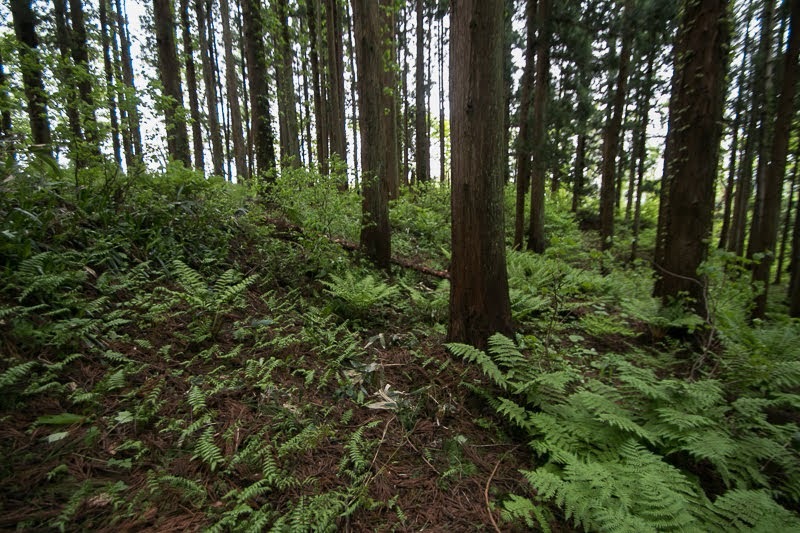 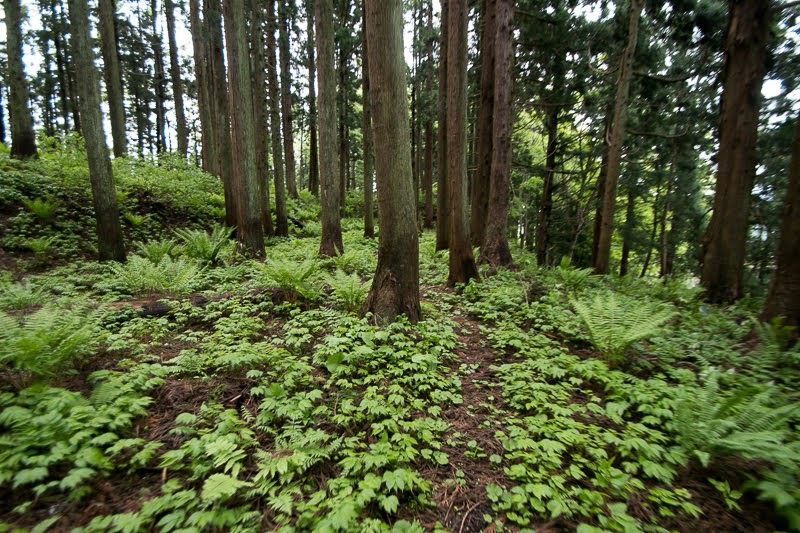 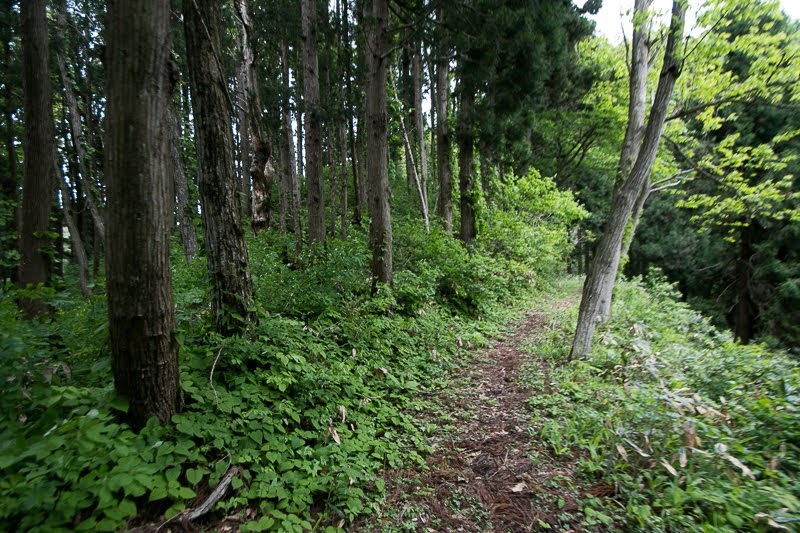 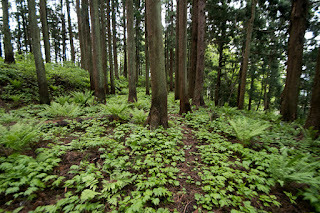 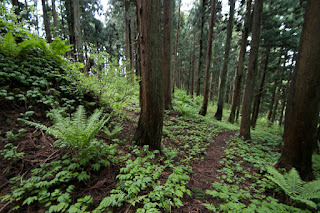 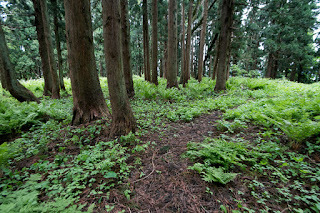 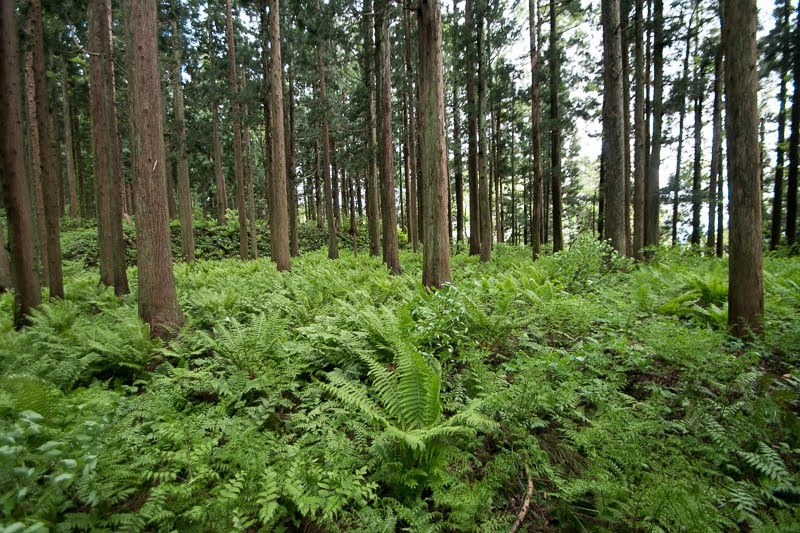 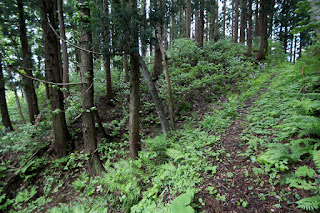 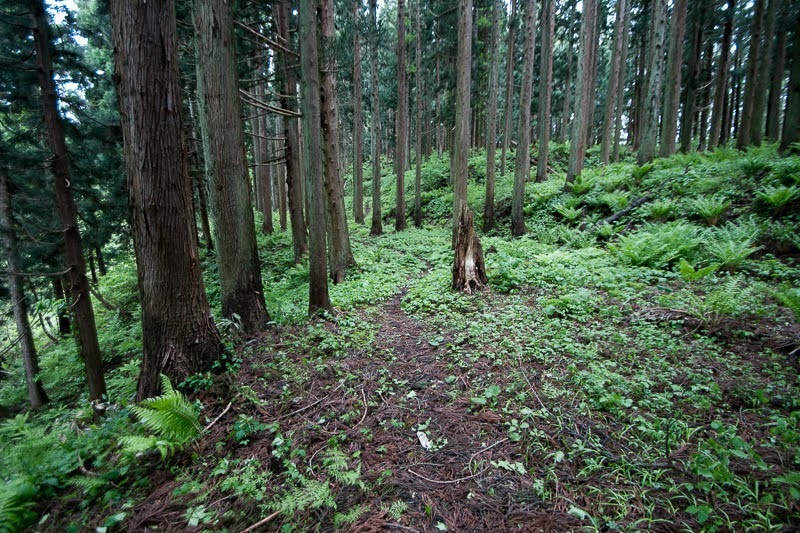 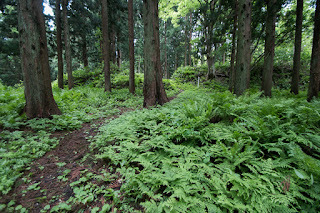 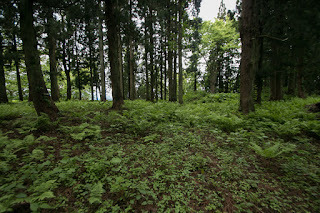 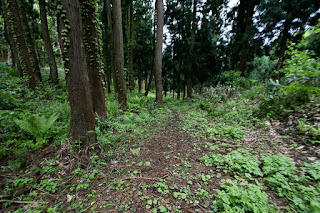 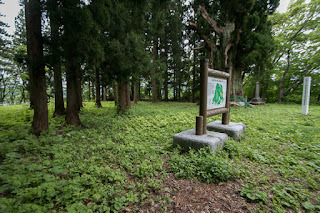 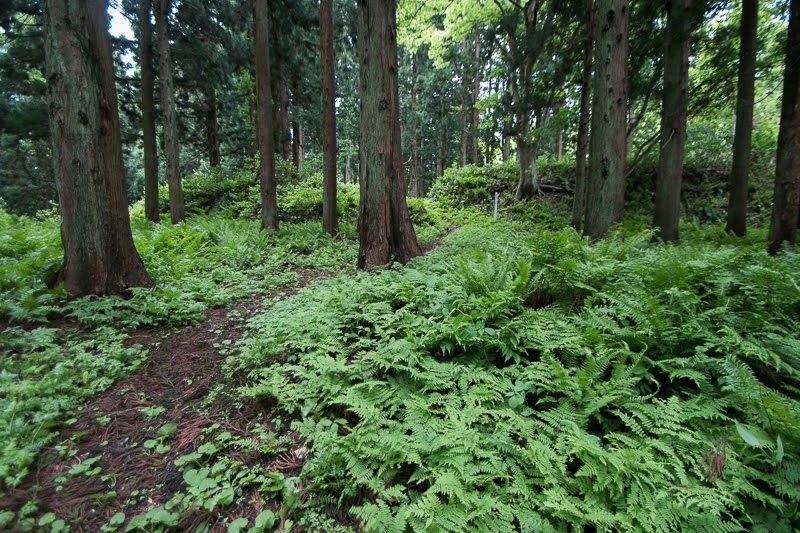 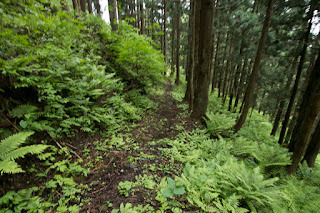 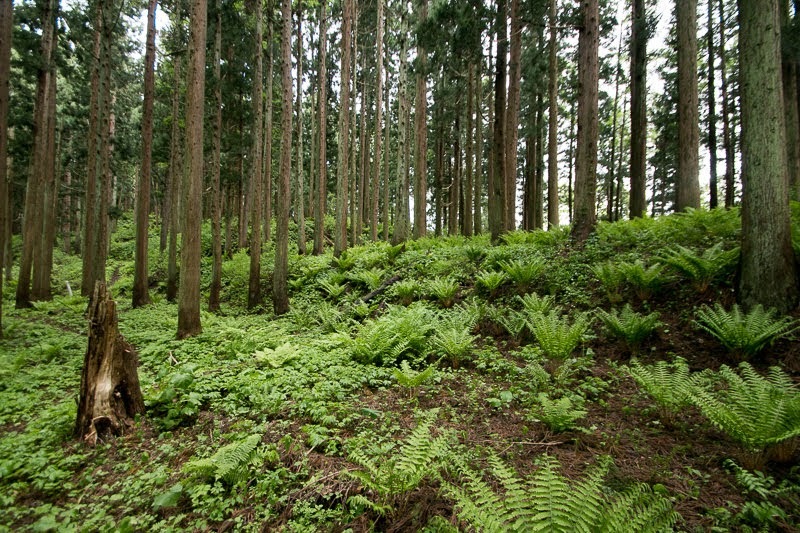 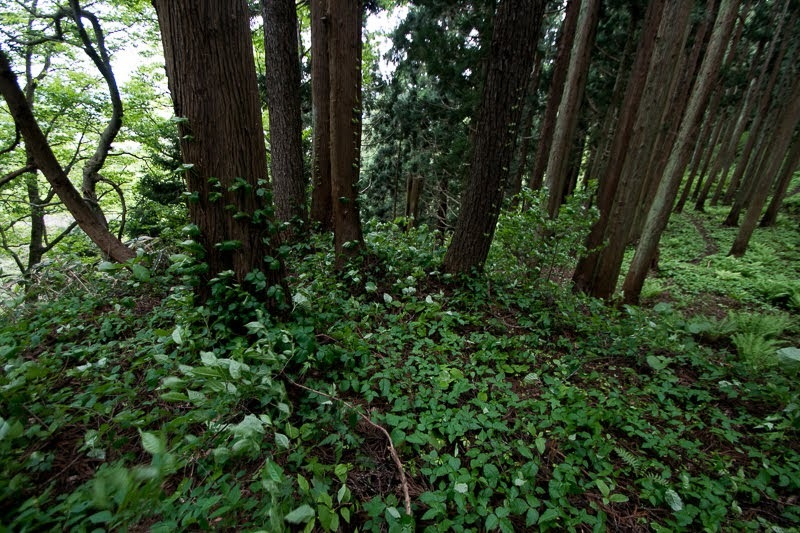 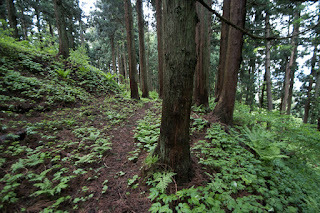 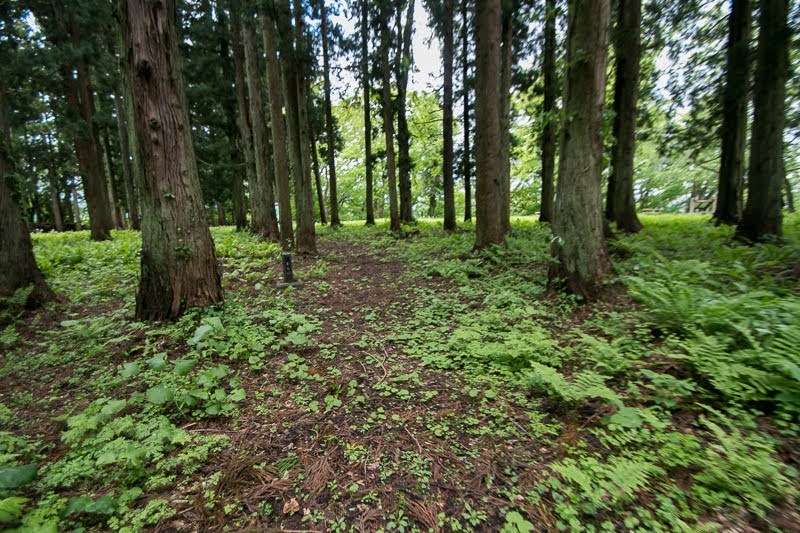 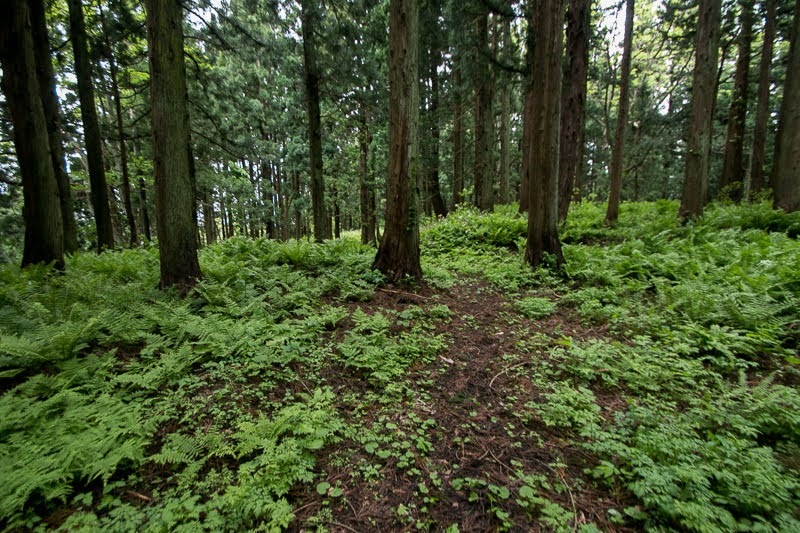 This cedar tree and spa town close to castle site well shows the wealth and strength of Nobesawa clan until now. 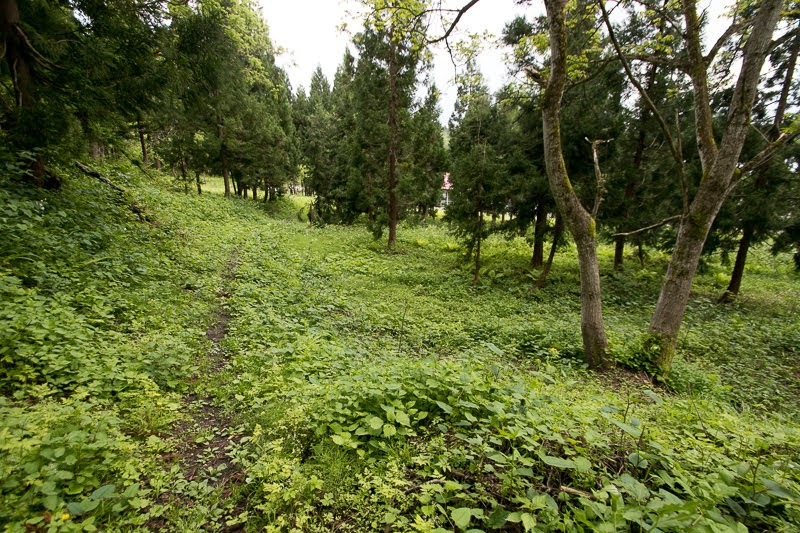 30 minutes drive from Tohoku Chuo Jidoshado Expressway Higashine interchange.